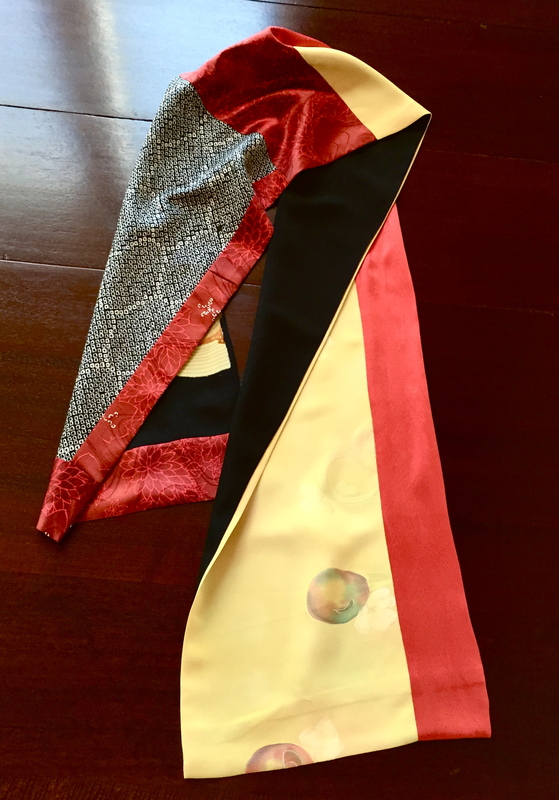 Well, after the To Celebrate Life scarf went to the highest bidder when the auction closed, a disappointed bidder still needed a scarf. So, I made this one. 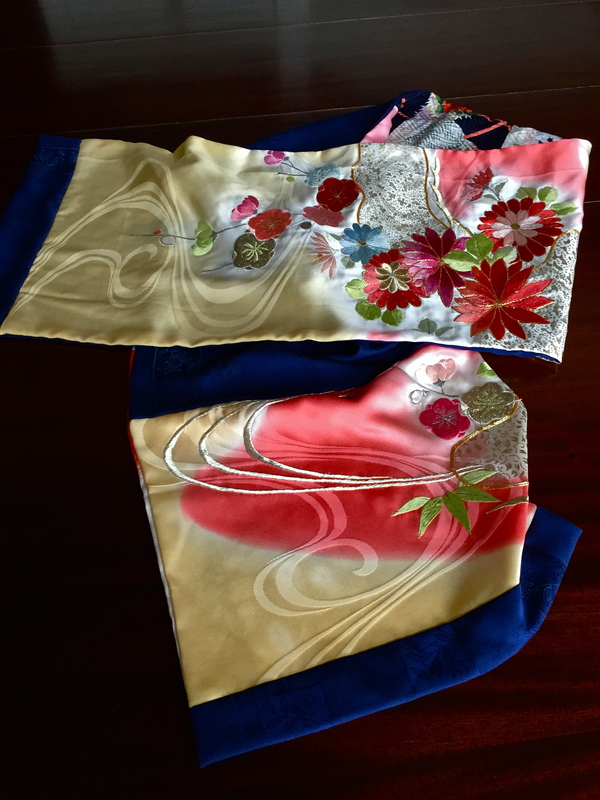 First, a trip to the kimono rack to pick out something really beautiful. This will do nicely! 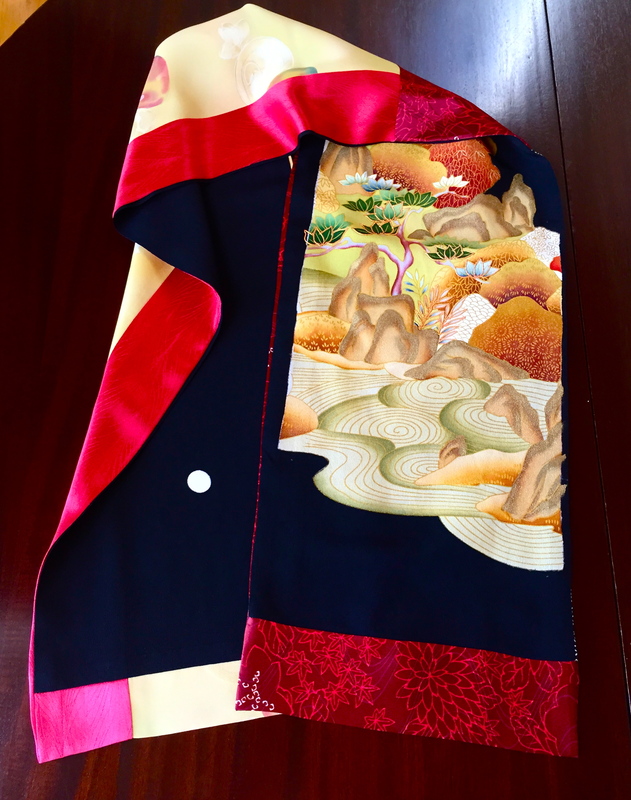 A kurotomesode–a heavily embroidered kimono traditionally worn by married women-from the Ichiroya Flea Market. 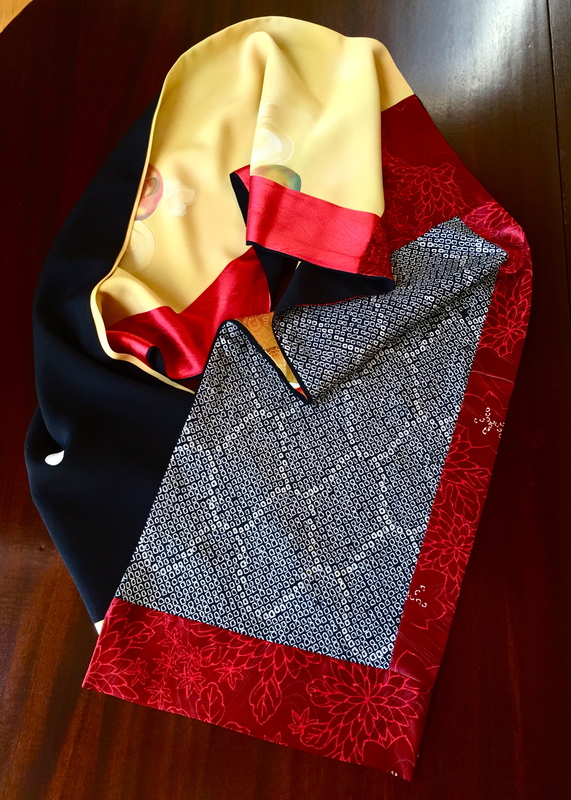 The small circle at the top is a family crest–one of five on the kimono. After taking it apart gently, I need to repair the gold embroidery. 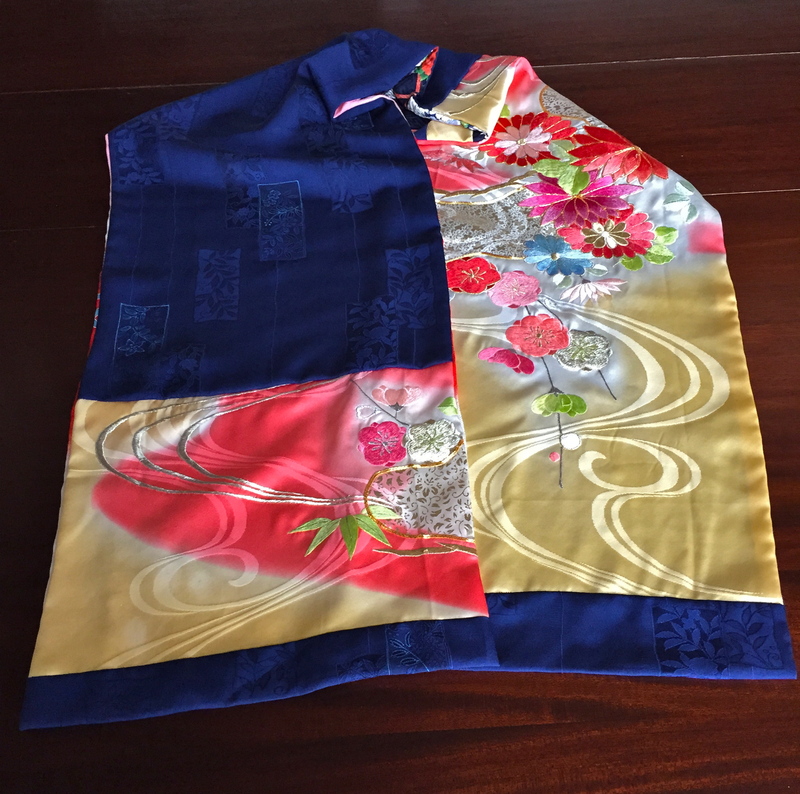 Here’s how the original embroidery looks on the back side, if you’re interested. 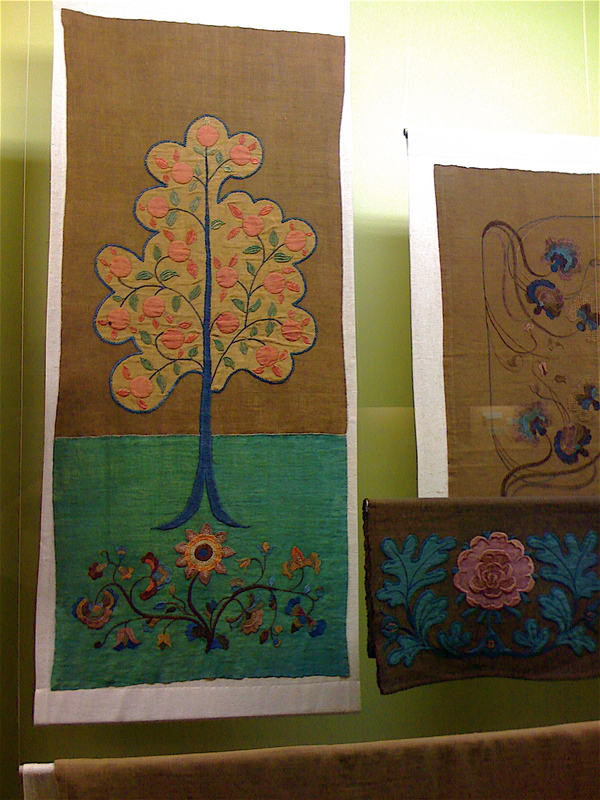 And, while we’re at it, here are the front and back of an embroidered flower. Now that I have the main piece, time to find some pieces that will work with the colors. 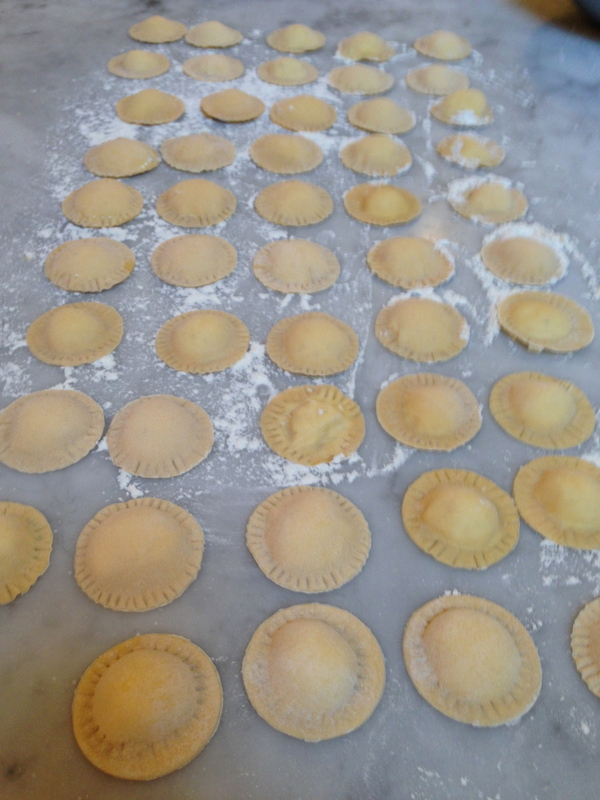 And start to lay them out. And then, start to construct the scarf. 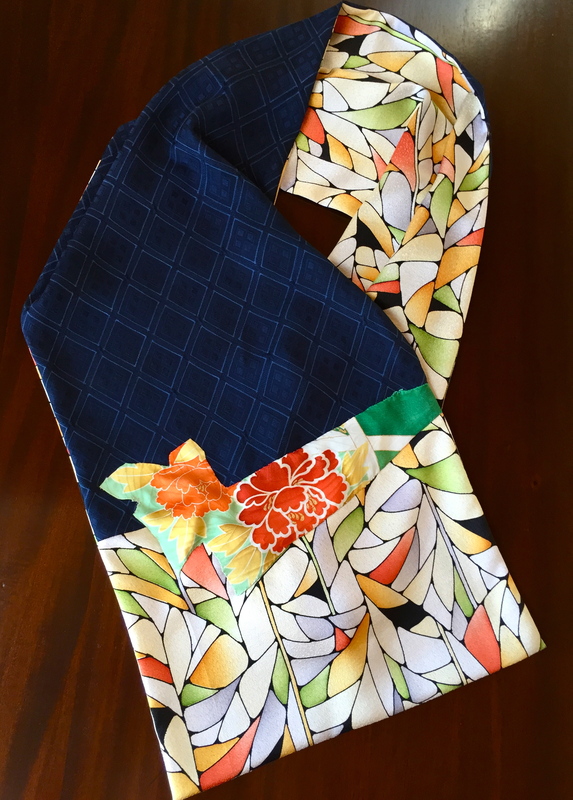 Finish the ends, line with beautiful cream-colored silk with shibori cranes, hand-sew the final seam, and it’s finished! P.S. This all takes a lot longer than it looks like it does. 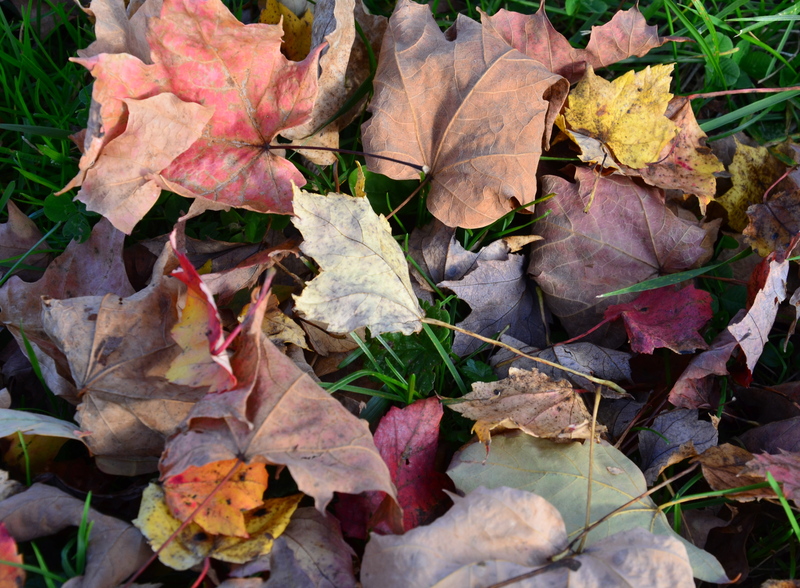 New England is famous for its foliage. 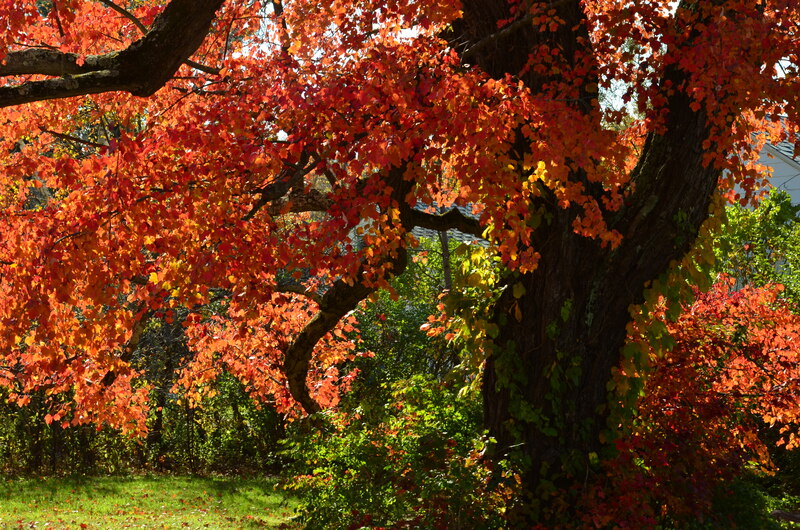 One great spot for leaf-peeping is the Pioneer Valley in Massachusetts. 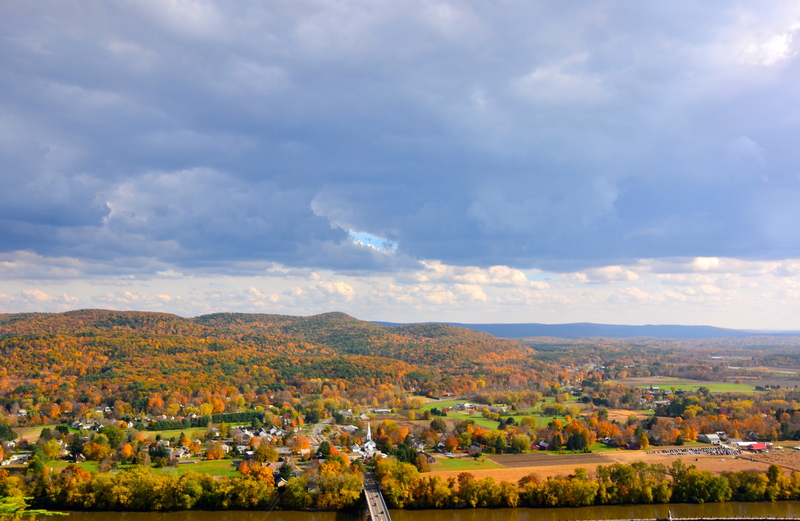 And while you’re there, the Pioneer Valley offers dinosaur tracks, candle making, college visits, historic towns and museums, and lots of other things to do when your eyes are exhausted by color. Your path is along Routes 116 and 5, north and south halfway across Massachusetts. 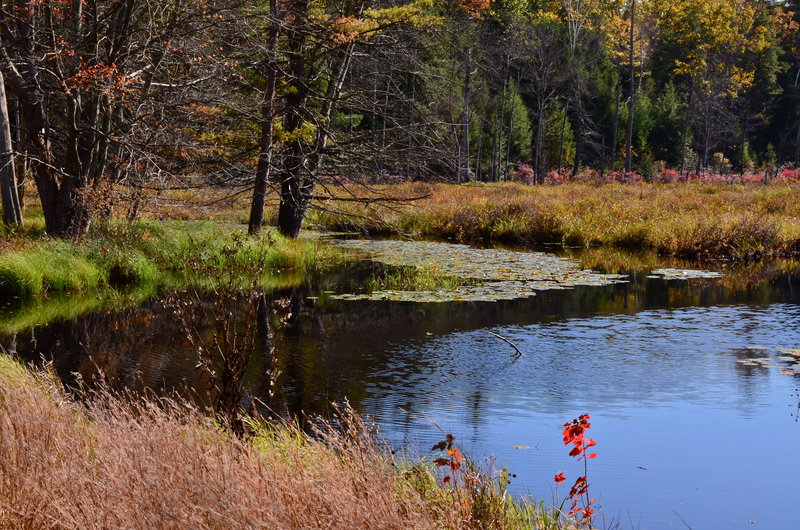 This is an idyllic location for leaf peeping with grand vistas, lakes, parks, and a multitude of deciduous trees. 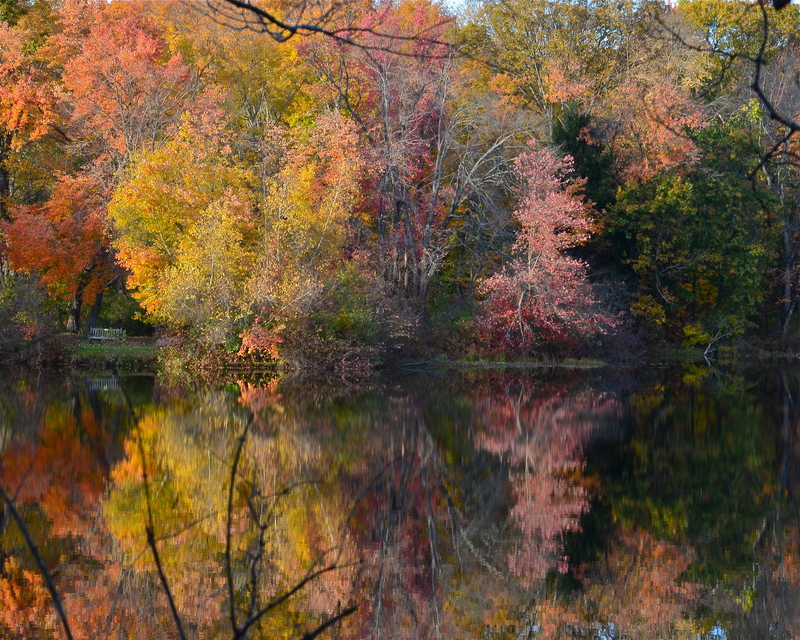 In fact, sometimes the colors are just too much, like this view across Lake Arcadia in Belchertown. 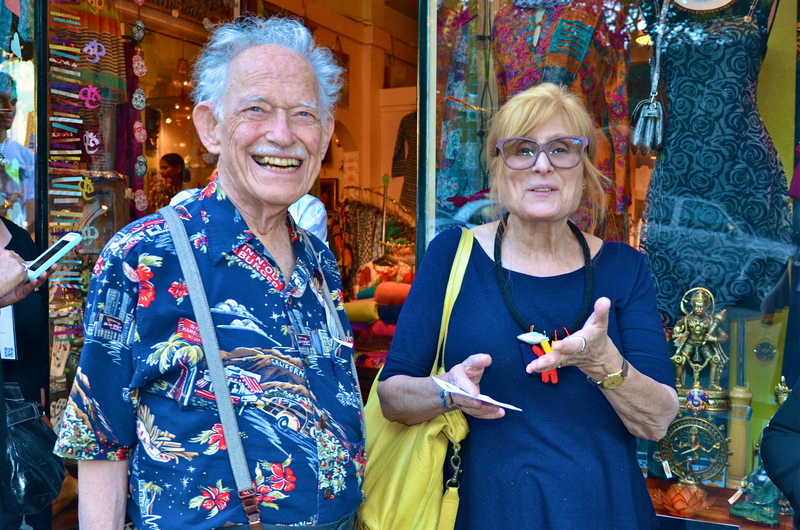 So, you come for the foliage, but there are lots of other things to do while you’re here if you start getting overwhelmed–the way people sometimes do with the art in Florence. There are, of course, the colleges. The Pioneer Valley is home to five outstanding colleges: Mount Holyoke (women), Smith (women), Amherst, Hampshire, and UMass Amherst. You can choose the school that suits your personality and sense of beauty, but take classes at any of the five schools. The PVTA bus links the campuses. They are among the most beautiful classic colleges you will ever see, with trees, lakes, old brick buildings. This is at the lovely Mount Holyoke, the first of the famous “Seven Sisters” of the Ivy League. Maybe you’re not ready for college yet, or you’re finished with that phase of life, then how about dinosaur tracks? The Pioneer Valley was once home to small herds of roving carnivorous dinosaurs who left footprints in the sandstone 190 million years ago along what was a subtropical swamp. 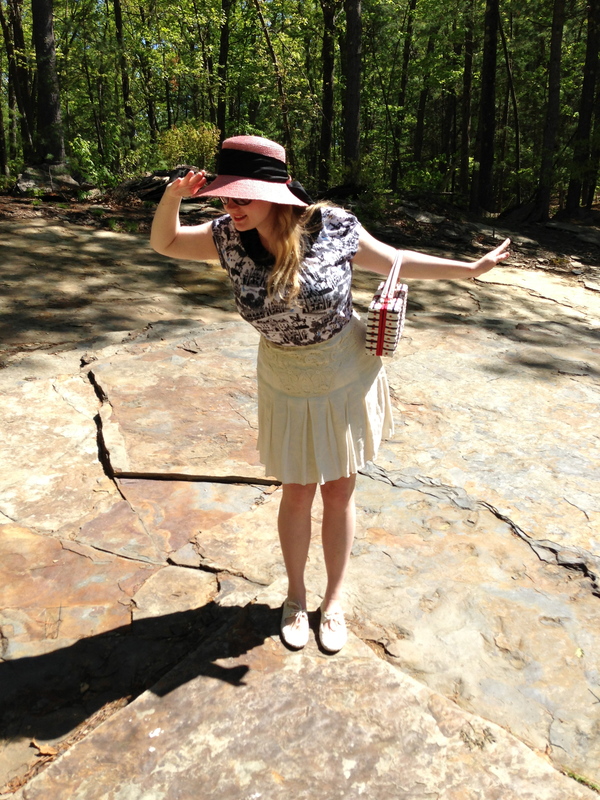 One place to see them is called, appropriately enough, Dinosaur Footprints. 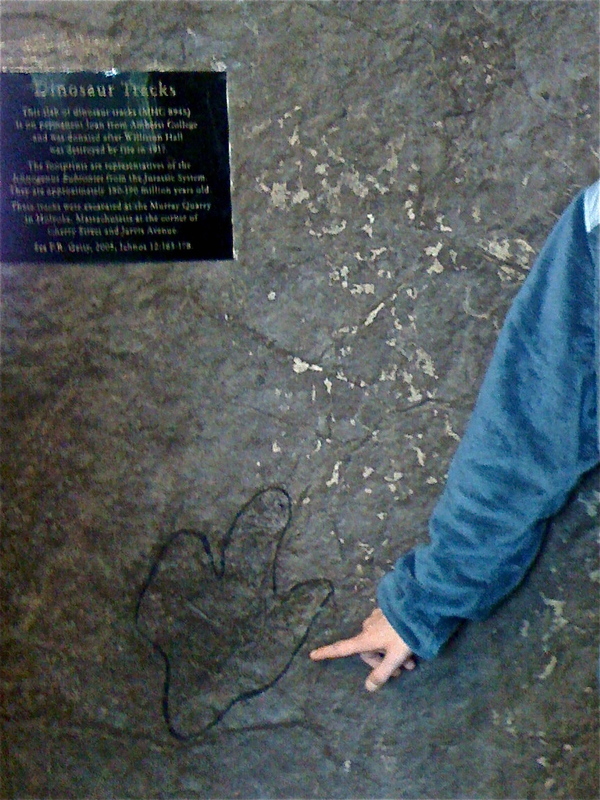 This is the first place that dinosaur prints were scientifically described and the very tracks are still here to be seen. You park along Route 5 in Holyoke and then take an easy walk north from the entrance to the footprints. Dinosaur Footprints is open daily April 1 to November 30, sunrise to sunset. 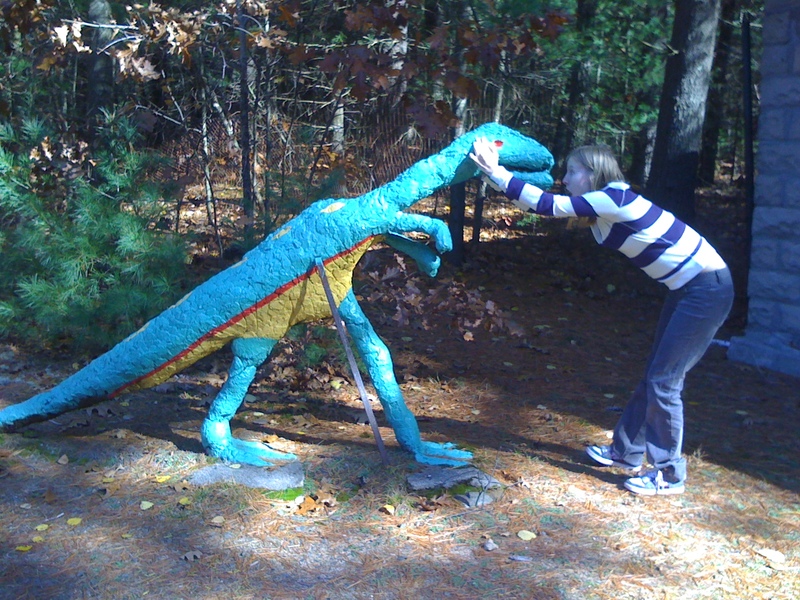 If you would like to OWN a dinosaur footprint, then the place to go is Nash Dinosaur Track Site and Rock Shop, formerly known as Nash Dinosaurland, off Route 116 in South Hadley. This is an eccentric shop full of reasonably priced dinosaur footprints that the family has carved out of the rock formation in the backyard. You can get an innie or an outie footprint. For a minimal price ($3.00 adults/$2.00 children) you can walk out on the rocks to see where the tracks come from. Nash Dinosaur Tracks is open 12-4 on Sunday, 10-4 Monday-Saturday except Wednesday, when it is closed. Here is a nice history of the discovery of dinosaur tracks in North America–starting only a mile from Nash Dinosaur Tracks. 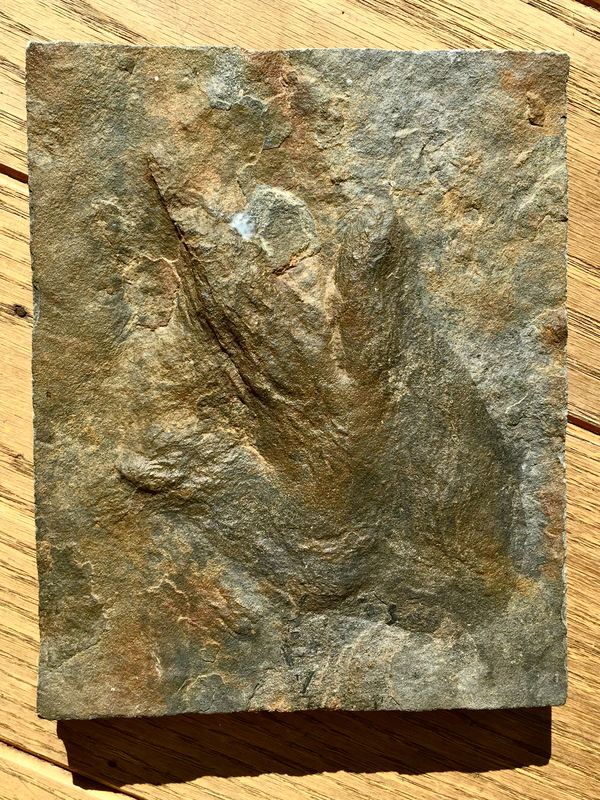 A dinosaur footprint is an excellent graduation gift for your student in the Pioneer Valley. Or a gift for any reason. 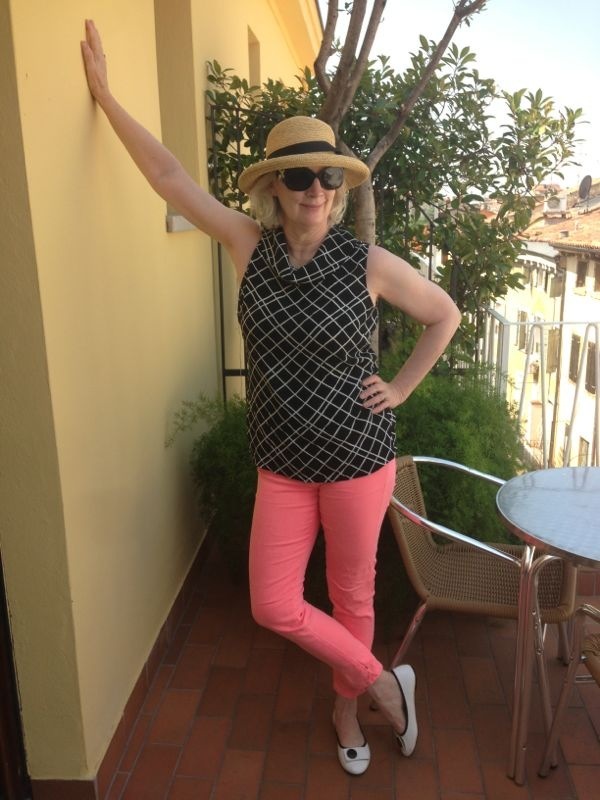 Here’s mine–it’s an outie. Some of the colleges have dinosaur tracks on display as well. Amherst has the first specimens to be found in the Valley. Here is a wall at Mount Holyoke. Emily Dickinson lived in this house in Amherst for her entire life, except for a few homesick months she spent down the road at Mount Holyoke College. 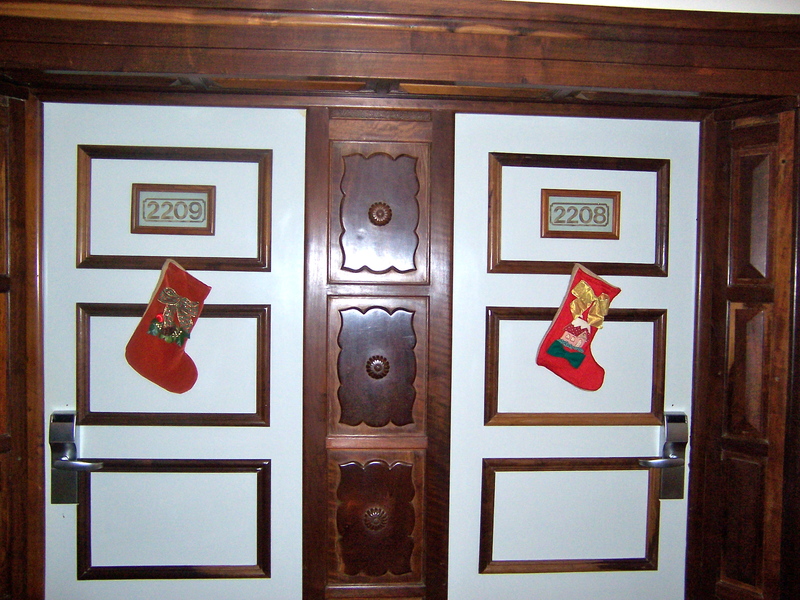 You can take a guided tour of her house from March through December, Wednesday through Sunday. There are several different options for tours, including one that visits her brother’s house next door. It is fun to walk through the garden and see the views and hear the birds that inspired her poetry. Prices vary from $5 to $12. 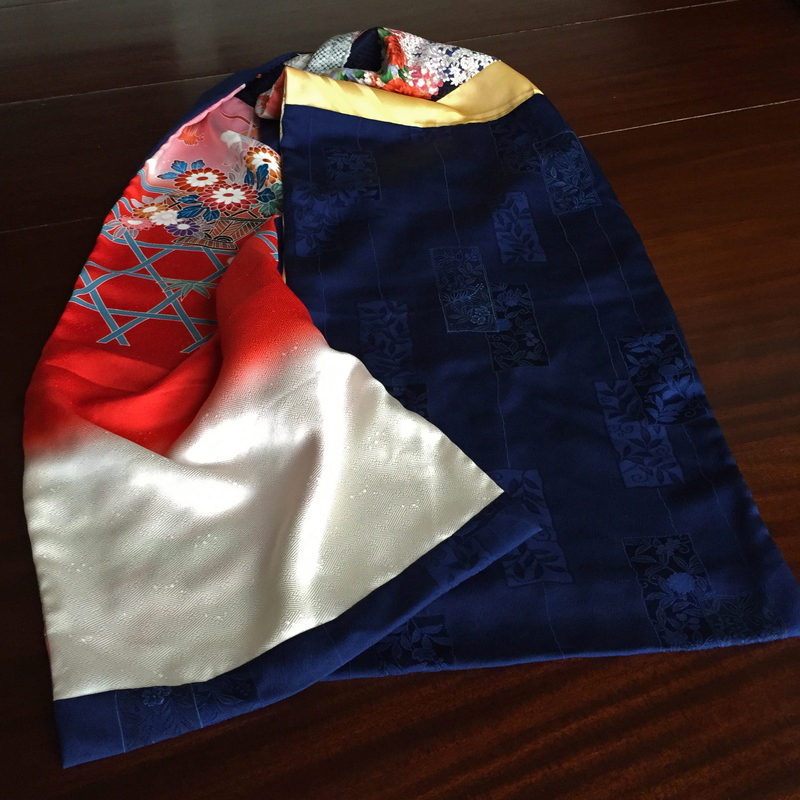 For more information, see here. As you drive north on Rt. 116, you will drive by this mountain between the Southern Pioneer Valley, where the colleges are, and Deerfield. Drive to the top and take a look at Mt. 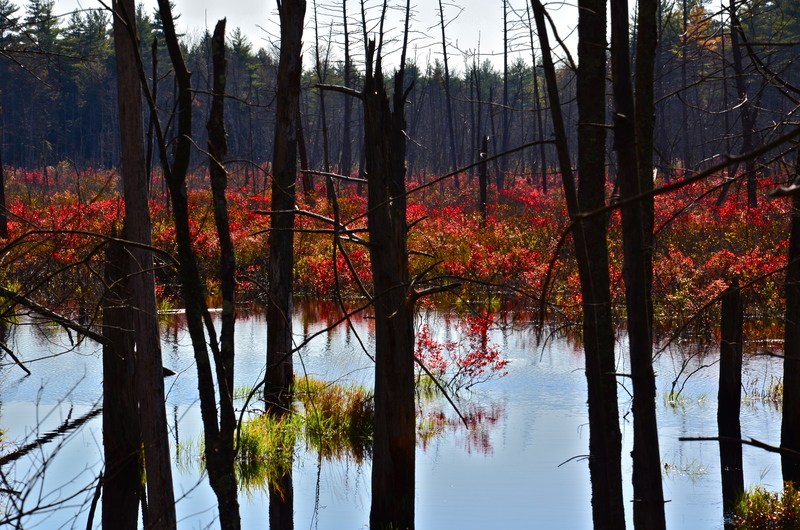 Sugarloaf State Reservation. When Rt. 116 runs into Rt. 5, head north on 5. 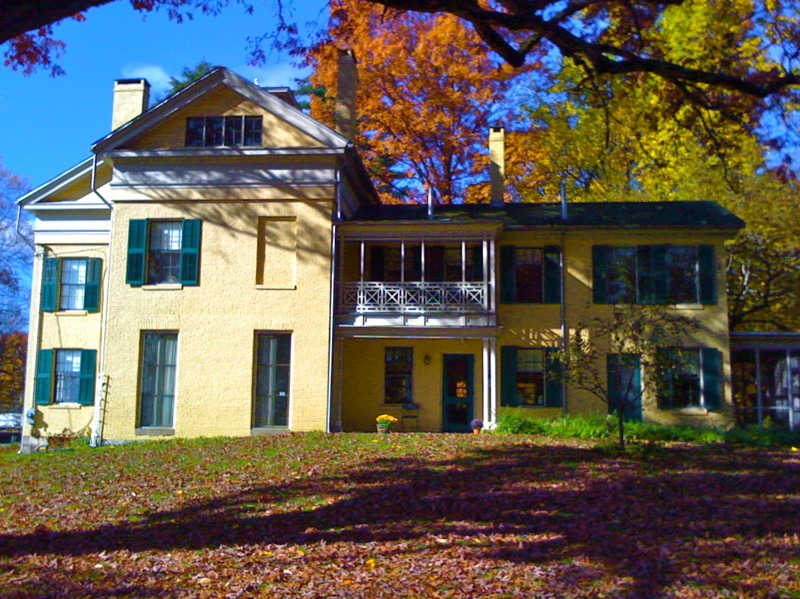 One nice change of pace from the leaves is Historic Deerfield, an outdoor history museum made up of 12 houses ranging from 1730 to 1850 situated at the crossing of the Deerfield and Connecticut rivers. Eleven of the houses are on their original sites. With your admission, you can take either a guided or self-guided tour of each house. The houses that require guided tours run them at different times so you have to keep you eye on your watch and dash from house to house so as not to miss the tour. The guided tours do give a wonderful history of the occupants and draw one’s attention to architectural detail that might otherwise be missed. There are furnishings, including handmade coverlets, handpainted wallpapers, and odd furniture, the purpose of which must be puzzled out. One of the houses is home to an extensive silver and metalware collection, including work by Paul Revere. Here is a map of the village. The homes are open during the “regular season” daily mid-April through late December, except some holidays, from 9 a.m. – 4:30 p.m. Check your dates before going. During the regular season, admission is $14.00 for adults, $7.00 for youth (6-17), and free for under 6. Tours can sometimes be made by appointment during the winter. No photography in the houses. 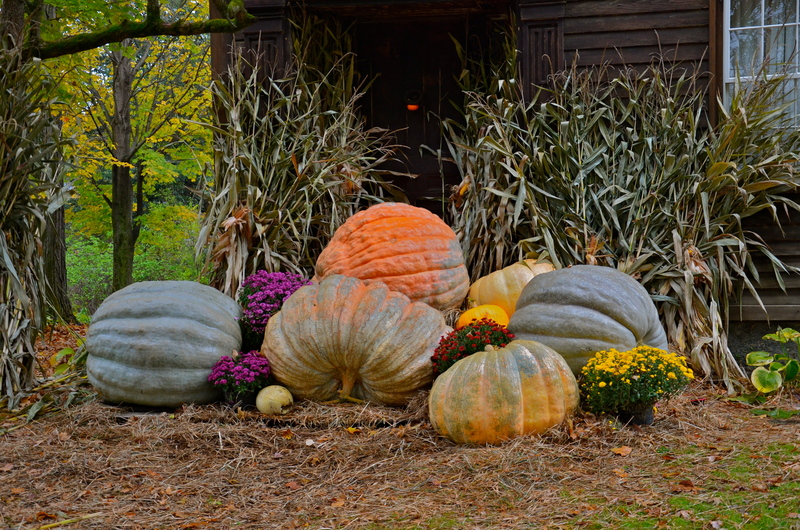 Even the non-historical houses on the street go all-out with autumn decor. 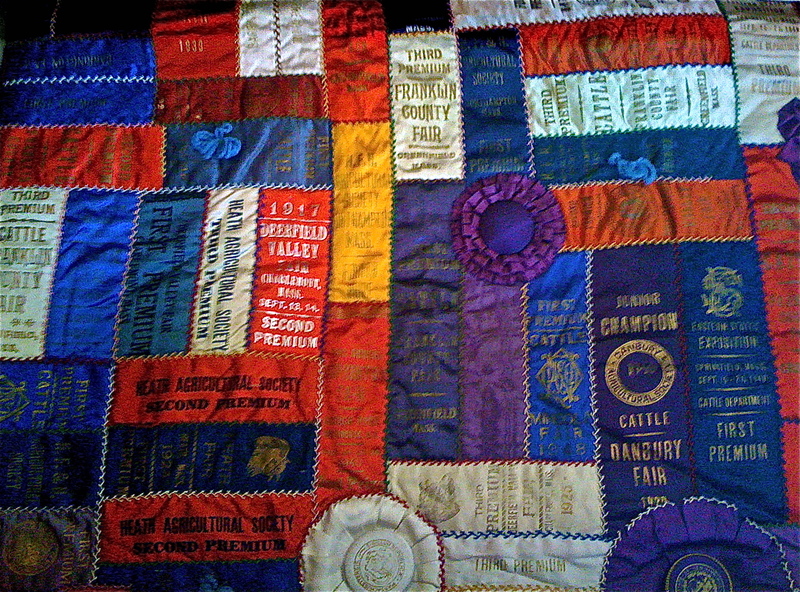 While in Deerfield, don’t miss the Memorial Hall Museum, right around the corner. 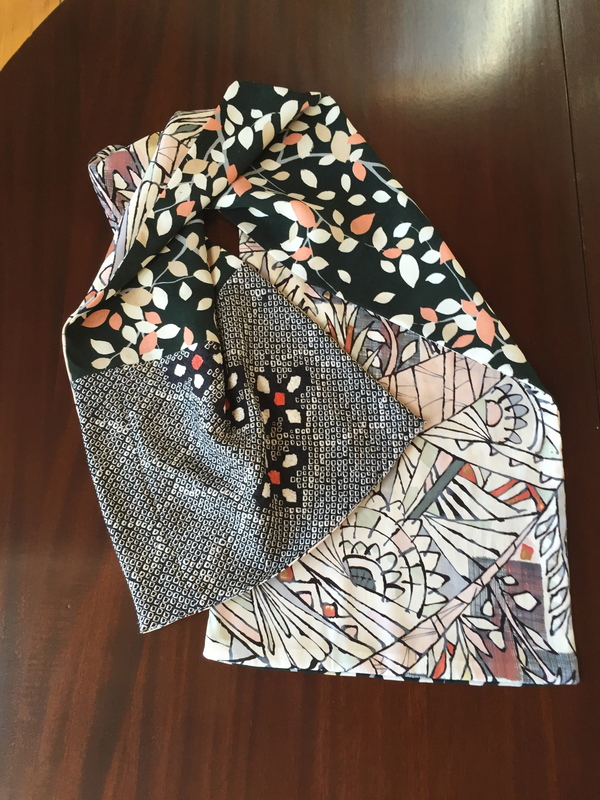 It is a history museum with exhibits such as a door showing a Native American attack, pictures of prize cows, and, my favorite, textile work. 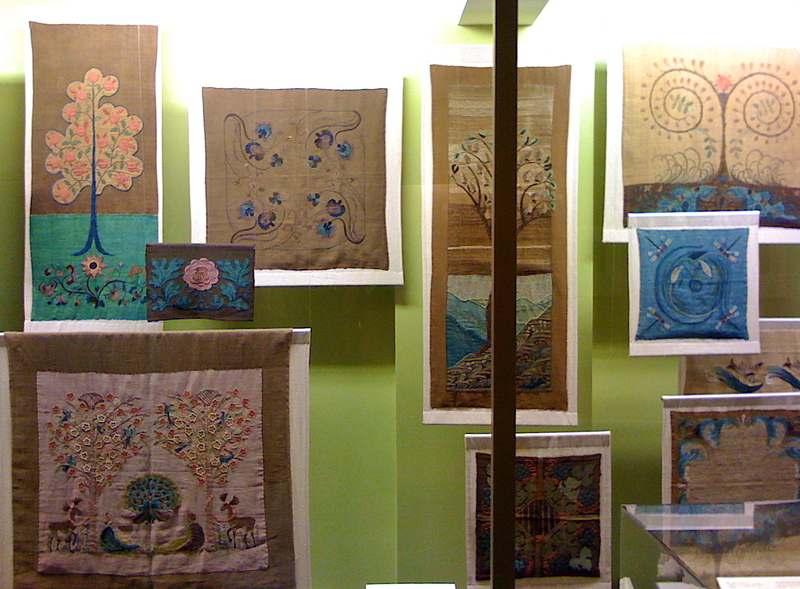 There is a form of embroidery known as “Deerfield Embroidery” and many examples are on display. The Museum is open for weekends in May, then June through the beginning of November it is open Tuesday – Sunday, 11 a.m. – 4:30 p.m. Admission is $6.00 for adults, $3.00 for students (6-21). 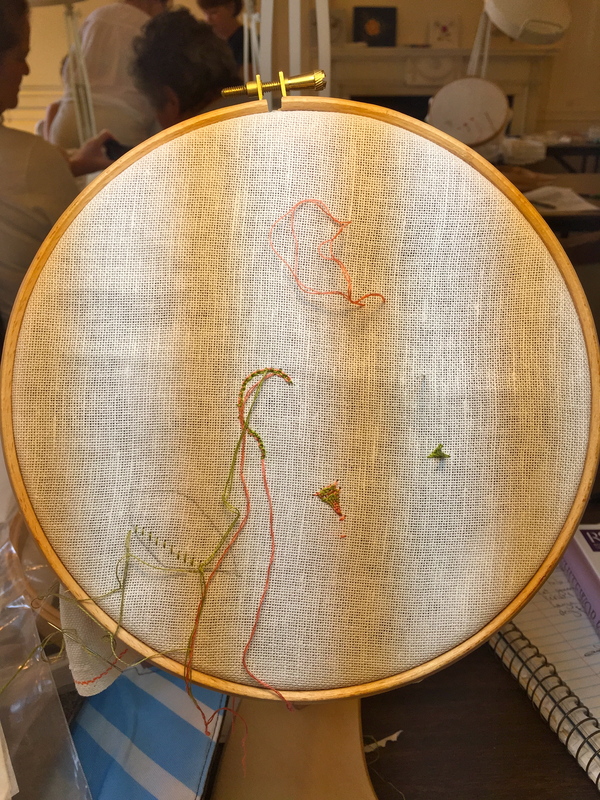 The tiny shop includes embroidery kits – both crewel and cross-stitch. These are also available online here and here. Okay, we have to say it. Everybody goes to the Yankee Candle Factory in South Deerfield once. 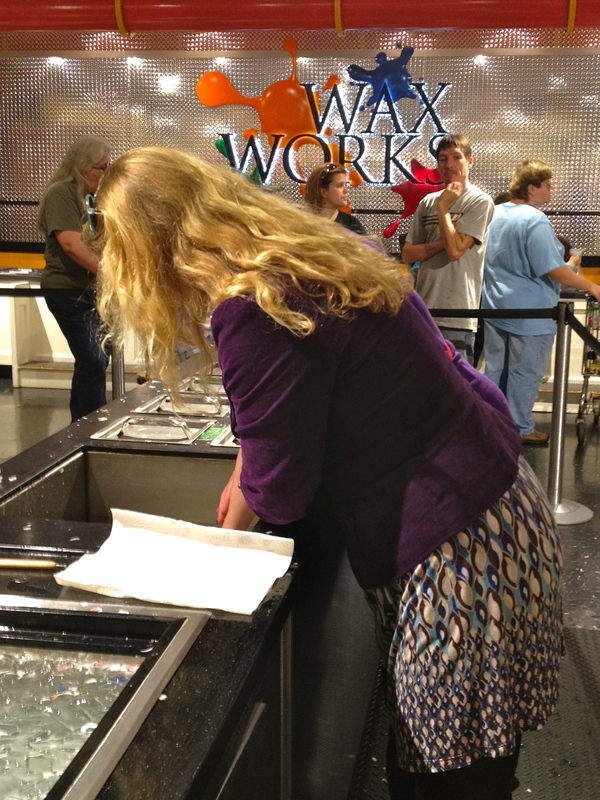 You’ve got to take your opportunity to cast your hand in wax, dip a candle in multiple colors, buy a Christmas ornament or Polish pottery. It’s loud, it’s crowded, it’s touristy. But, okay, it’s kind of fun. 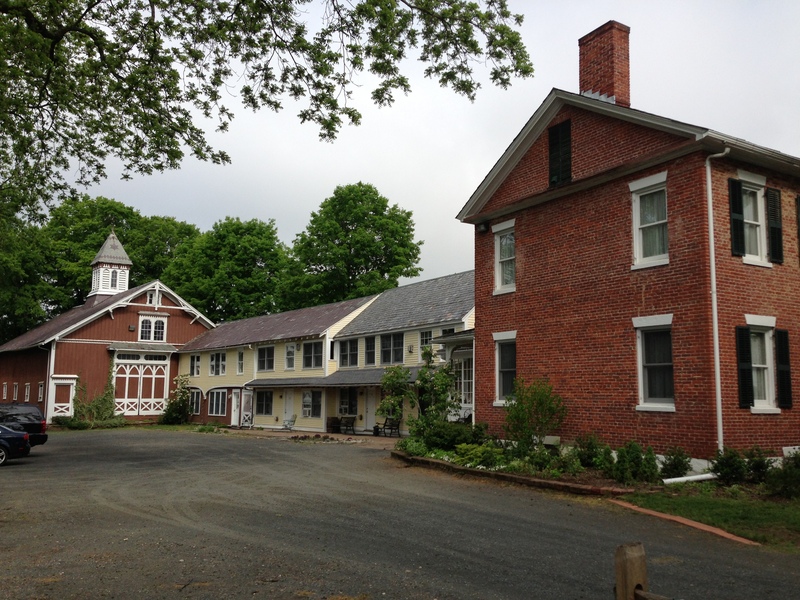 We love the Black Walnut Inn in Amherst. Each room is different and welcoming and a little bit eccentric. We adore creeping up the narrow stairs to the Carhart Room, built in 1745, where the original family slept. Breakfast is outstanding. 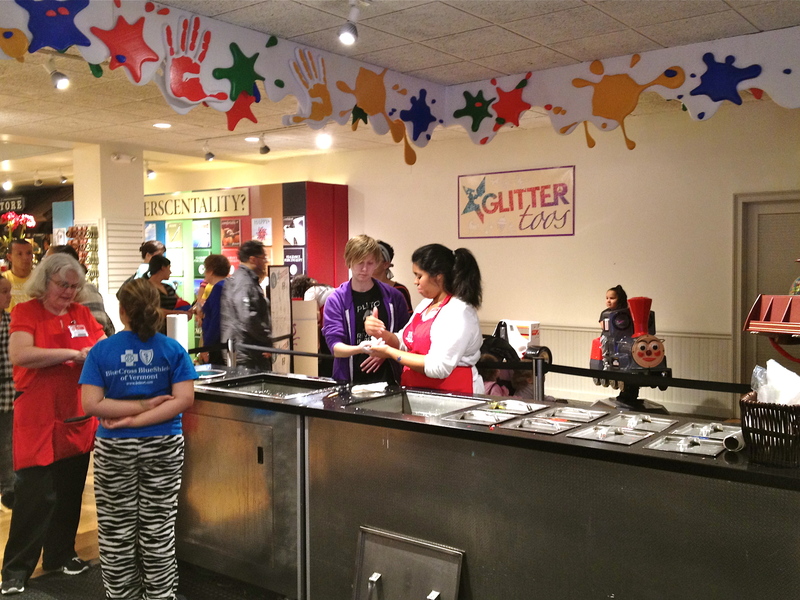 This is where I discovered Red River cereal, but there are lots of other, more indulgent, homemade treats available. 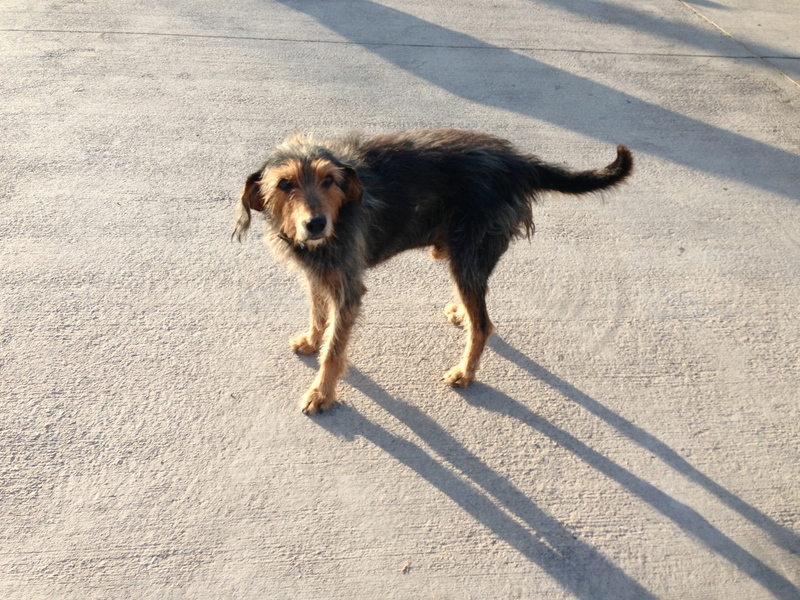 The innkeeper, Marie, is friendly and warm. There is always at least one dog. Our favorite is Nutmeg. Another alternative is renting a cabin from vrbo. 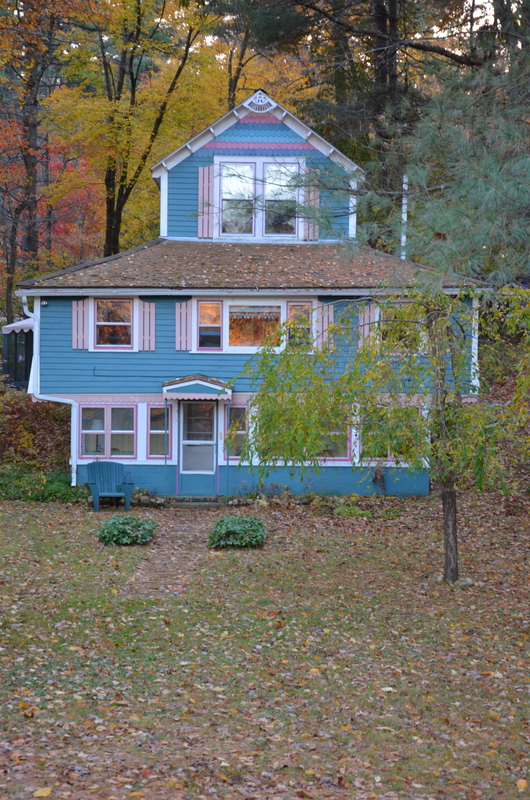 Here is cozy Abigail’s Cottage in Belchertown, right across from Lake Arcadia–a great place for a family reunion with gorgeous views of foliage. 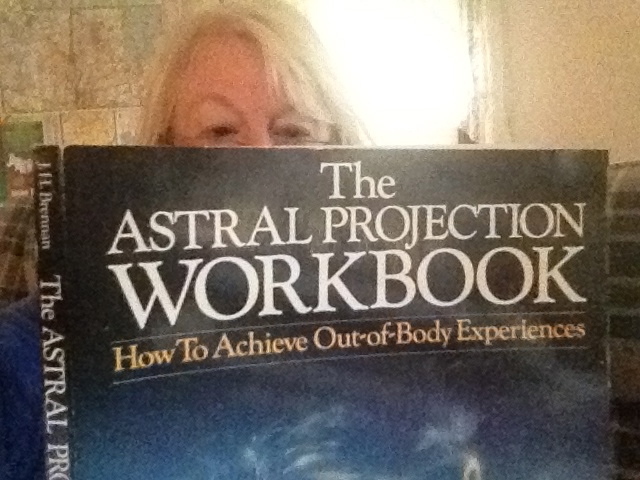 It also features oodles of unusual reading material. 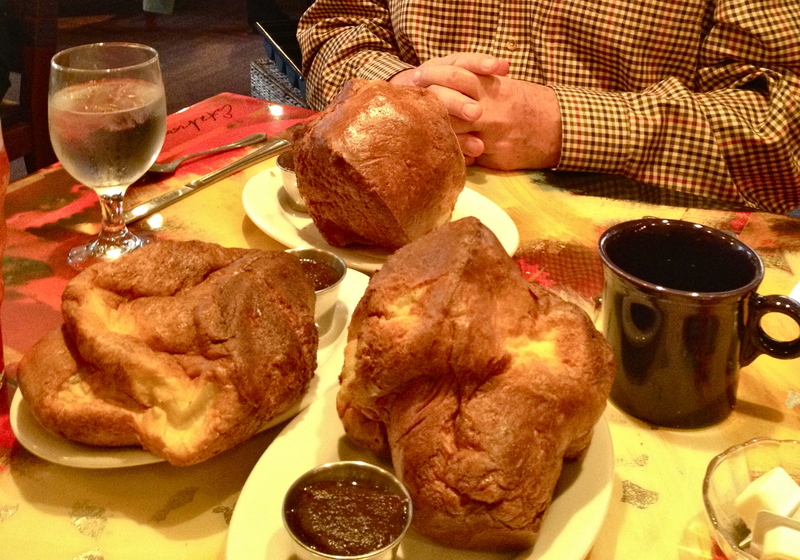 You can’t miss Judie’s in Amherst, home of the most outstanding popover ever, cheerful painted tables, and a colorful decor featuring work by artist in residence, Donna Estabrooks. Another favorite is the Amherst Brewing Company, a casual restaurant which serves seasonal craft beer and delicious comfort food. 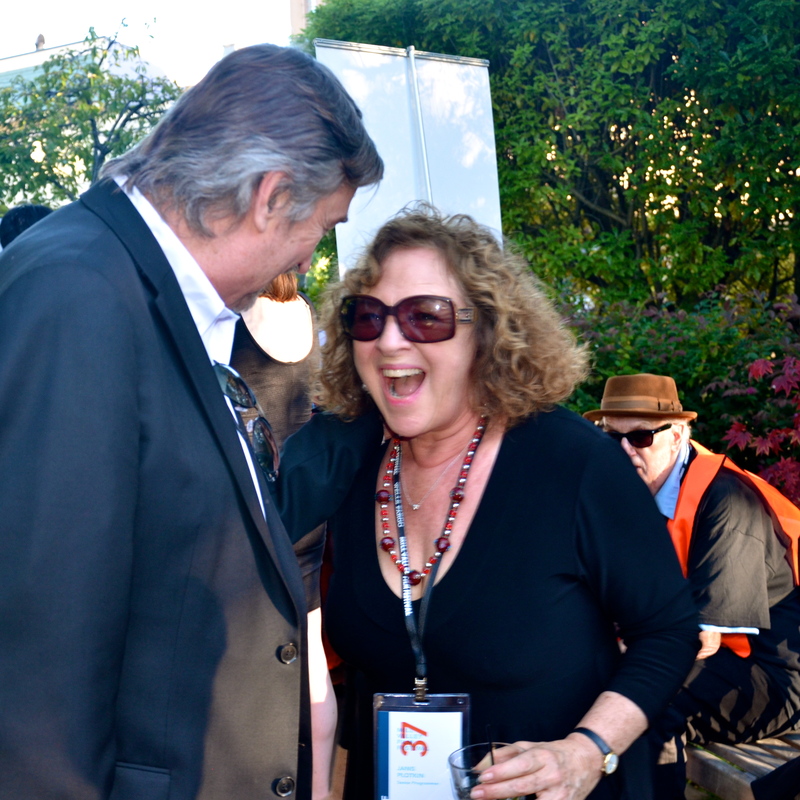 The 38th annual Mill Valley Film Festival is underway and it is a celebration of directors this year. 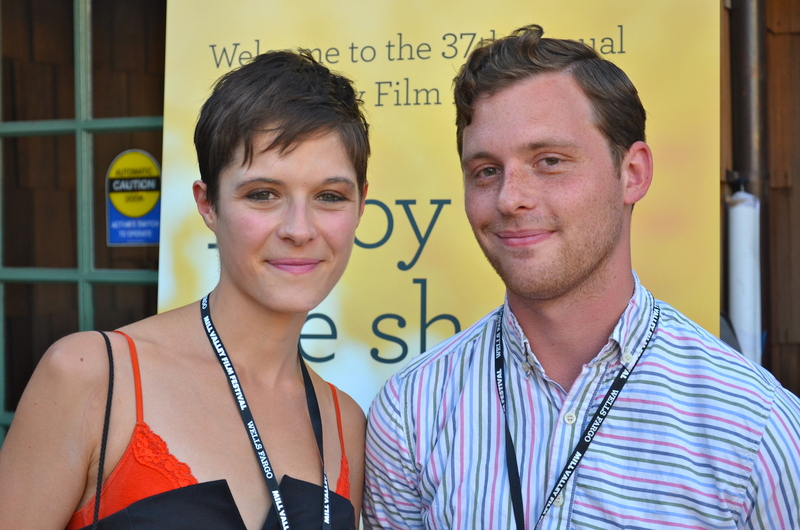 Opening night brought us the two Toms. 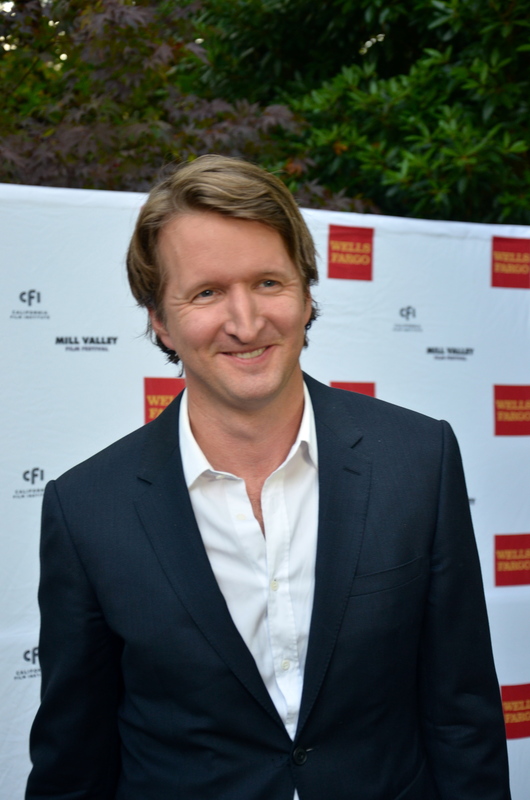 First came Tom Hooper, Academy Award winning director of The King’s Speech, with his new film The Danish Girl, starring Eddie Redmayne. Mr. Hooper is a very tall man. 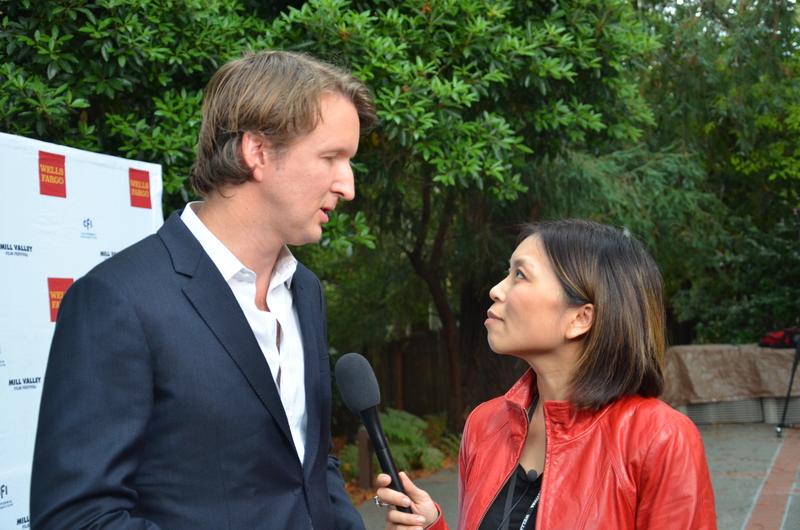 Here he is being interviewed by Loni Stark of the Stark Insider. 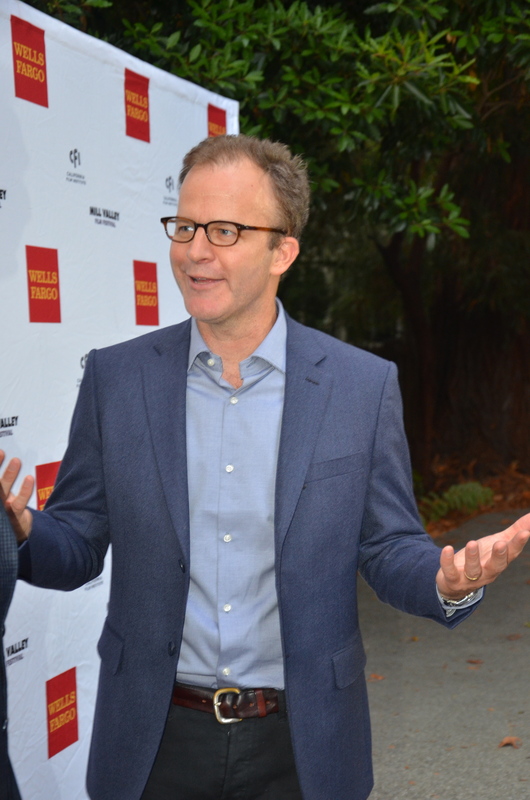 Next up was Tom McCarthy. 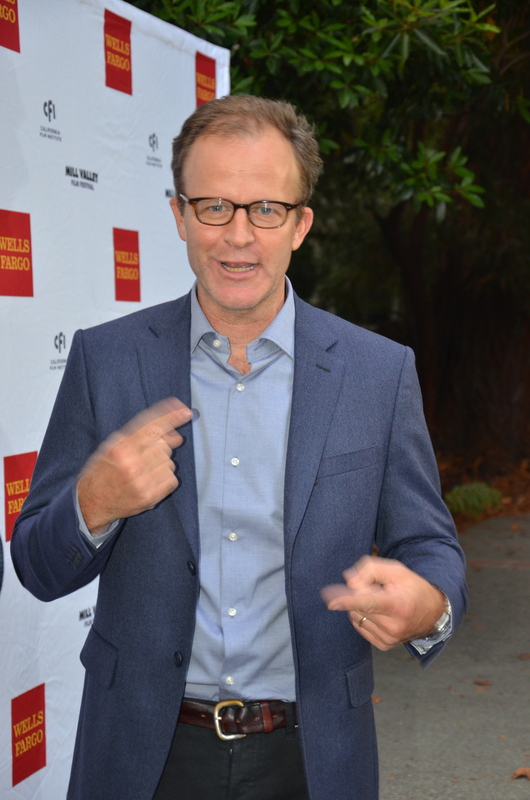 He is here with his new film, Spotlight. 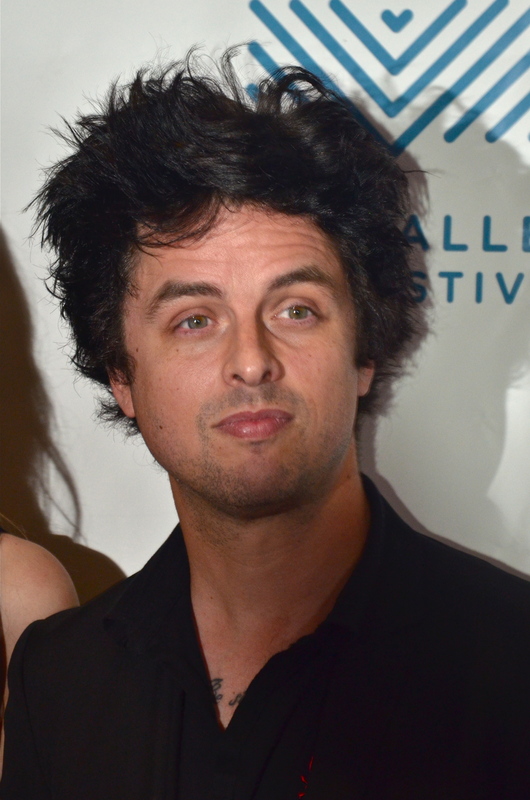 He is wonderfully animated. And has a beautiful, extremely nice, wife. With great shoes. She told me they’re Joia. One of the best experiences at the festival is the panels. 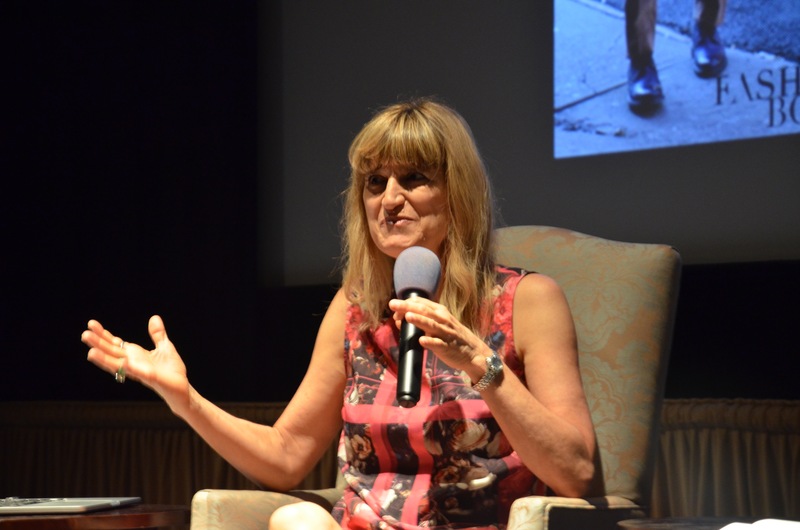 Catherine Hardwicke, who directed Thirteen, Twilight (which made over $400 million and won the heart of tweens everywhere) and her new film, Miss You Already, gave a remarkable master class in directing, but that will be the subject of another post. Ah, the tail end of summer. 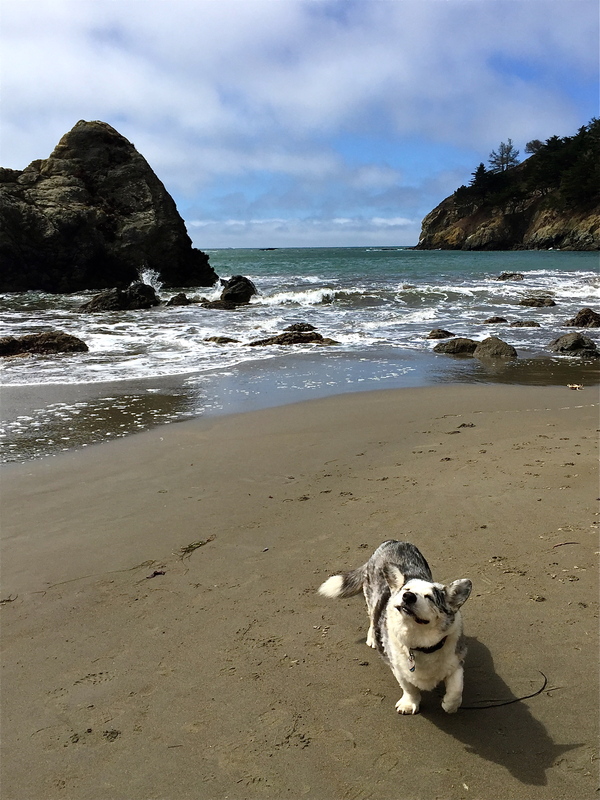 It’s good to be a corgi dancing at the shore. 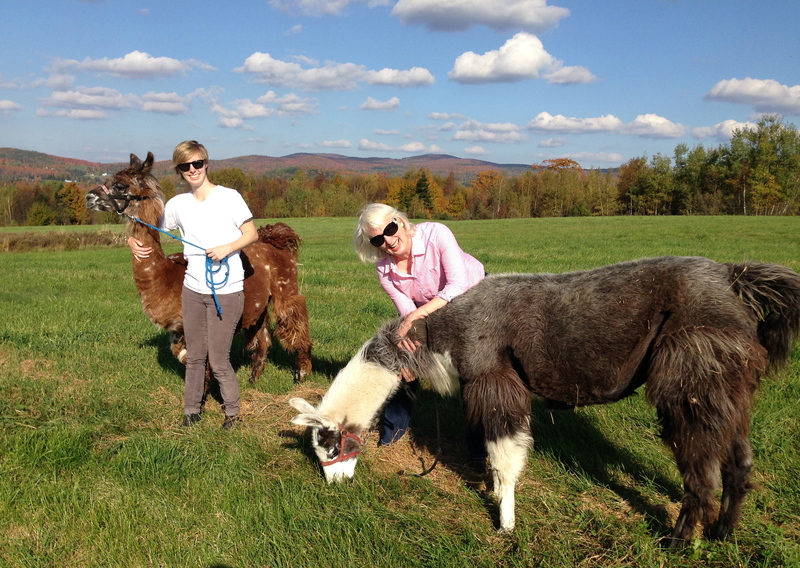 If you’ve always wanted to walk a llama, then it is worth the long drive to the Northeast Kingdom of Vermont to visit the Agape Hill Farm. 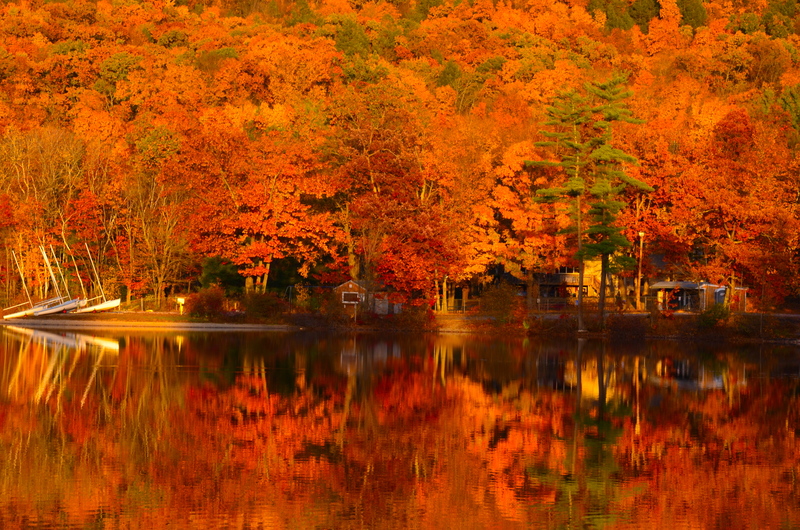 Agape Hill, in Hardwick, Vermont, is an ideal destination during leaf peeping season if you are looking for a reason to drive through the brilliant countryside. 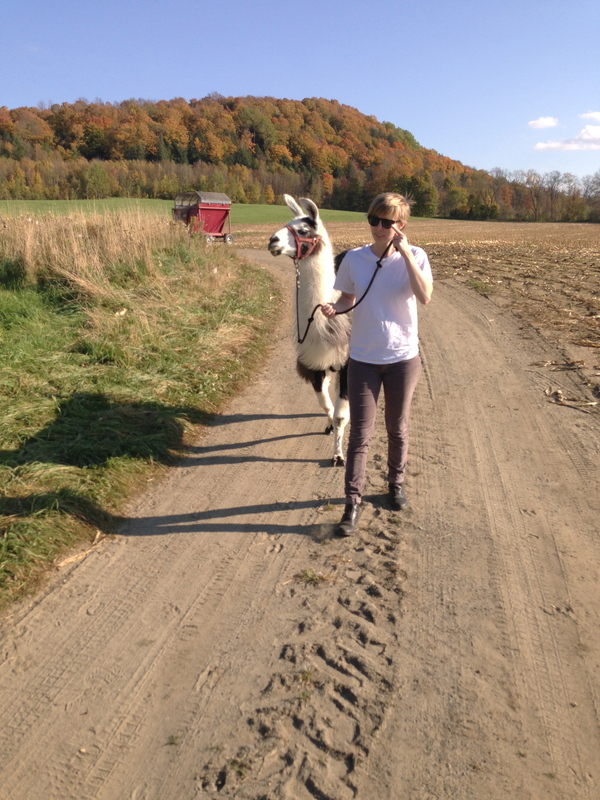 Since we actually had always wanted to walk a llama, we made a reservation and set off. 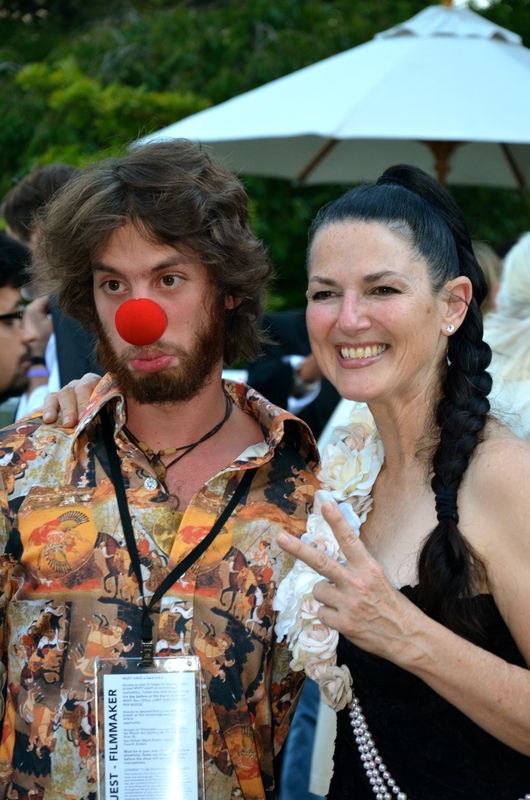 After making our way to northeastern Vermont, we met Nancy Kish, the very kind owner of family-run Agape Hill. 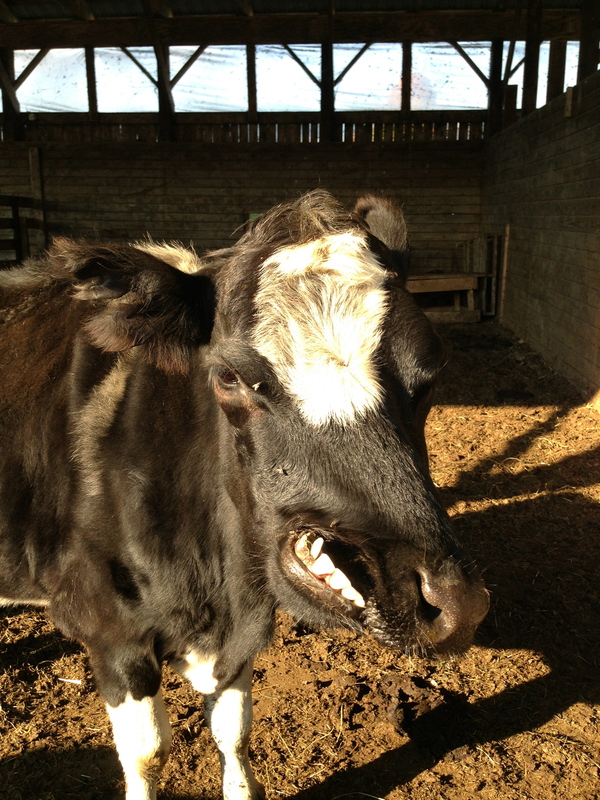 As we roamed around the farm, she showed us the goats, the sheep, the pigs named Bacon and Sausage. 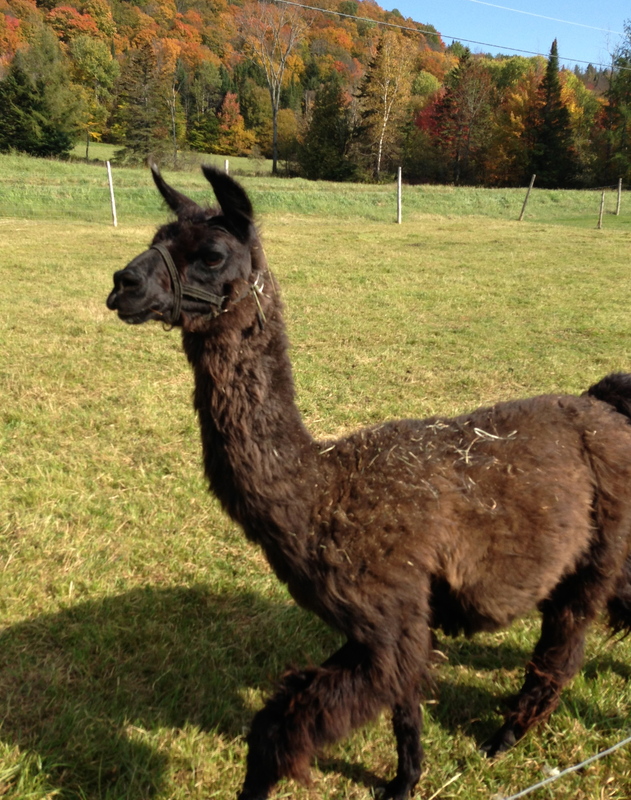 She told us about Pomco, the restless rescue llama who jumped the fence and tried to impregnate all the ladies. And she showed us Trainwreck, the wry-mouthed cow. Then we were introduced to our llamas. 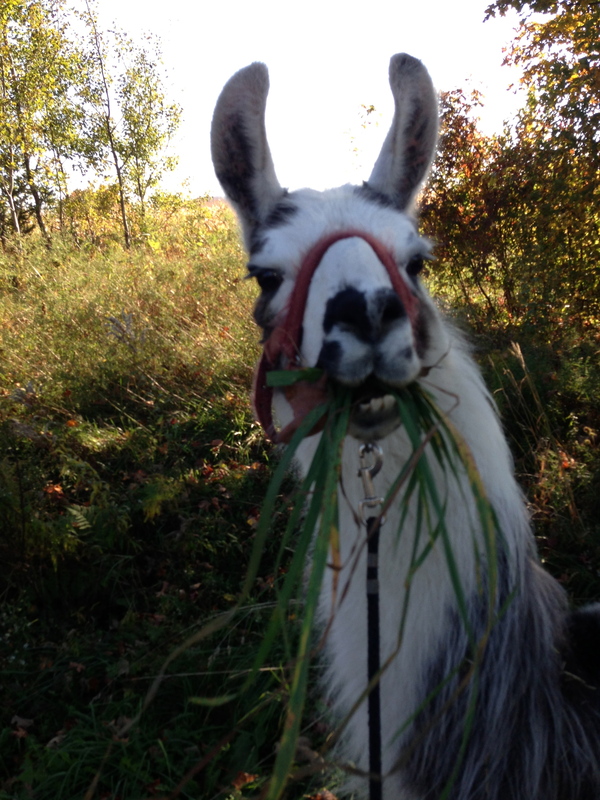 The website says that they “carefully match our llamas to each visitor according to comfort level and personality.” Well, bad news for me because my llama, Lolly, was kind of a stinker who only wanted to eat and was not in the mood for a walk. Hmmm, maybe not so far off after all. 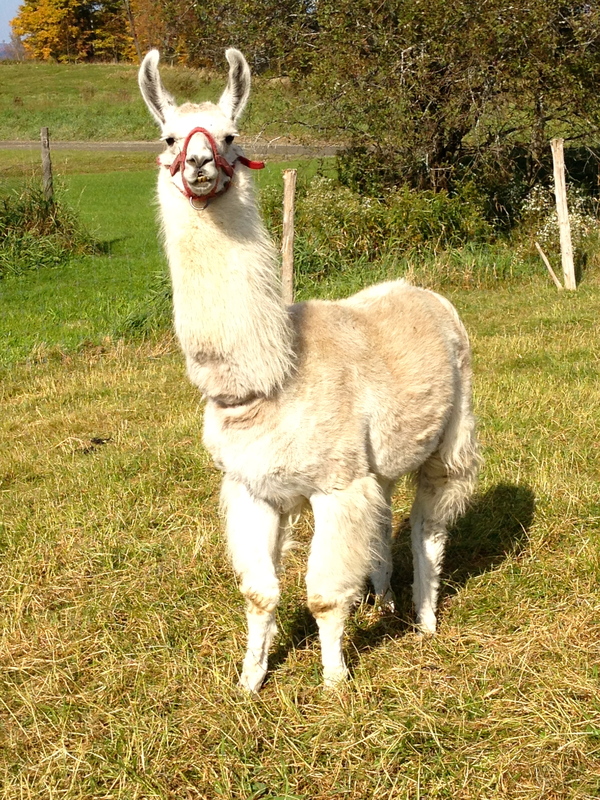 On the other hand, Miss Fluffy’s llama, Mahea, was an angel. Lolly’s slight reluctance to move along didn’t detract from the joy of the experience, however. We traded llamas and Lolly seemed to be much better behaved for Miss Fluffy. There really is something soothing about strolling through the gorgeous countryside at the side of a llama. 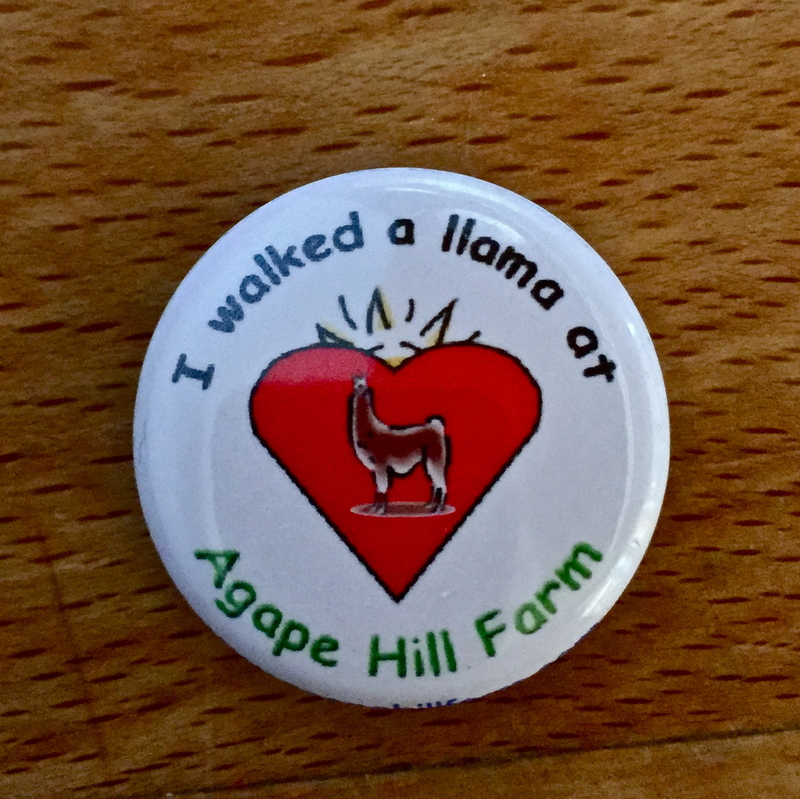 Agape Hill does a lot of things other than accompanying wayfarers on llama walks. They run a program for special needs students, who often relate better to the llamas than they do to other people. Their dedication to serving this population is deep and reflects their greater ambition to show an “agape” love: self-sacrificing love for others. After our walk, we received our pins, rummaged through the gift shop, and went on our way. 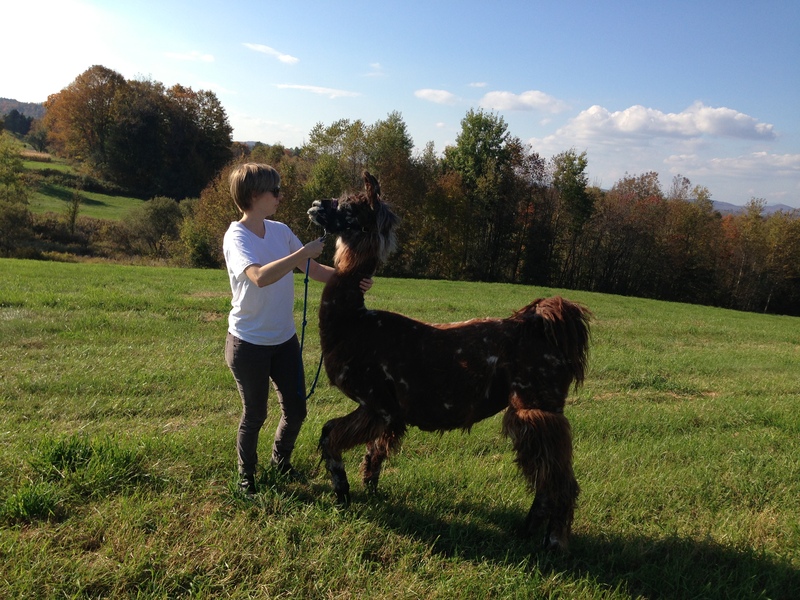 It was a wonderful day with some very cute llamas and a really nice person. 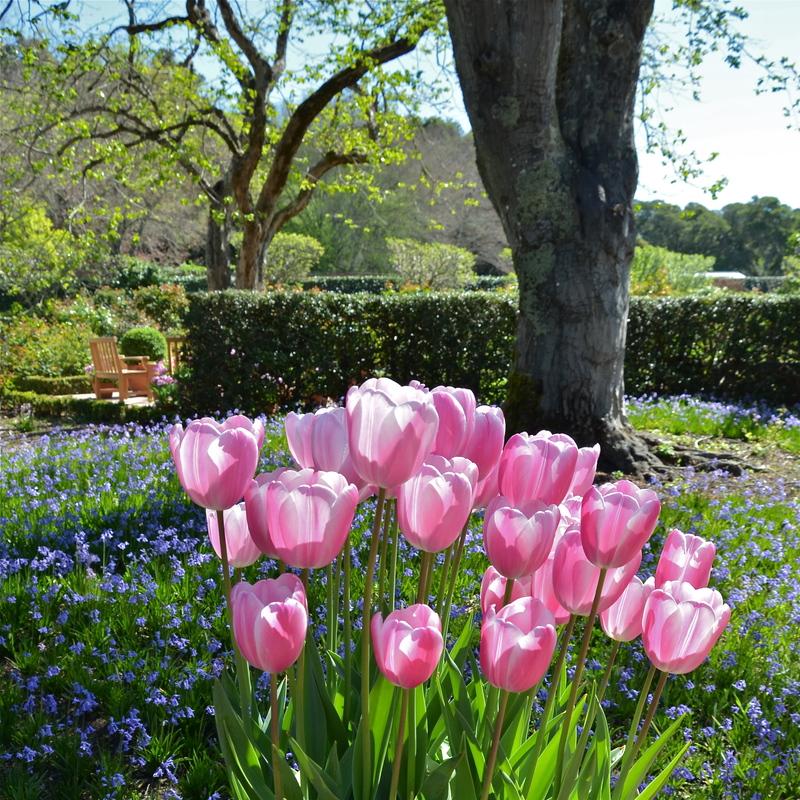 When you are craving tulips, there’s no place like Filoli in March. 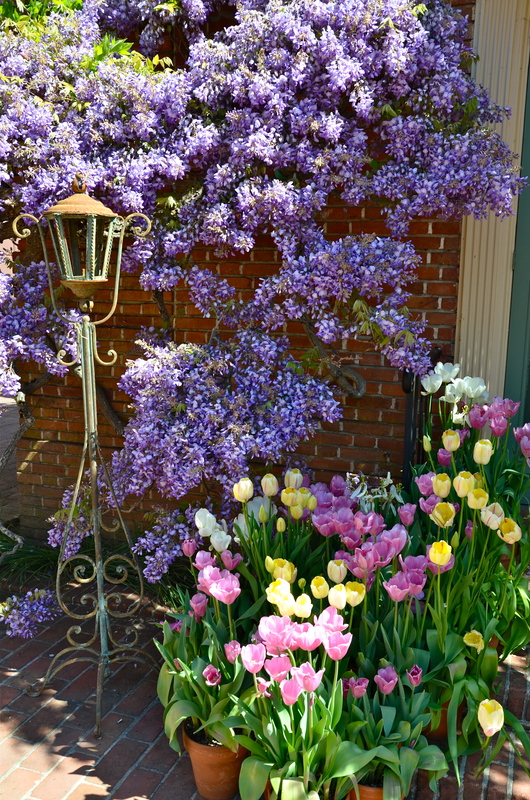 Filoli is a country home in Woodside, California, situated on 654 delicious acres of the San Francisco peninsula. 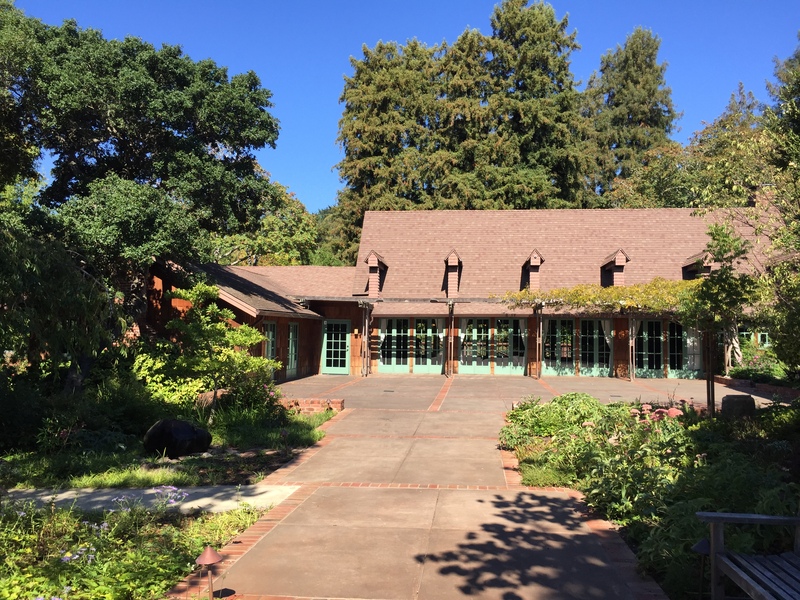 The home, designed and built between 1915 and 1917, is lovely, eclectic, very large, and allows for expansive fantasy habitation. It is the 16-acre Renaissance garden, however, designed between 1917 and 1929, that brings us back season after season for another look. 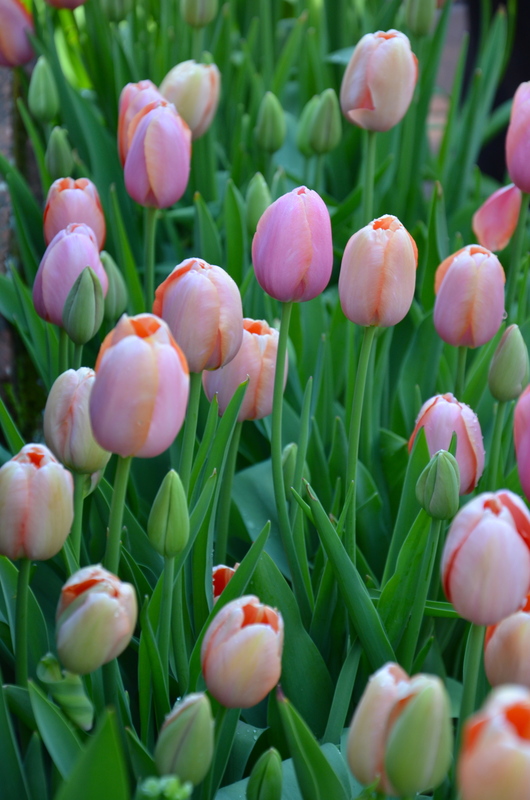 In March, it is time for the tulips. 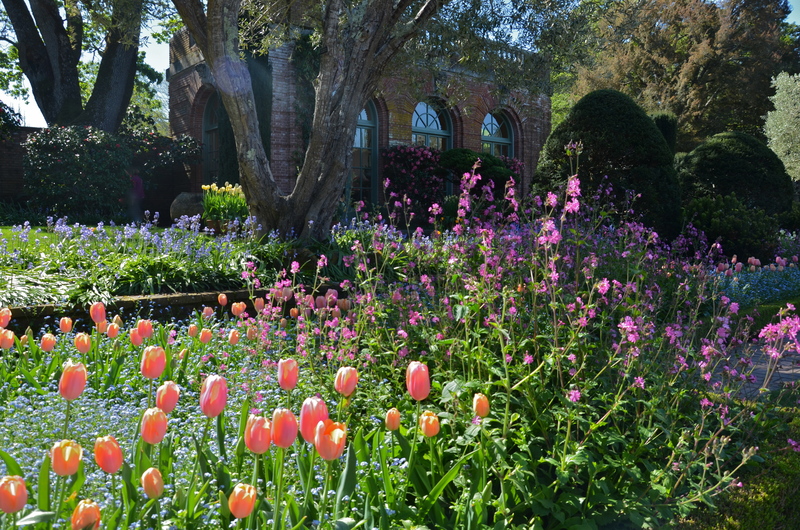 The name Filoli is derived from the credo of the original owner and builder, William Bowers Bourn: “FIght for a just cause; LOve your fellow man; LIve a good life. 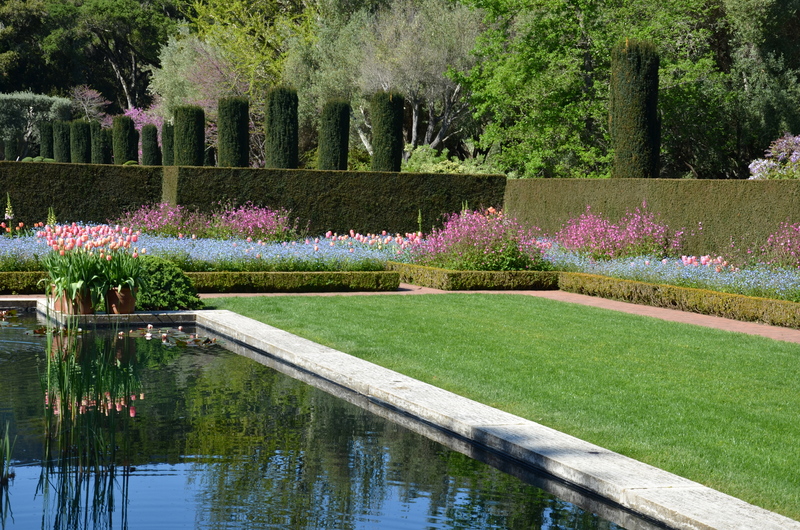 Mr. Bourn made a fortune in the gold-mining business in Grass Valley, California, and also owned the Spring Valley Water Company, the southern tip of which now comprises the Filoli estate. His home certainly reflects the part about LIving a good life! In 1975, Mrs. William P. Roth, the owner at that time, donated the house and 125 acres to the National Trust for Historic Preservation and it is now open for visitors between February and October, Tuesday through Sunday. No picnics or tripods! So, let’s stroll through the garden take in the tulips. 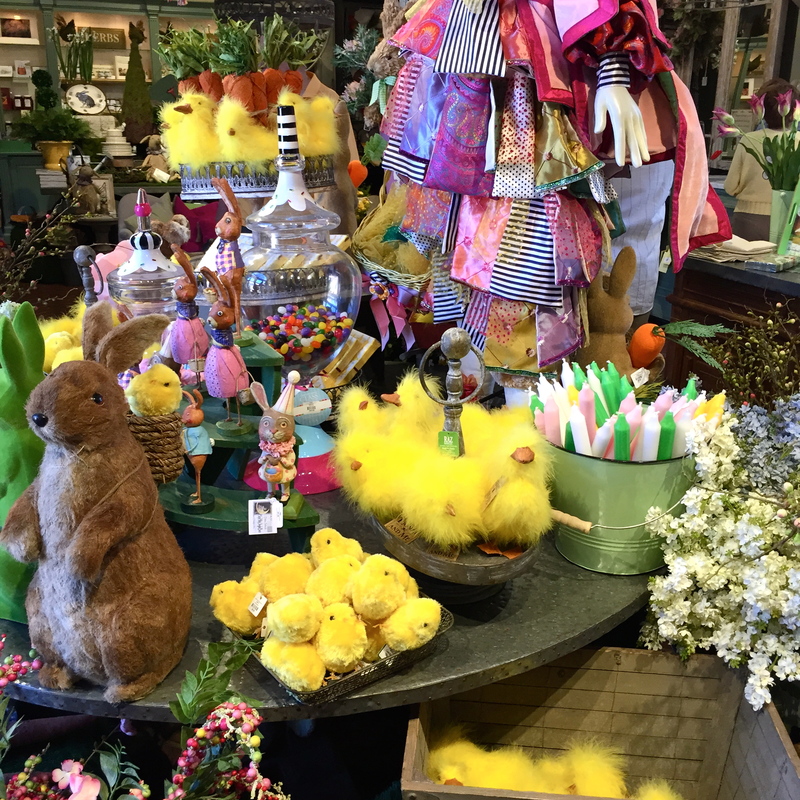 Since it’s March, there are also rhododendrons,wisteria, and the beginnings of peonies. There is a garden shop that uses lively merchandizing to sell plants and other odds and ends. 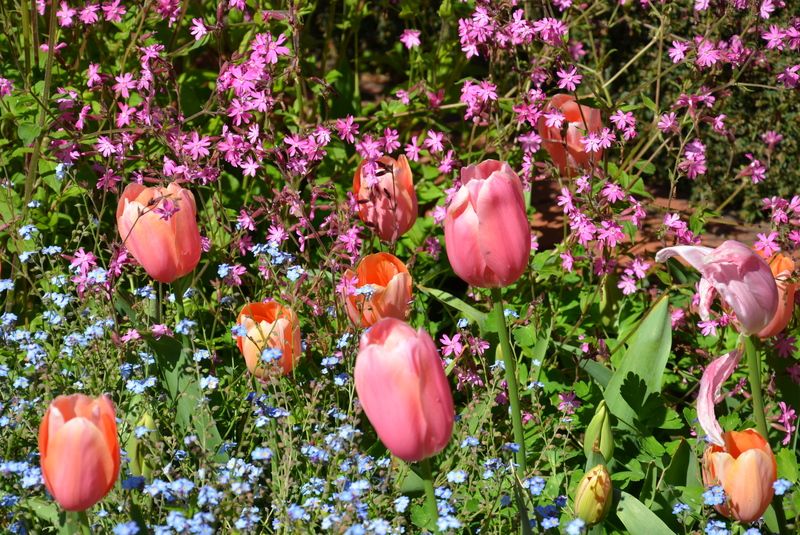 Another reason to go to Filoli is the classes. 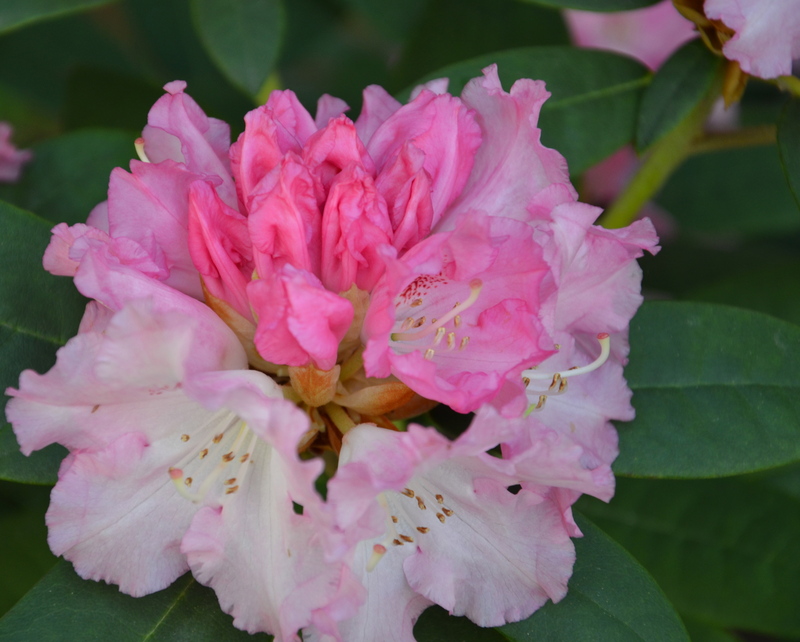 It is possible to get a certificate in botanical art, floral design, or horticulture. 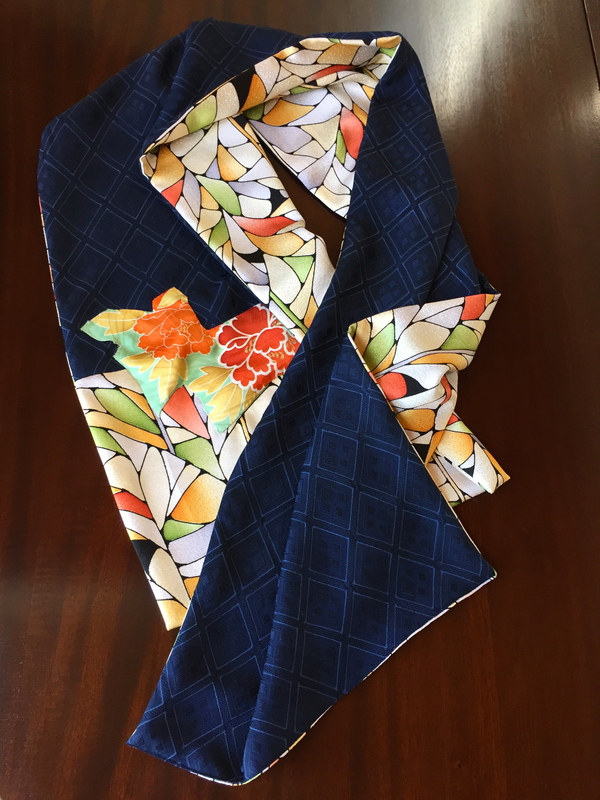 The decorative arts classes offer unusual subjects like embroidery and porcelain painting. 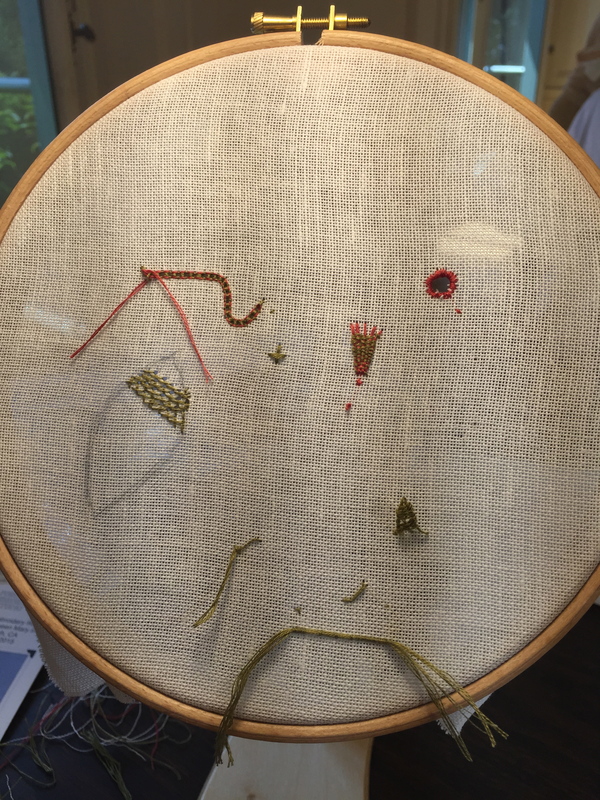 Just for a laugh, here is how my embroidery looked after a six-hour “White Work in Color” embroidery class taught by the charming Lucy Barter, a graduate of the Royal School of Needlework whose certificate was actually signed by Queen Elizabeth II. (For you Call the Midwife fans, Chummy is also an alumna of this college.) It wasn’t Lucy’s fault it looked like this. 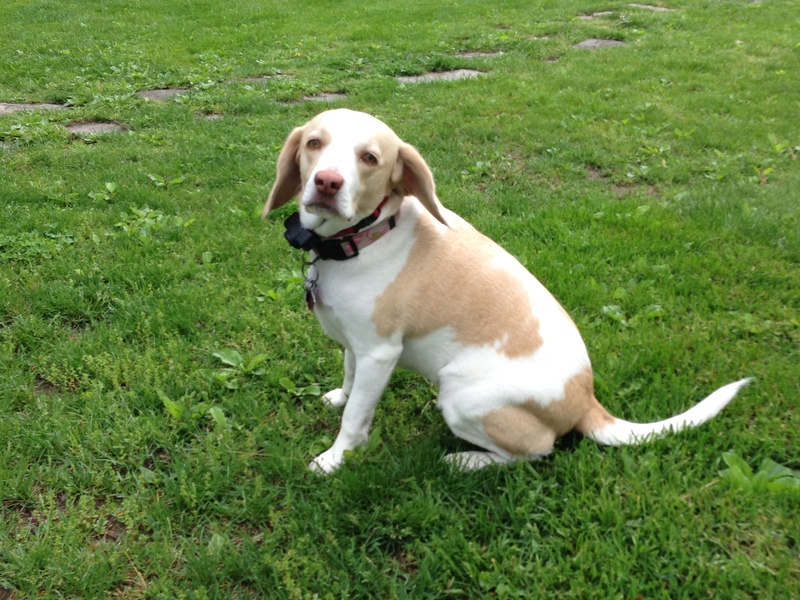 This is Miss Ellie’s, who was much more adept. 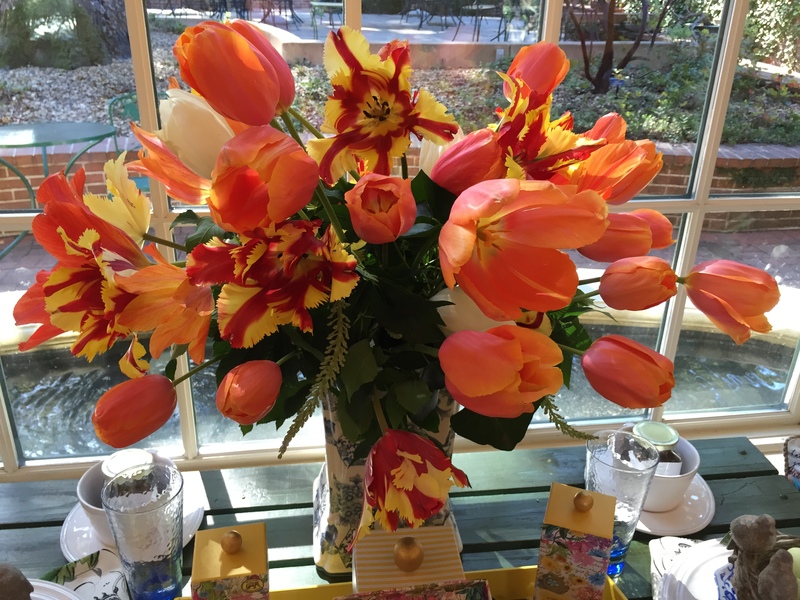 Well, back to the tulips. 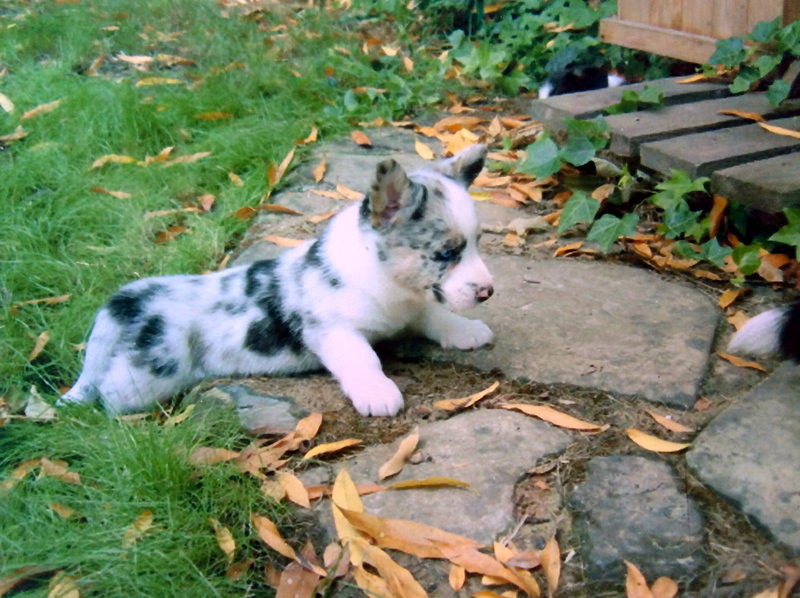 Here is Luigi the blue merle cardigan corgi at six weeks. 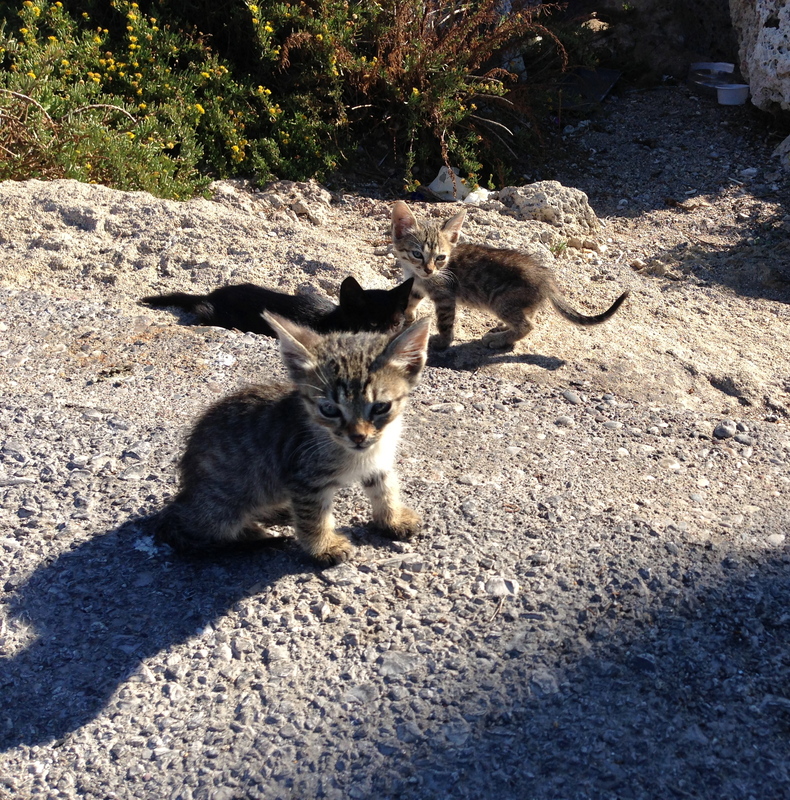 He has just been weaned but that doesn’t stop him from trying to follow his mom, Tosca. You can see her tail as she walks away to the right. Poor Luigi! His ears are up (the first of his litter) but the stone steps are a bit of a challenge. 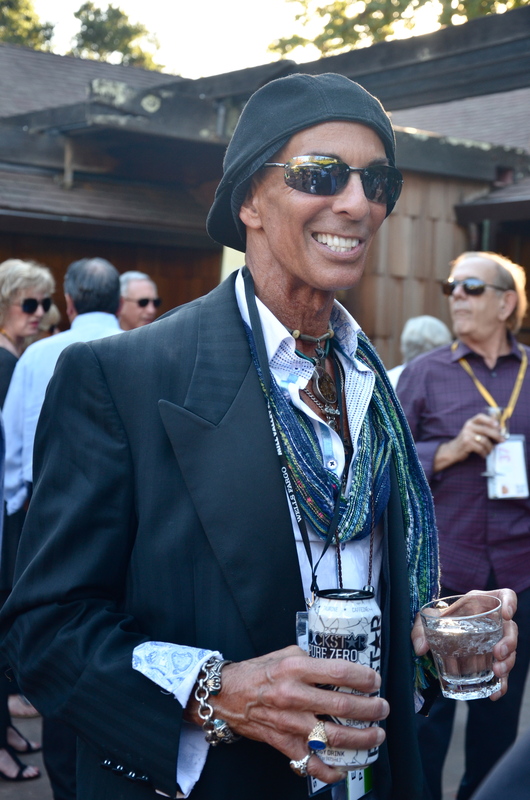 It is almost time for the California Film Institute’s 2015 Mill Valley Film Festival (October 8 – 18, 2015) and that got me thinking about last year’s festival when I worked as a photographer. That was when I decided for sure that I didn’t want to be a movie star. 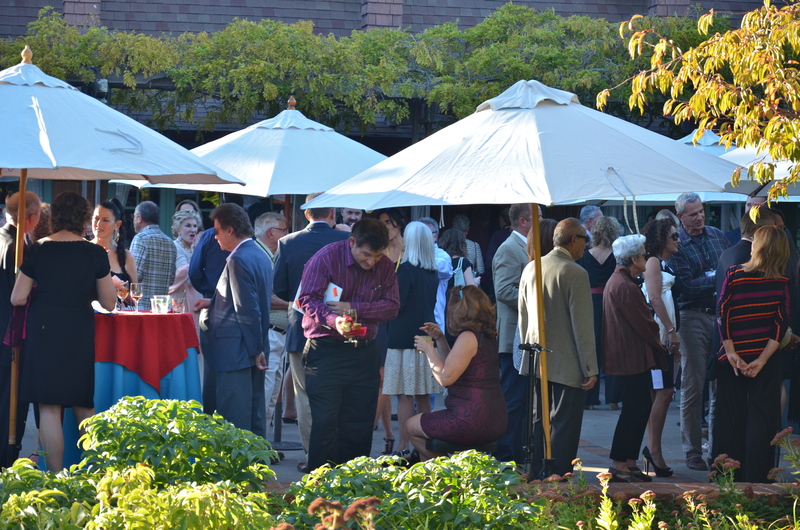 The opening event is held at the Outdoor Art Club. It’s a private women’s civics and conservation club dedicating to preserving a beautiful Arts & Crafts building designed by architect Bernard Maybeck and the lovely garden. 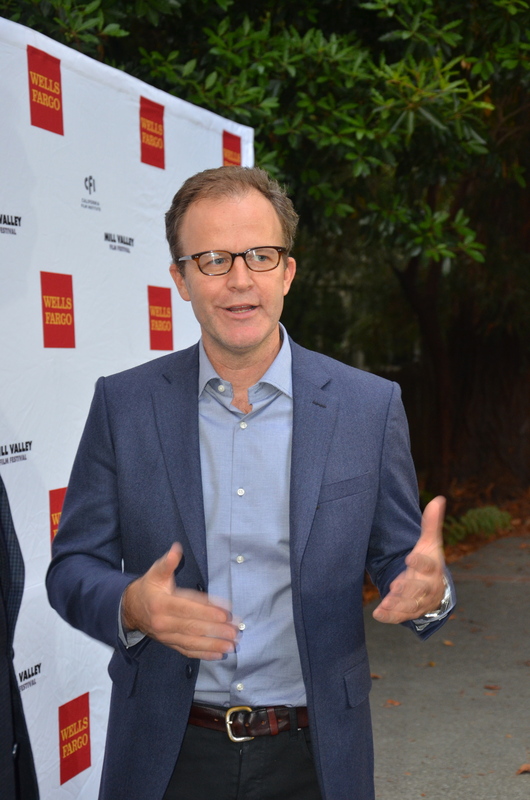 It has the added convenience of being located across the street from the Sequoia Theater in Mill Valley, where the opening night film, “The Horsemen,” was shown. The Opening Night VIP party is attended by everyone: filmmakers, producers, locals, people involved in this festival, people from other festivals, even you, if you buy a ticket in time here. 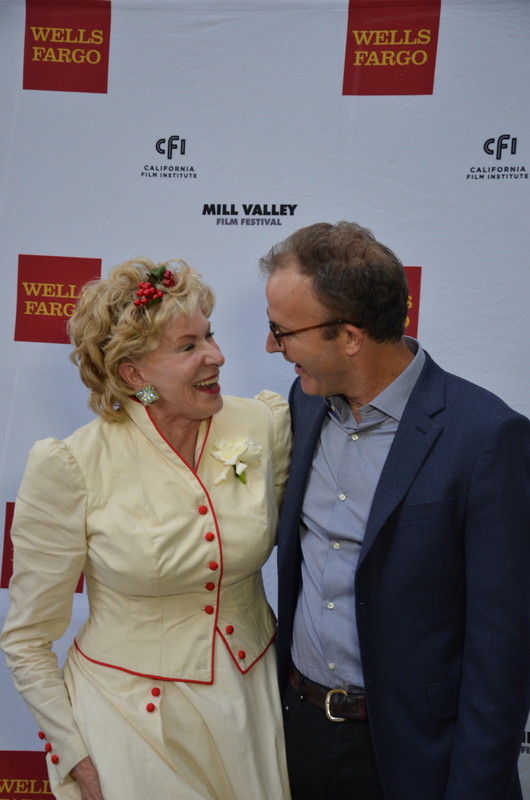 There are, of course, artists and actors, although Hal and Myrna Tatar were actually across the street in line for the movie. 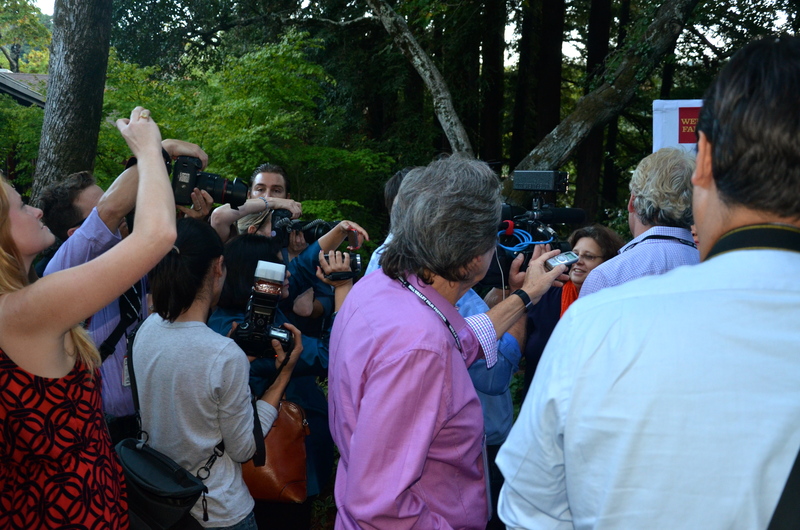 Meanwhile, the official photographers rushed around shooting pictures, taking names, and trading sightings. Hilary was very gracious, even when I was setting up my tripod inside the theater and accidentally jabbed her with my elbow as she waited through the introduction before walking down the aisle. 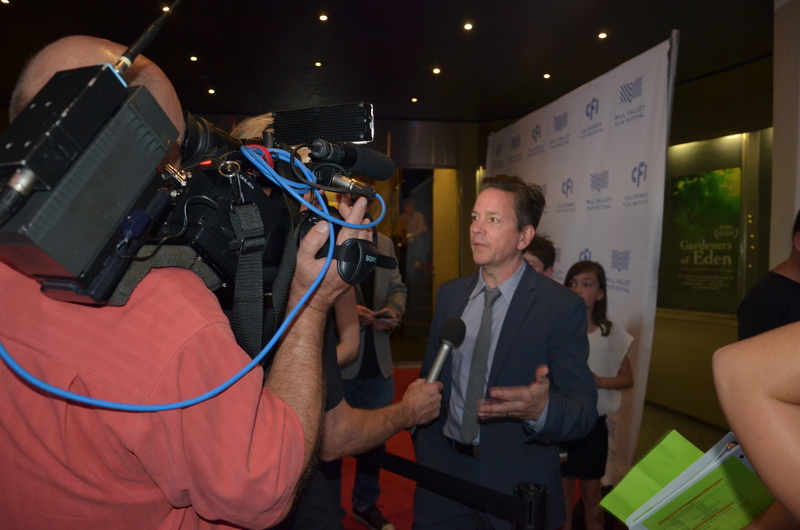 Another red carpet MVFF event was the screening of “Like Sunday, Like Rain” attended by filmmaker Frank Whaley and stars Leighton Meester and Billie Joe Armstrong of Green Day. 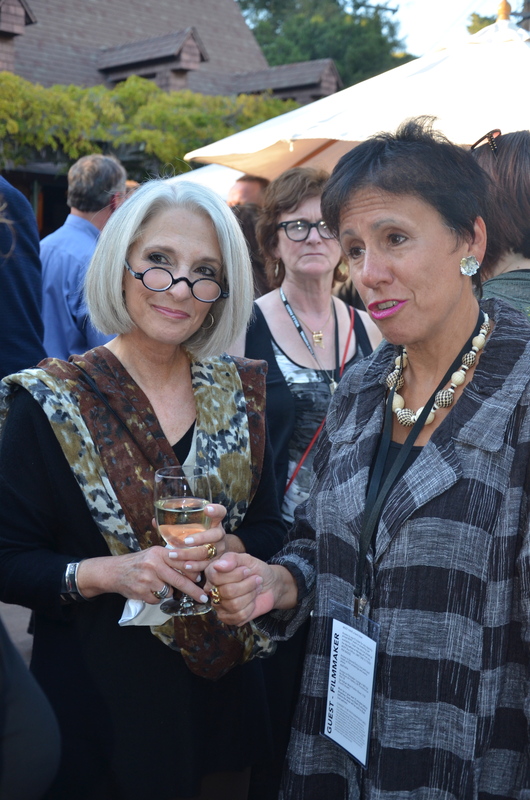 This was one held at the Rafael Theater in San Rafael. 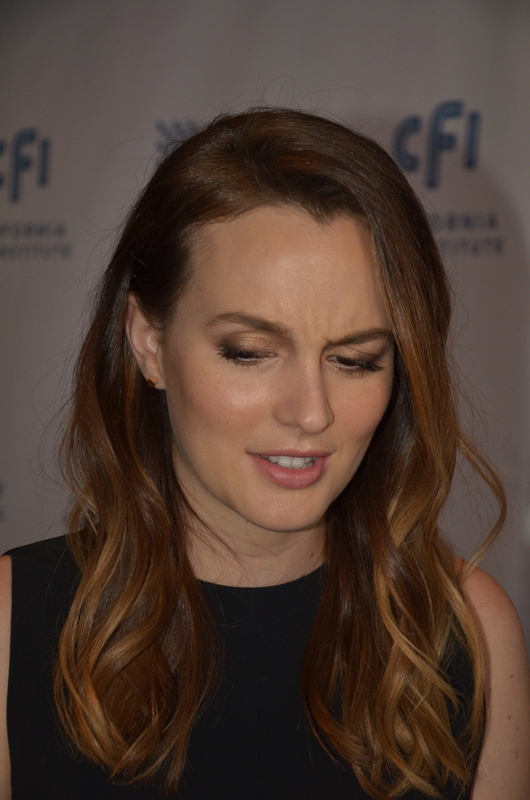 Leighton Meester is very, very pretty in person with perfectly symmetrical features and luminous skin. But on camera? A knockout! No such thing as a bad angle. It takes a lot of grace to be a movie star, and a lot of stamina to stand up to the demands of the public. 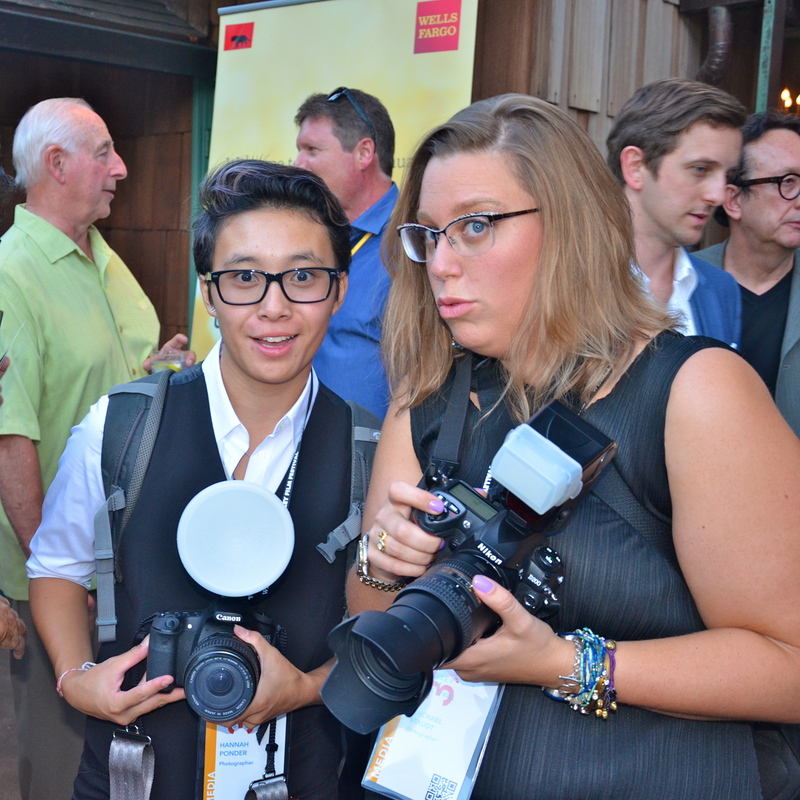 That’s why I’m staying on the shy side of the camera. 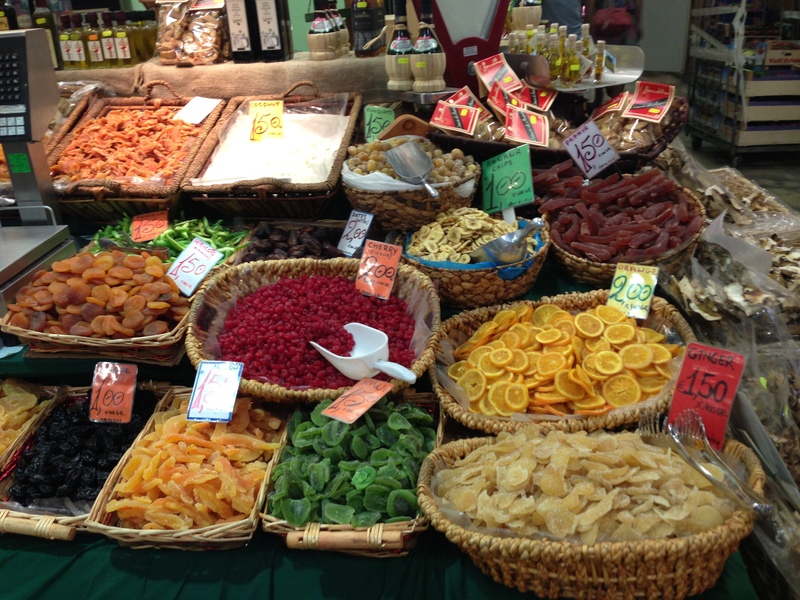 There are many great things in Florence, Italy–the architecture, the art, the gardens–but there is no question that one of that best things is the food. 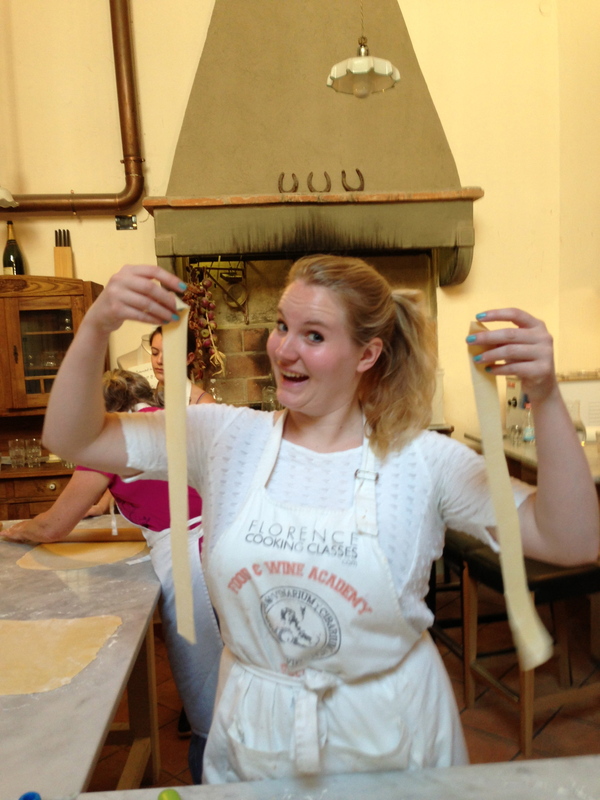 So, while in Florence, why not learn to cook? 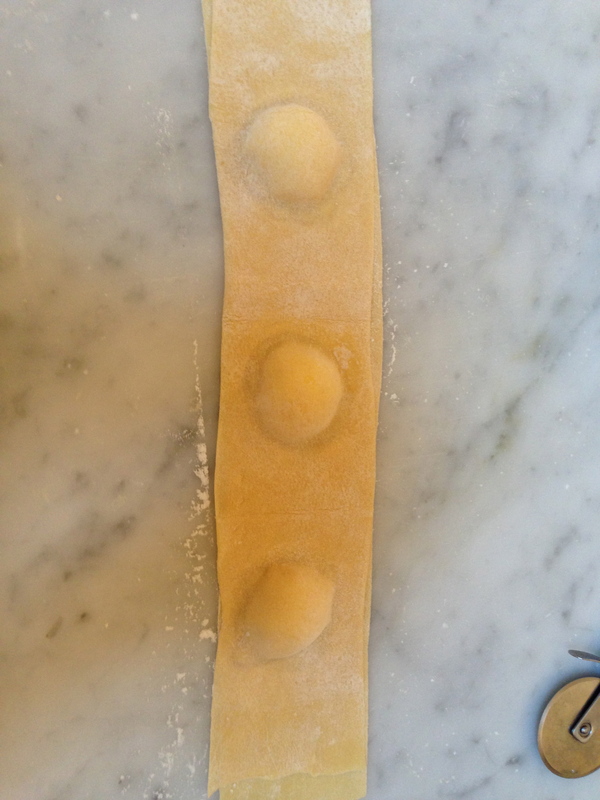 Some lucky visitors stay for a week-long cooking course, but even if you have only a free day you can learn to make a decent pasta and tiramisu. 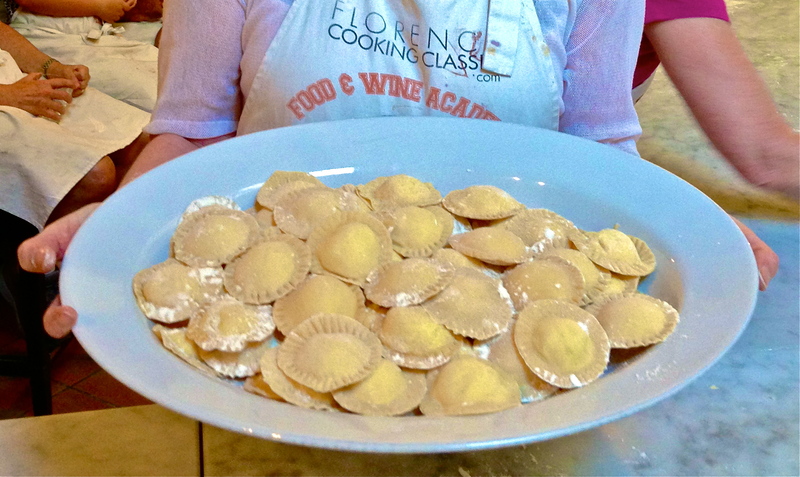 We went to a cooking class at the Food and Wine Academy of Florence. 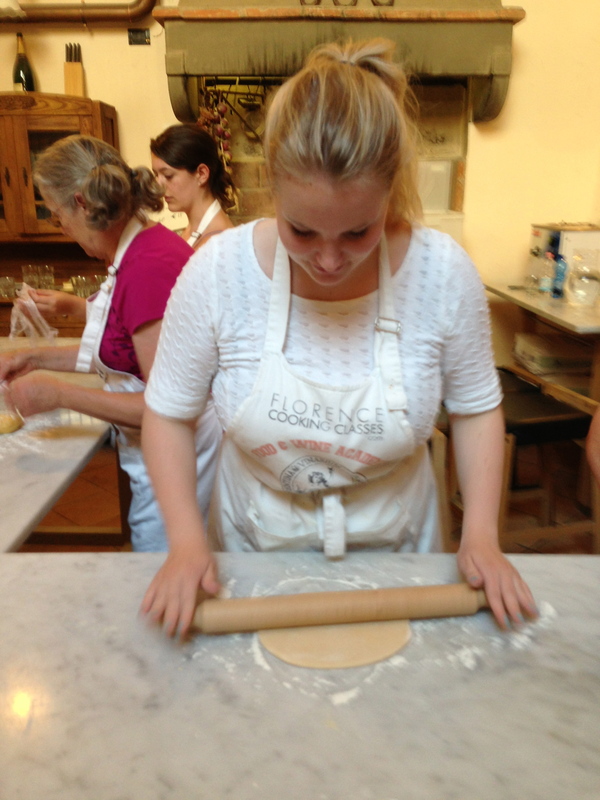 They offer a variety of cooking classes and tours, including pizza and gelato making, wine and olive tasting, a Tuscan wine trail tour, and our class, the “Chef for a Day” cooking class that included a trip to the Florence Central Market. We had, quite unusually, not planned in advance and considered ourselves extremely lucky to fit into a class the next day. 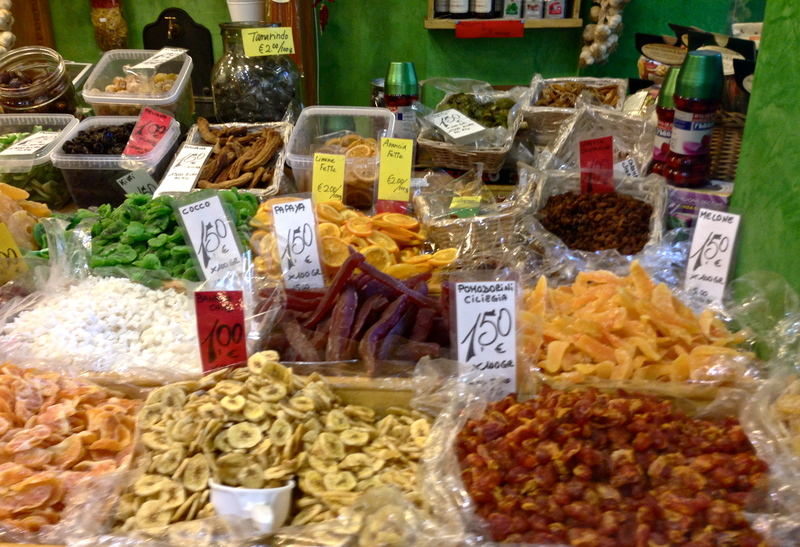 Our cooking class met in the morning and we took an easy stroll to the Central Market in Florence. 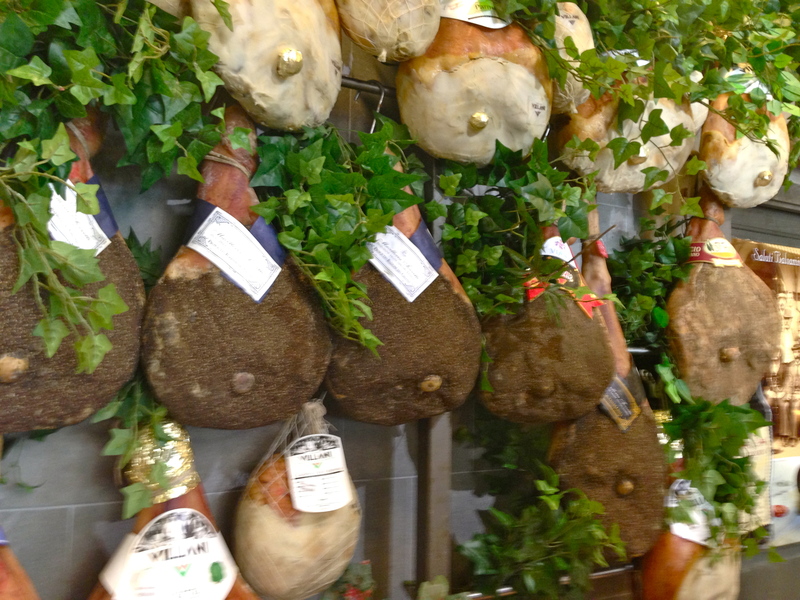 You begin to understand why Florentine food is so great when you see what they start with. 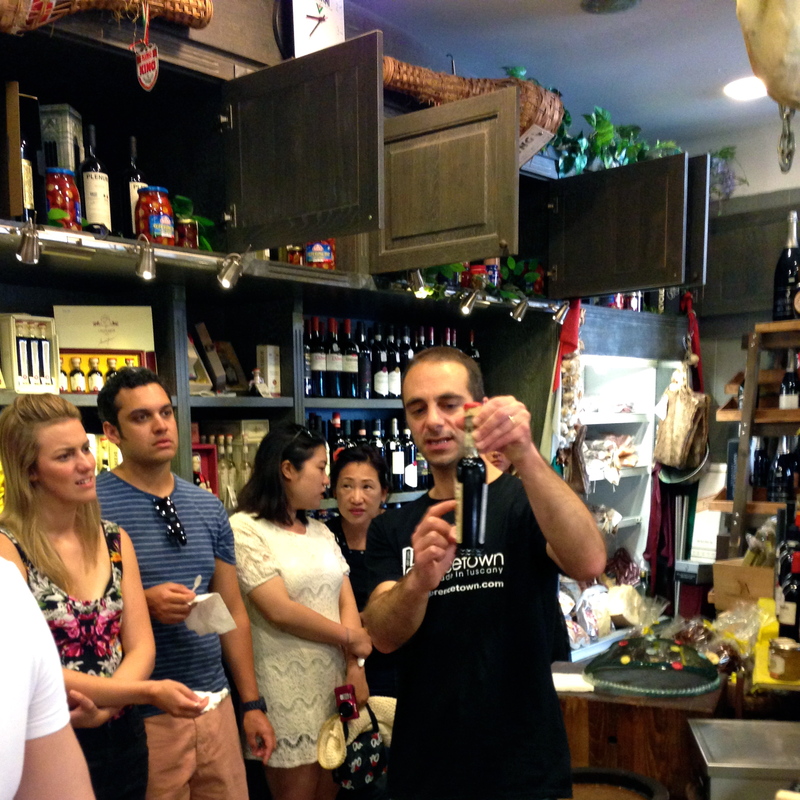 We crammed into a little stall for a private tasting of olive oil and balsamic vinegar. 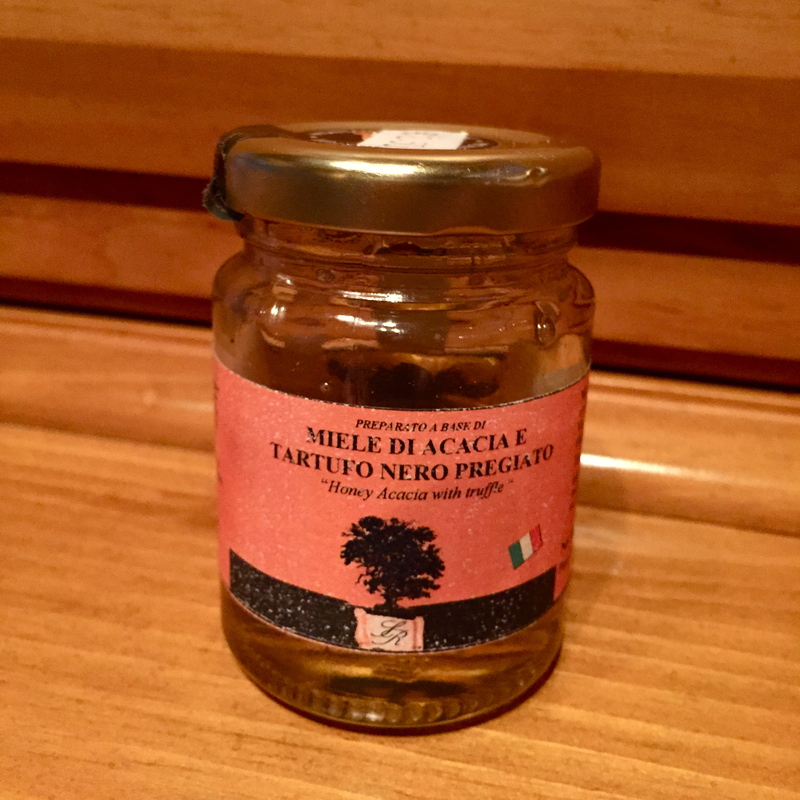 We also tried a lot of tasty artisanal treats and came out with our winner, the truffle honey. Once we had our supplies, we proceeded by foot to the cooking school. The kitchen was high-ceiled with smooth plaster and looked the way kitchens aspire to look after a high-end remodel. 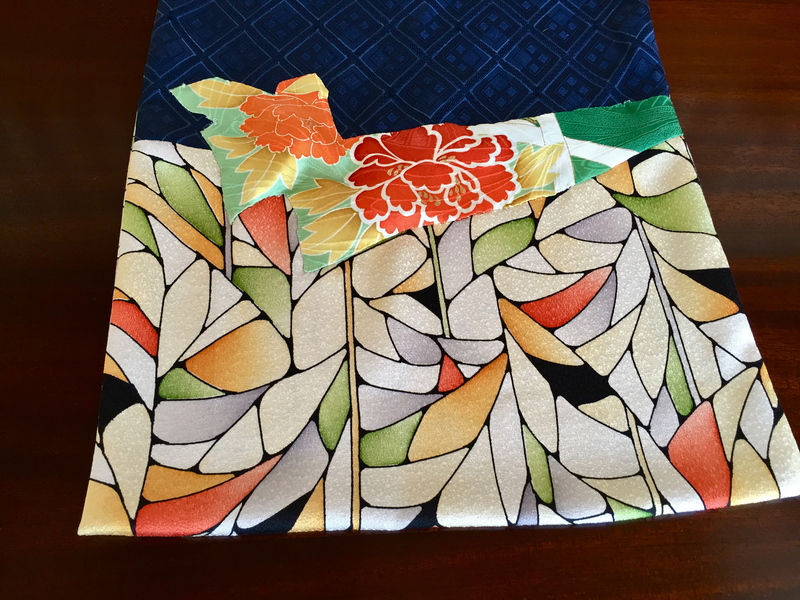 We were issued our aprons and found a place at the table. 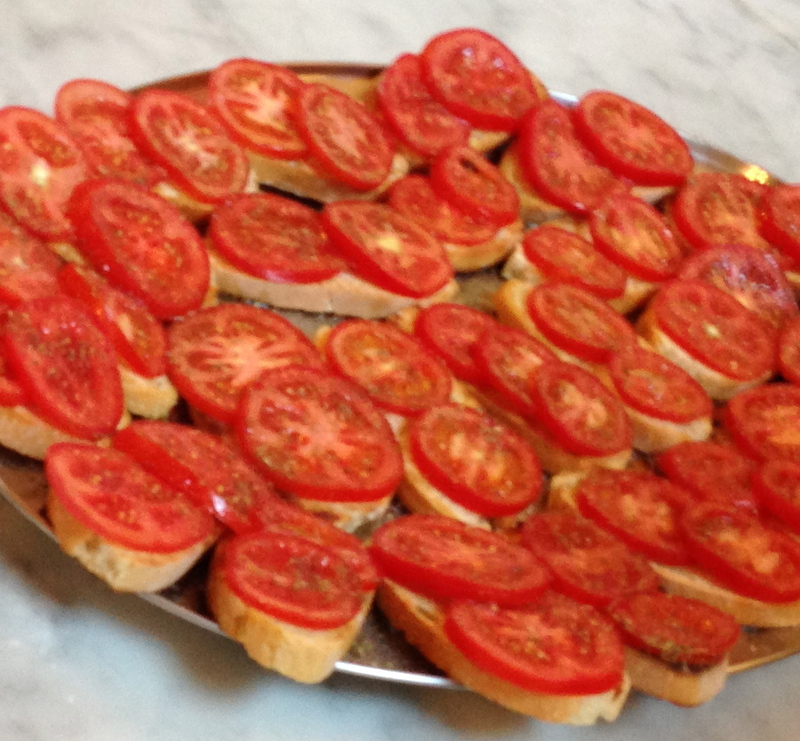 First, we all ate some bruschetta with perfect tomatoes. We didn’t make this, but we were given the recipe and instructions to make it at home. 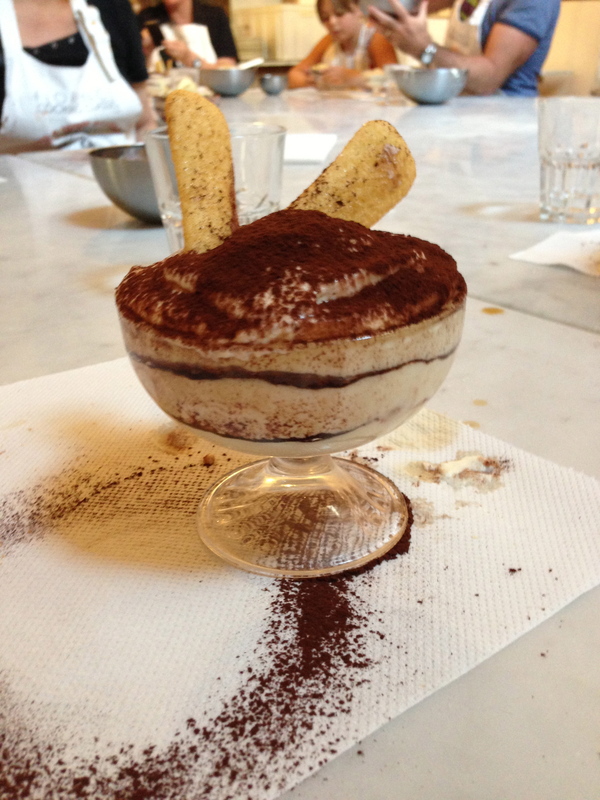 Next, we made our dessert, the tiramasu. 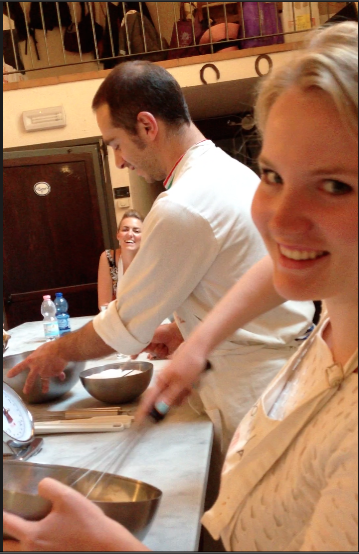 We did a lot of whisking. Then we layered our crema and chocolate in glass bowls. We all designed our tiramisu with a personal touch so that we could identify our own bowl later after the dessert chilled. 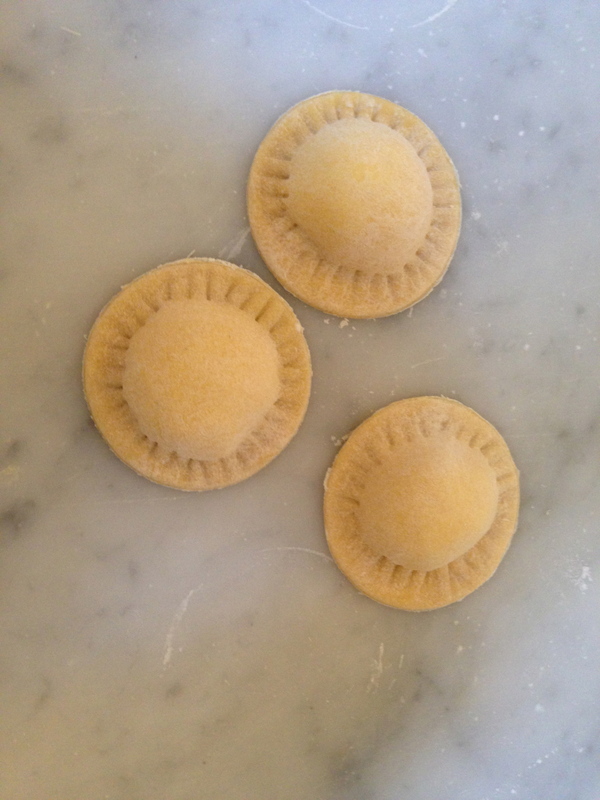 And the results were startlingly professional! 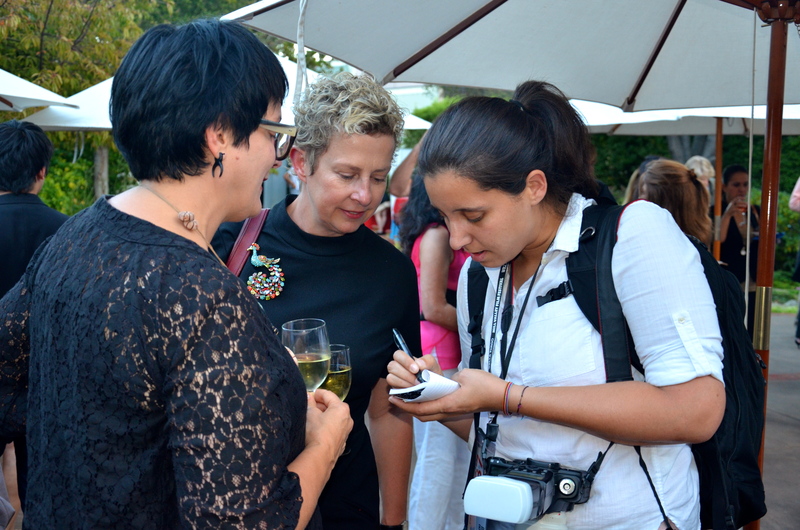 After we ate–sorry, too busy eating to take a picture–we all received our certificates. 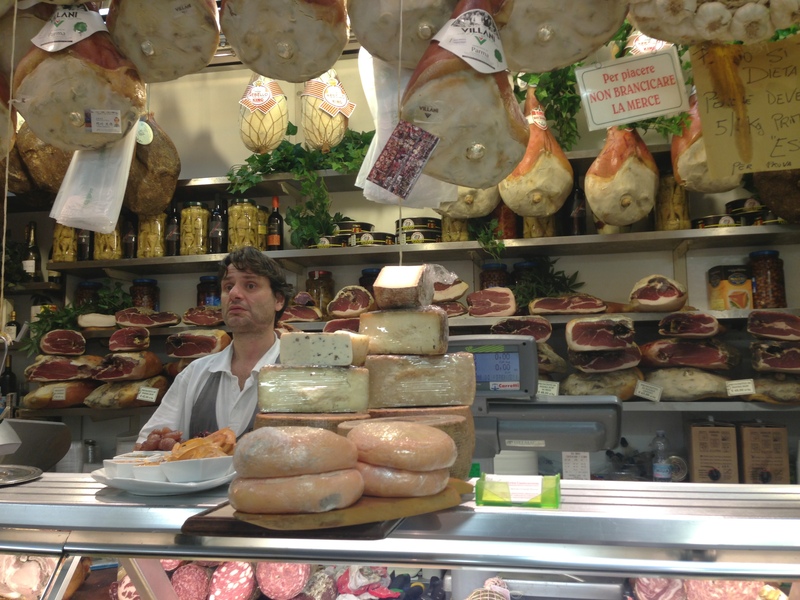 What a delicious and instructive way to spend a day in Florence! 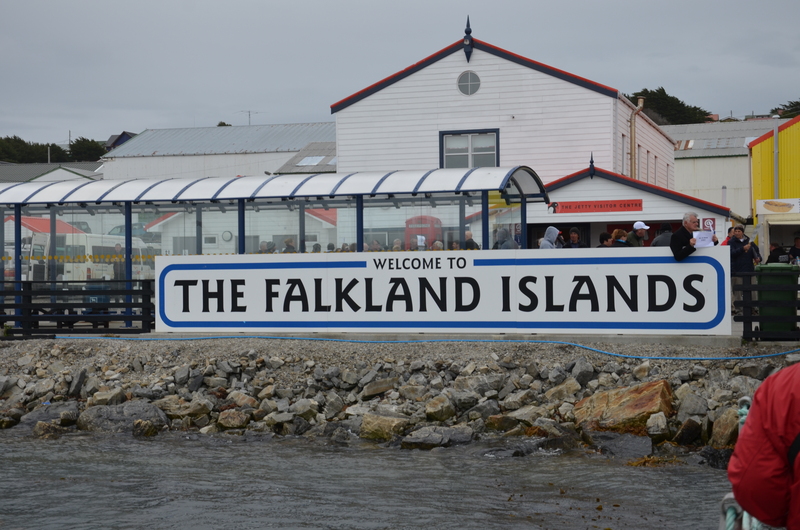 How unlikely to find oneself on the Falkland Islands. 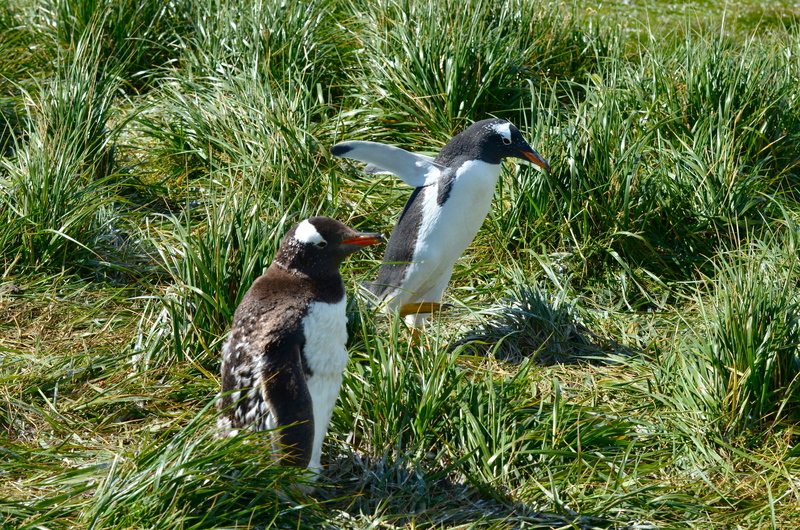 We decided it was time to round Cape Horn and found the perfect itinerary on Holland America: Buenos Aires, Uruguay, the Falkland Islands, the Straits of Magellan, Tierra del Fuego, around the Horn, and up through the fjords and volcanoes of Chile to Santiago. 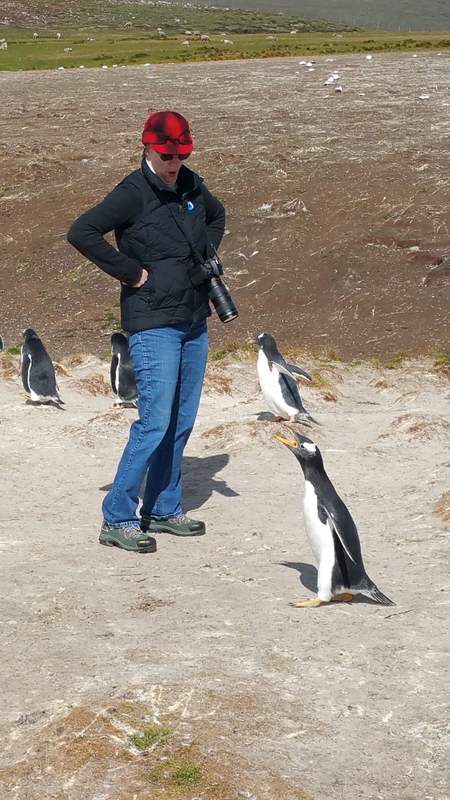 It was all wonderful, but there is no question that the highlight was a visit to the penguins at Volunteer Point on the Falkland Islands. 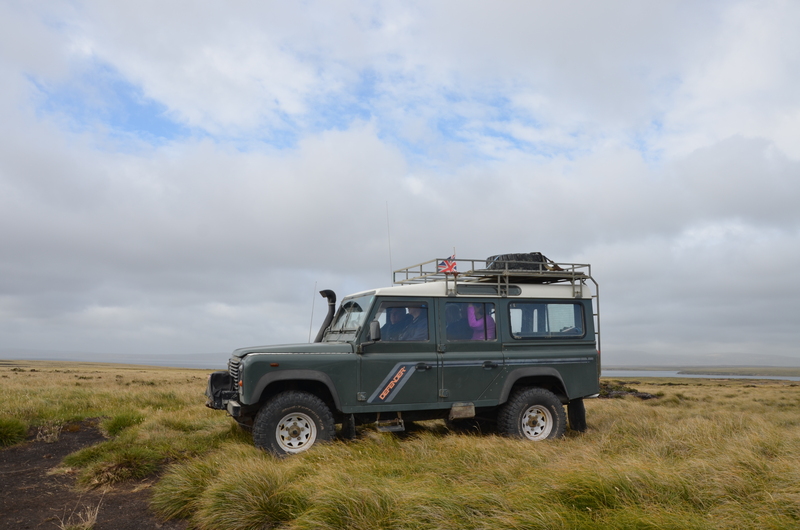 Upon arriving in Stanley, four of us boarded an impressive Toyota Landcruiser and joined a convoy through the peat bogs to Volunteer Point. 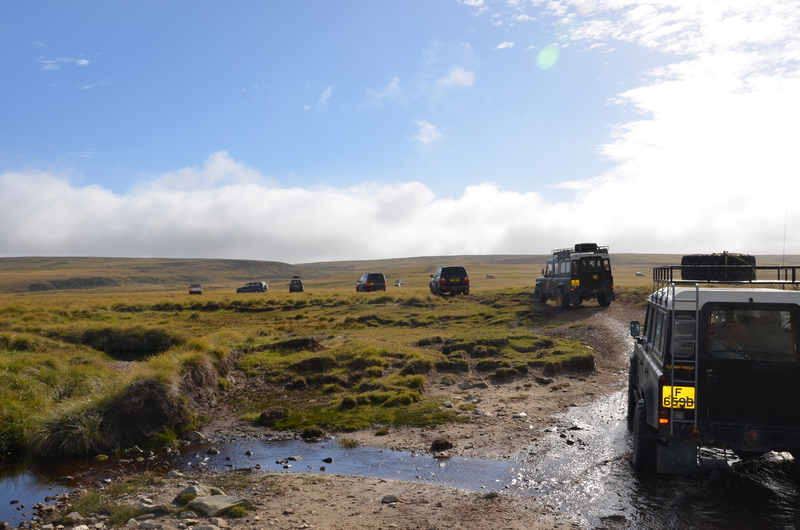 This part was an adventure in itself as there are no specific roads, just tracts that the convoy leader chooses based on what looks good that day. One of the vehicles in our convoy broke down so we squeezed a Russian-speaking woman into our Landcruiser and tied the spare tire to the roof rack. 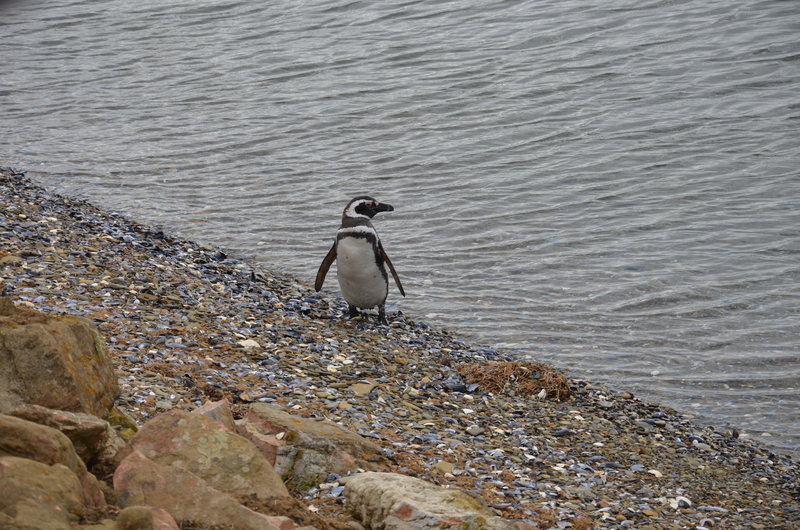 On the way, we saw our first penguin, a little Magellan. 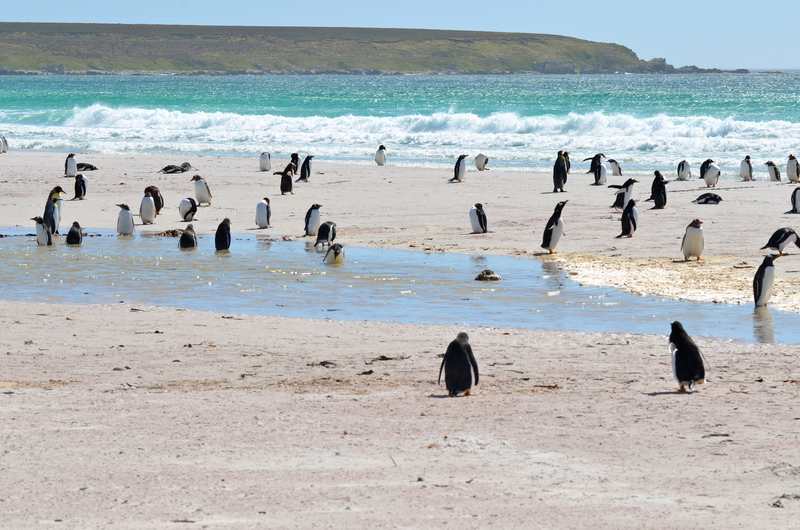 Eventually, we arrived at penguin heaven. 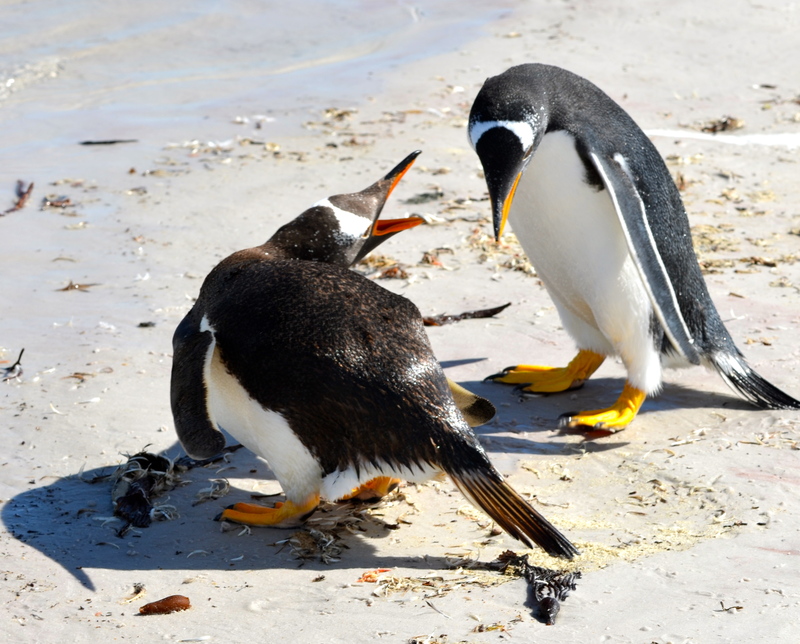 There are about 1,200 penguins and three different species each claiming their own roosting spot at Volunteer Point. 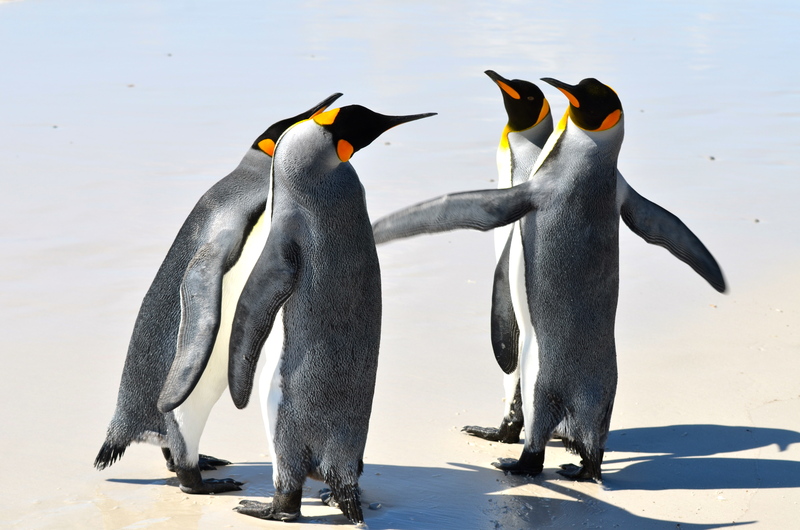 The first we came across was the group of gentoos. The fledglings are adorable. 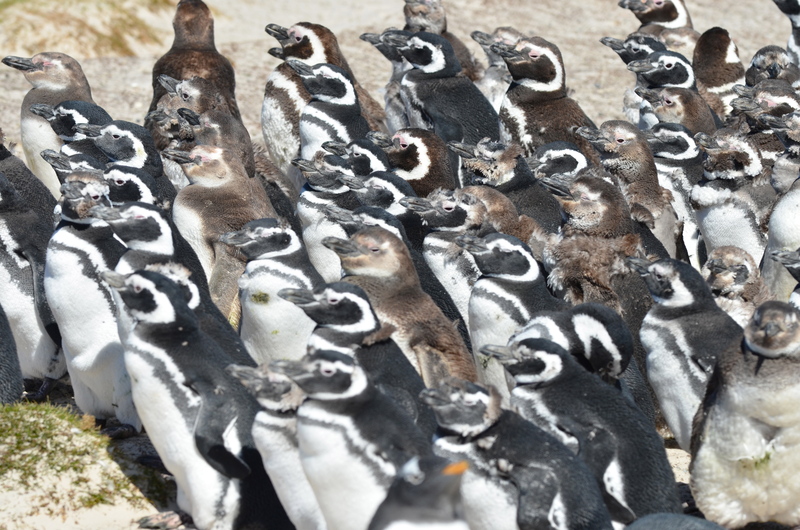 Next, the baby Magellans huddled together. They seemed to have a preference for mud. 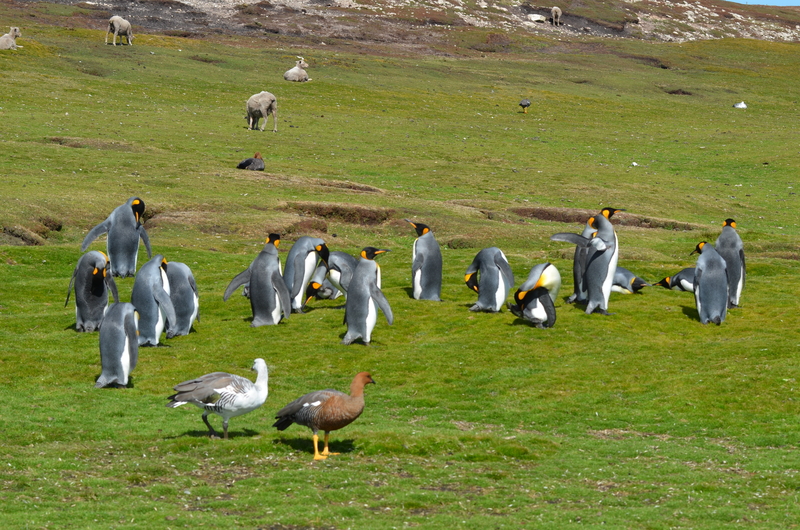 On the hillside, the nearly yard-tall king penguins roosted. But it was the beach that was astonishing. 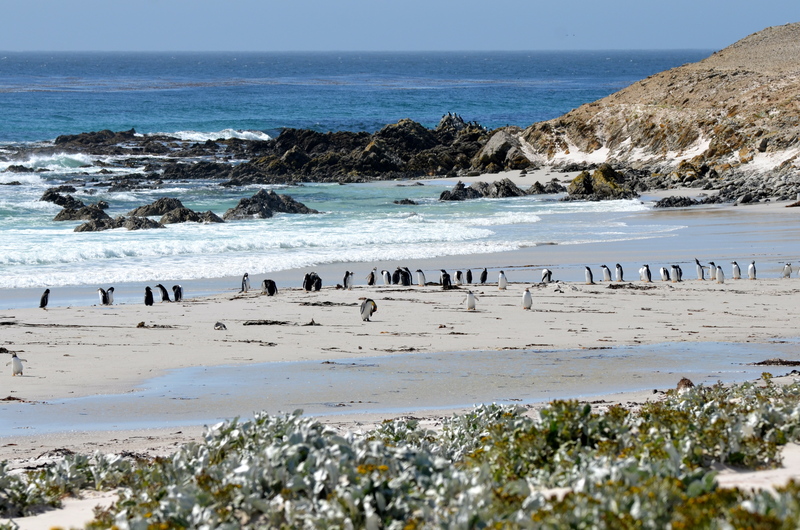 Hundreds and hundreds of penguins–all types–swimming, marching, preening–enjoying icy, pristine, turquoise waters. 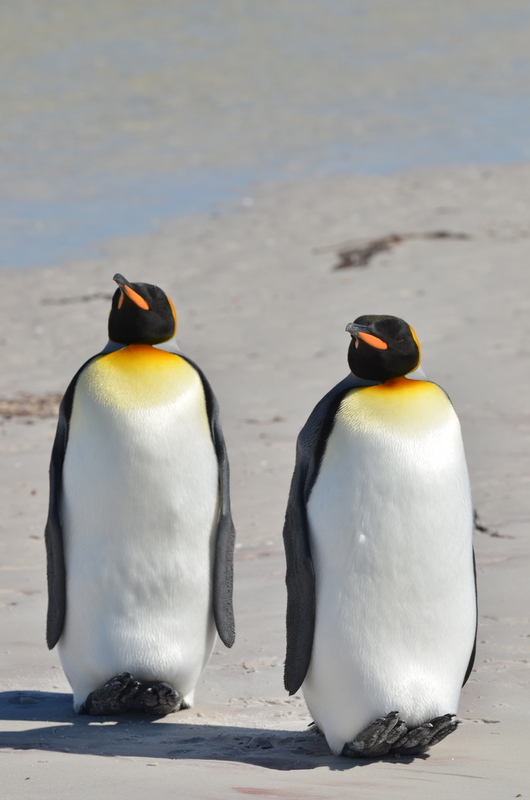 Sometimes the king penguins stood on their heels. Sometimes they marched in a circle. Too soon, our time was up. We had some sandwiches that were an odd combination of chutney and other random ingredients, and bumped our way back to Stanley. What a spectacular day! 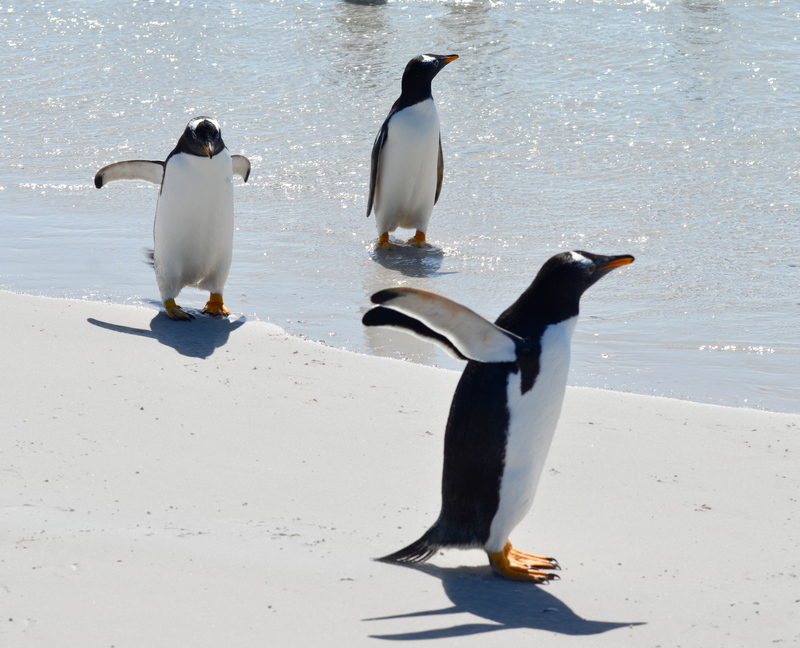 If you are ever offered the privilege of visiting Volunteer Point, jump at it! 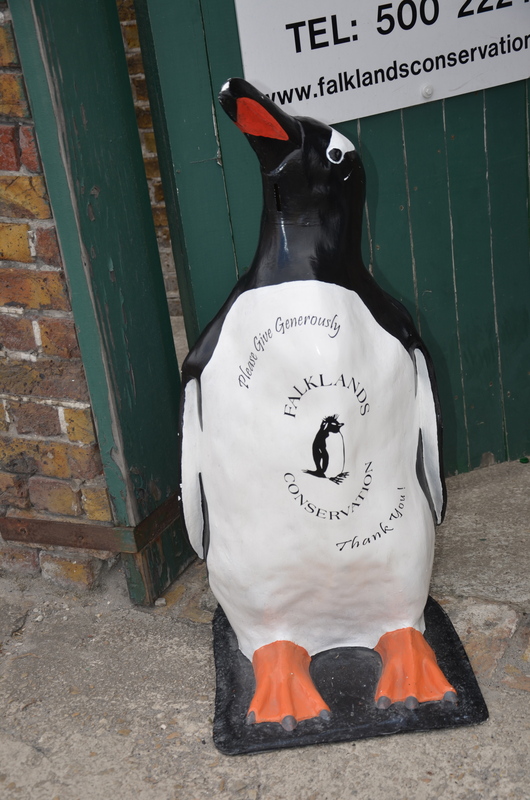 Or, stay home and consider sponsoring a penguin here. All right, I’m just putting it out there. I’m a huge opera fan. So when I was in Buenos Aires, I naturally had to see the storied Teatro Colon even though it was summer and the theater was dark. Since I couldn’t see a performance, I settled for a guided tour. The original Teatro Colon was built in 1857, but was demolished in 1888 to make way for the building of the Banco Nacion. 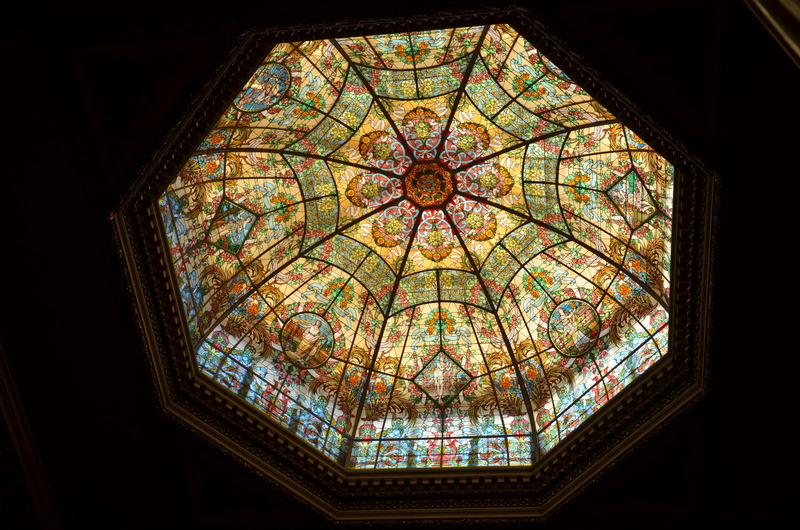 Work on the new Teatro Colon began in 1889. Today’s Teatro Colon opened in 1908 with a performance of Verdi’s Aida. The hall immediately became famous for its outstanding acoustics. All the opera greats found their way to Buenos Aires, touring there as readily as to the Met and La Scala. The theater went to seed a bit over the years, but a restoration was started in 2005 and the theater reopened in 2010. What a restoration! The theater is absolutely beautiful, even without the performers. A really good description of the architectural history of the theater is here: http://www.en.wikiarquitectura.com/index.php/Colon_Theater But here’s a thumbnail version: there was a competition that was won by Francisco Tamburini, an Italian architect who had worked in Buenos Aires for many years. Just as the work on the theater commenced, Tamburini died. 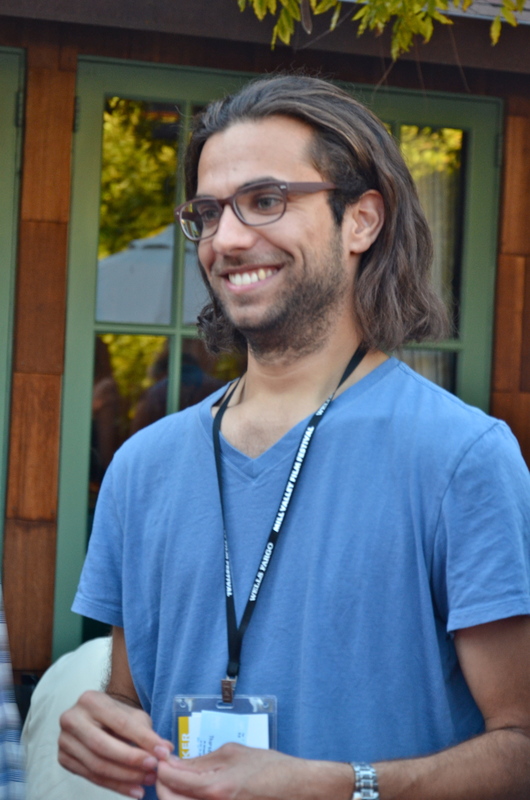 The project was taken over by Victor Meano, who was murdered in his home. This theater started to feel like King Tut’s tomb when even an Italian financier, the licensee of the Colon, died suddenly. Finally, Meano was succeeded by Julio Dormal, a Belgian, and the curse was broken. The final building demonstrates both Italian and French styles, highly ornamental with complicated decorative elements. The concept of the architecture was to allow the opera-goers to ascend to a higher plane as they entered the theater. This first approach is the grand staircase topped by a spectacular dome. 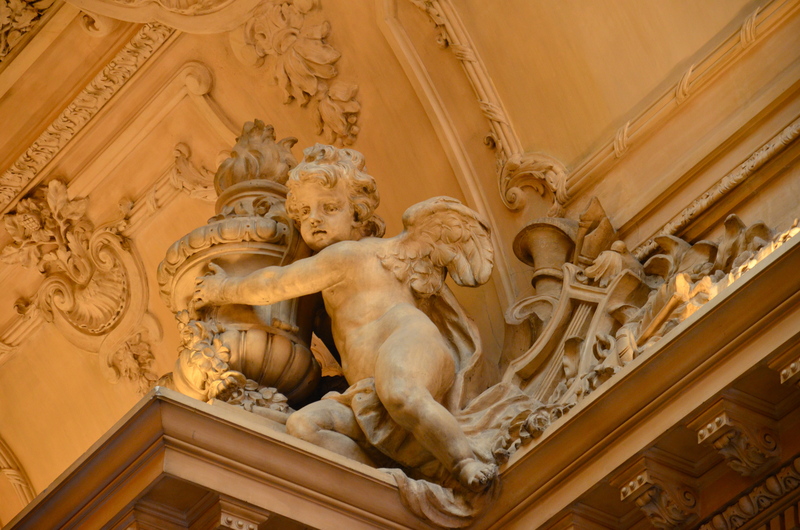 The hall of composers is full of busts of composers guarded by cherubim. 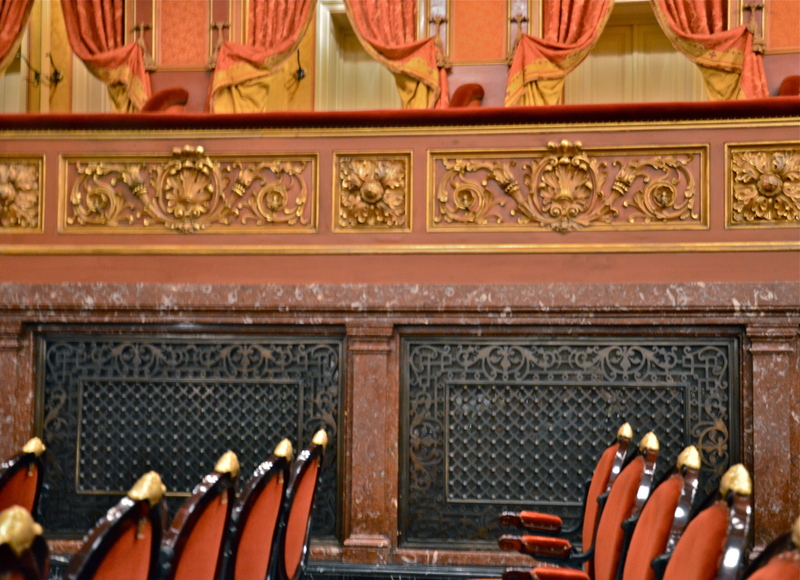 The most elegant area of the theater is the Salon Dorado, or Golden Hall. Only ticket holders in certain sections of the theater are allowed access to this salon. 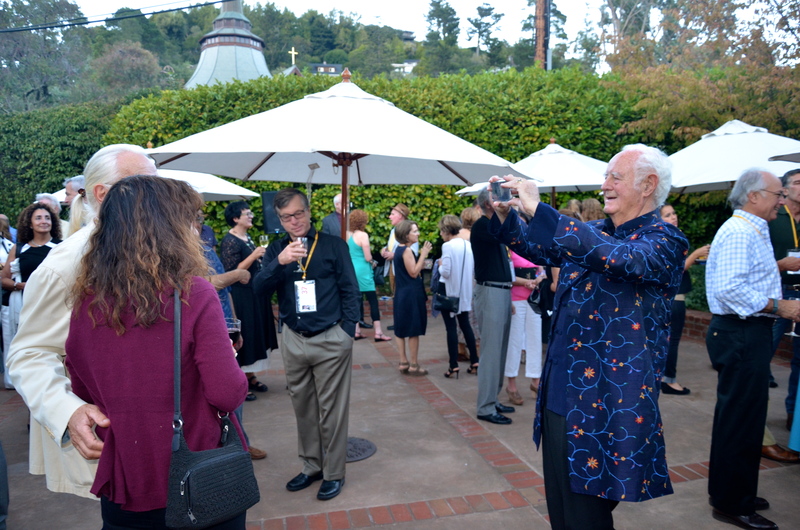 Sorry about the pictures–I always seem to be looking up. When we were finally about to enter the house, the sala, full drama kicked in. The group assembled behind a curtain and—voila!–it was whisked aside and there before us was absolutely the most beautiful theater I have ever seen. I am not a crier, but I cried when I saw it. Even now I get goosebumps when I think about the house. In fact, I was so overwhelmed that I didn’t even take a picture. That’s overwhelmed. Here are some interesting things about the theater. Along the sides of the orchestra seats there are grates. These enclose boxes that were for the exclusive use of women in mourning who would naturally not want to be seen at the opera but, even more naturally, would of course still want to attend. These look like the grates in old churches that allowed the cloistered nuns or anchorites to attend mass. 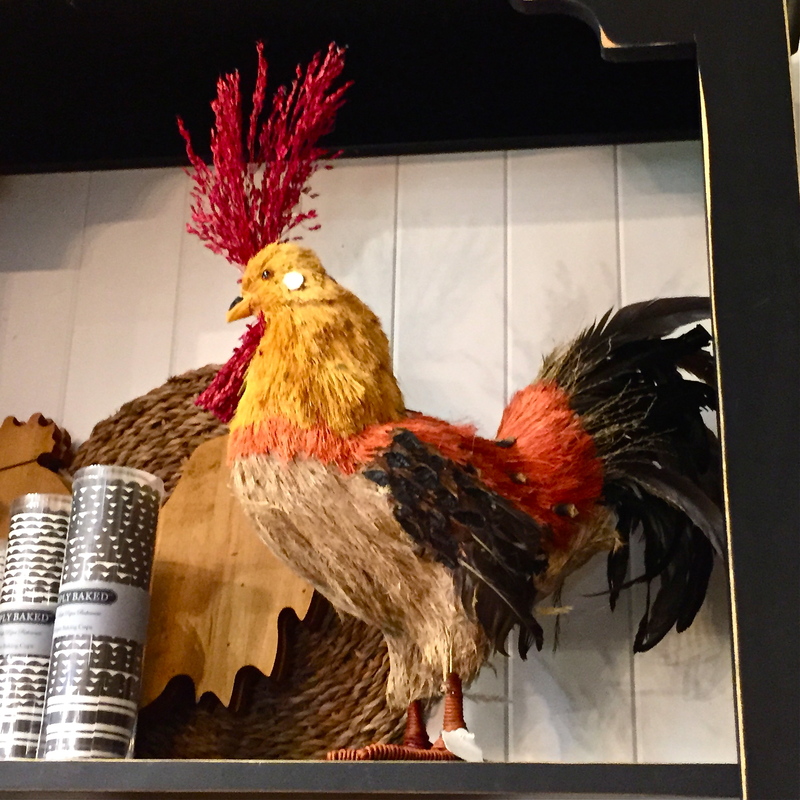 The top galleries–the cheap seats–are known as the chicken coop. There are separate standing room sections for men and women; these are the “cazuela de pie solo para mujeres,” (standing room for women), behind the cazuela section, and the “tertulia de pie” section, one floor above for men. While some tours include a guide who likes to sing, alas, our tour did not include a demonstration of the fabulous acoustics. 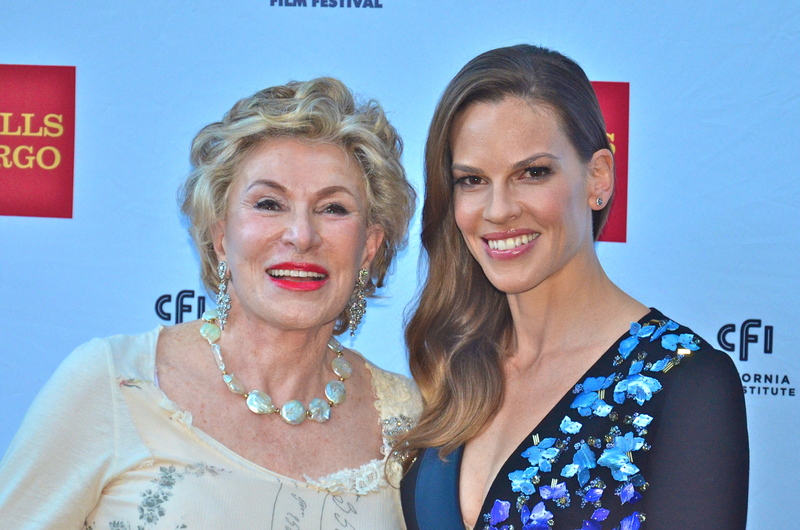 For more information about performances at the theater, visit the website here. 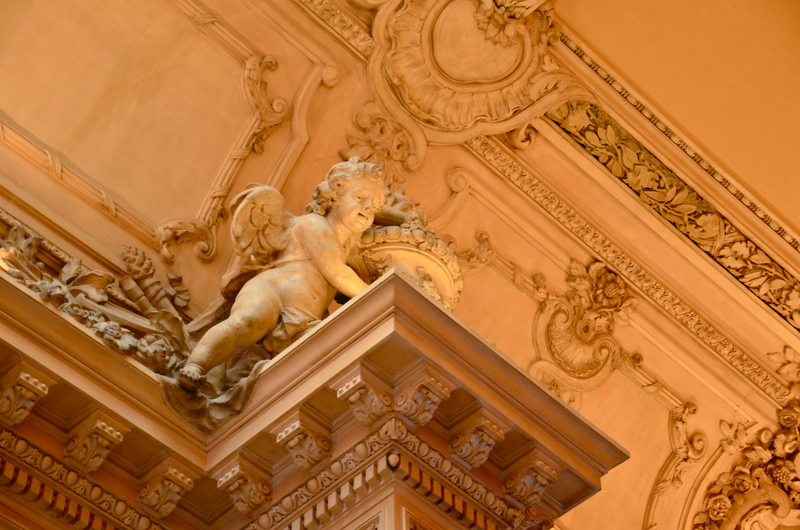 The opera season runs generally from April to July, and then September, November, December. The ballet season is interspersed, playing in March, May, August, October, with the inevitable Nutcracker in December. This is bad news for opera fans traveling to South America during the South American summer season, but that’s where the theater tours come in. 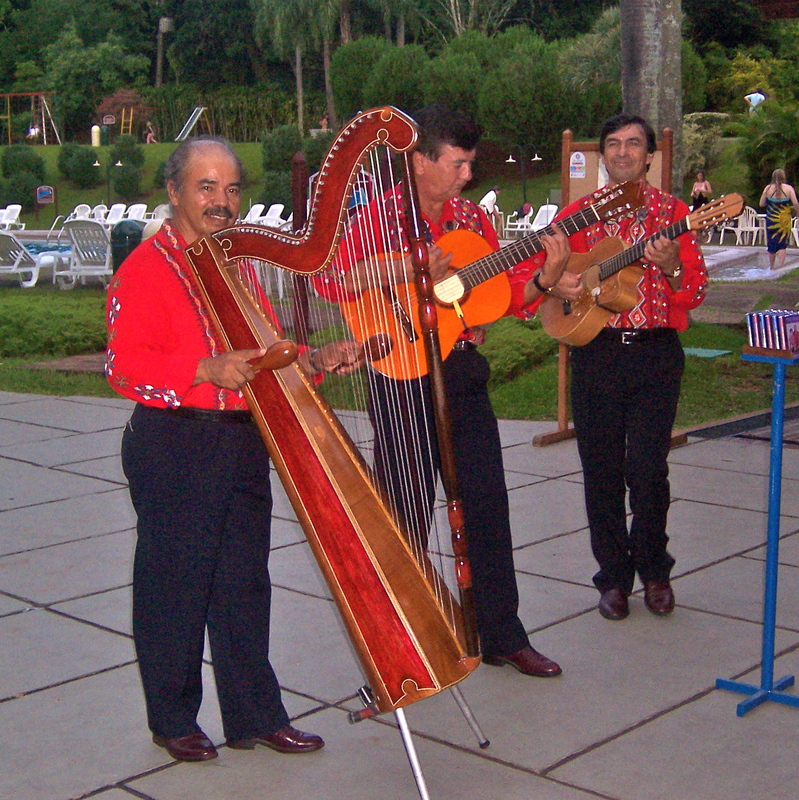 There are many concerts, theater productions, touring companies, and special performances throughout the year. The Teatro Colon is at Avenida 9 de Julio. 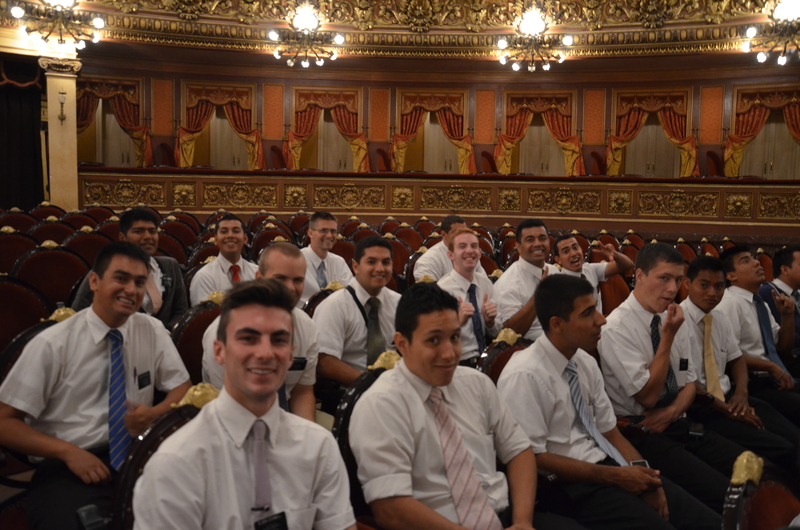 Guided tours of the theater are given daily, every fifteen minutes, from 9:00 a.m. to 3:00 p.m. They last about 50 minutes. 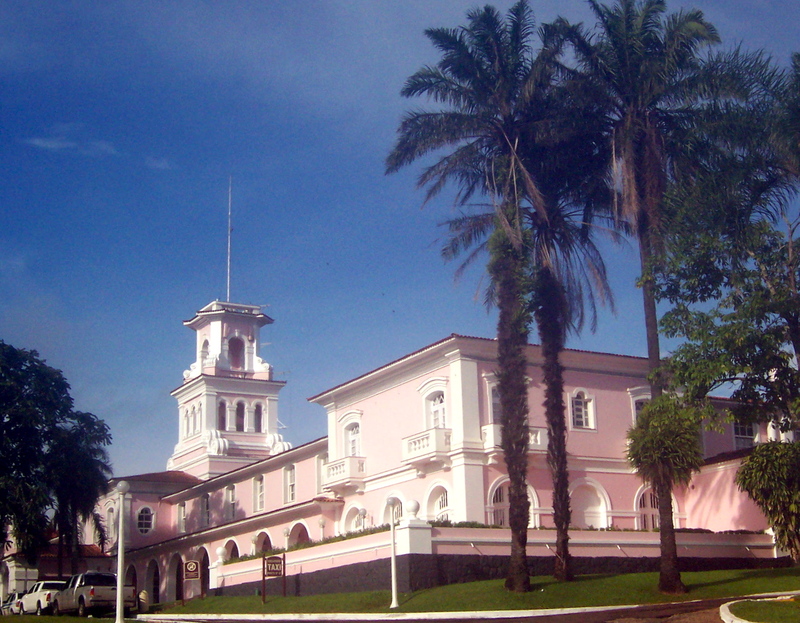 Tours are given at different times throughout the day in English, Portuguese, or Spanish. You can reserve tickets in advance by emailing here. You can also get the tickets at the theater on the day of the tour. The entrance to the box office is at Tucuman 1171, around the side of the building. Be sure to go early if you want to get one of the English tours. Once you have your ticket, you can wander around but come back to line up at least fifteen minutes before the tour begins. 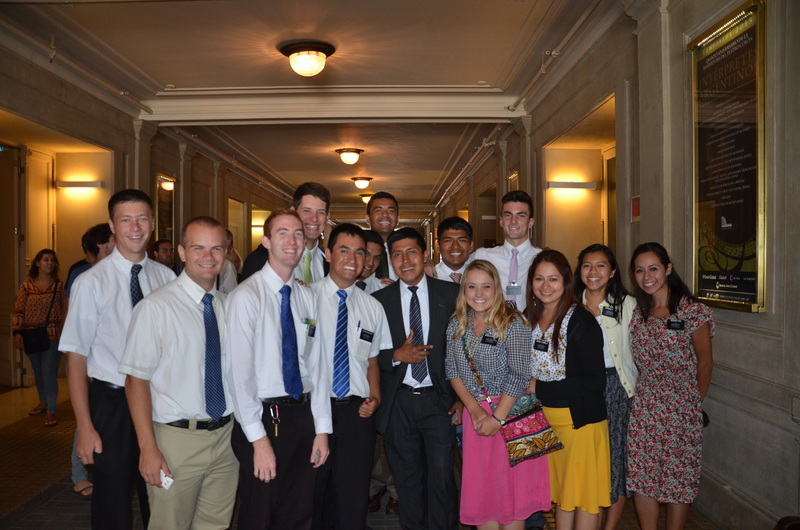 Only 34 people are allowed per tour. We are having a drought here in Northern California, so my vegetable boxes went unplanted this summer. Never fear! 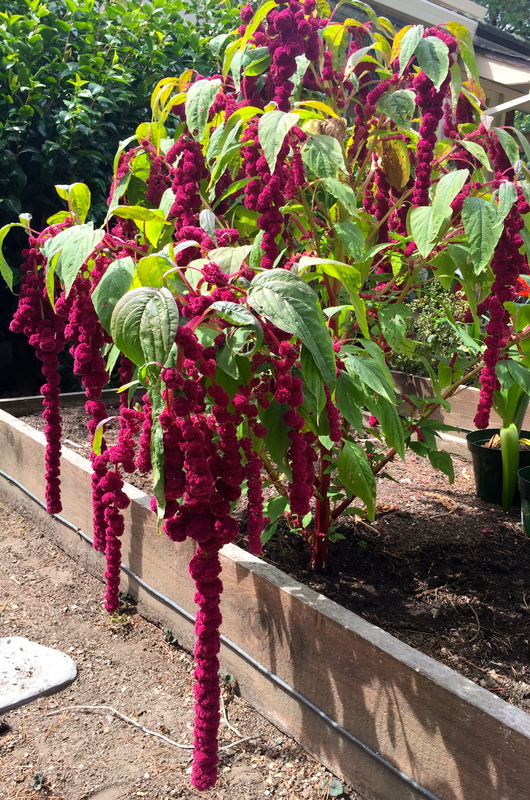 Amaranth seedlings, volunteering from one tiny plant I bought at the farmer’s market a few years ago, have sprung up everywhere and the pendulous spikes of fuzzy magenta flowers now grace my otherwise dreary garden. 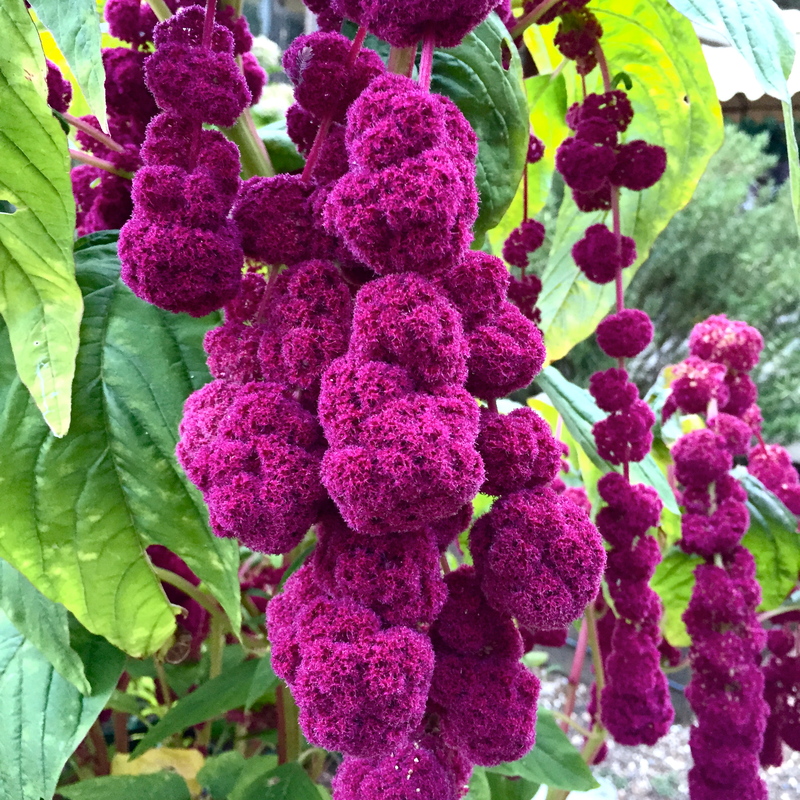 What a remarkably versatile plant. 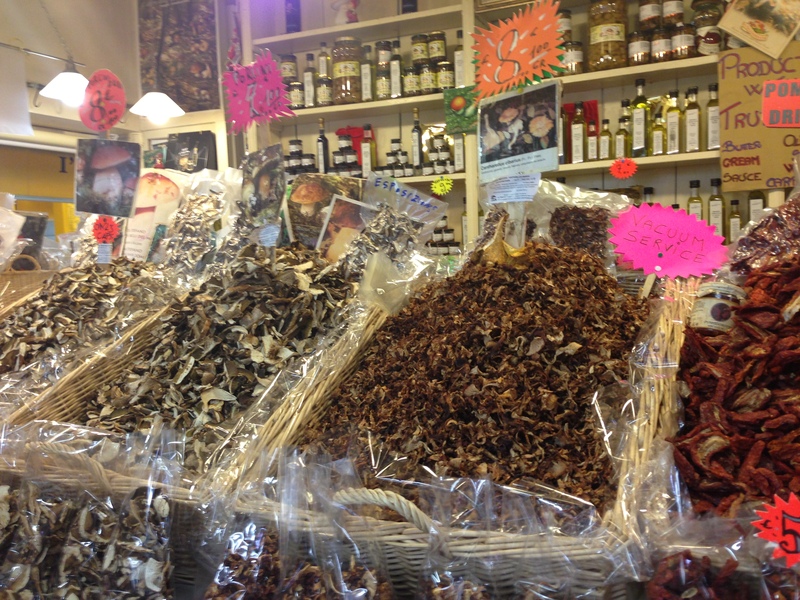 You can cook the grain or eat the leaves or just enjoy the crazy flowers. 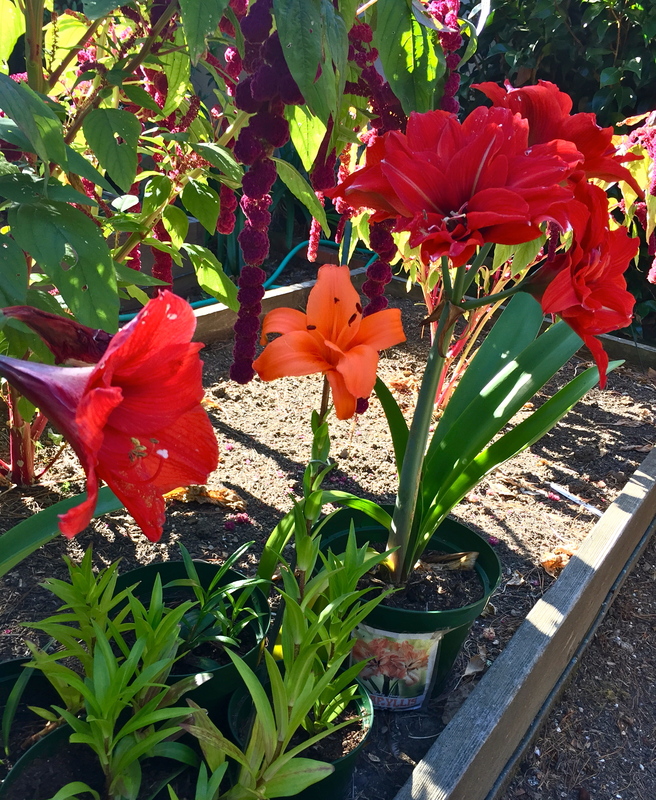 In other surprises, two amaryllis plants that were supposed to be dying back (since Christmas) have pushed up marvelous summer blooms. I suppose that’s the natural thing for them to do, after all. One is an ordinary red one from Trader Joe’s that is many years old. 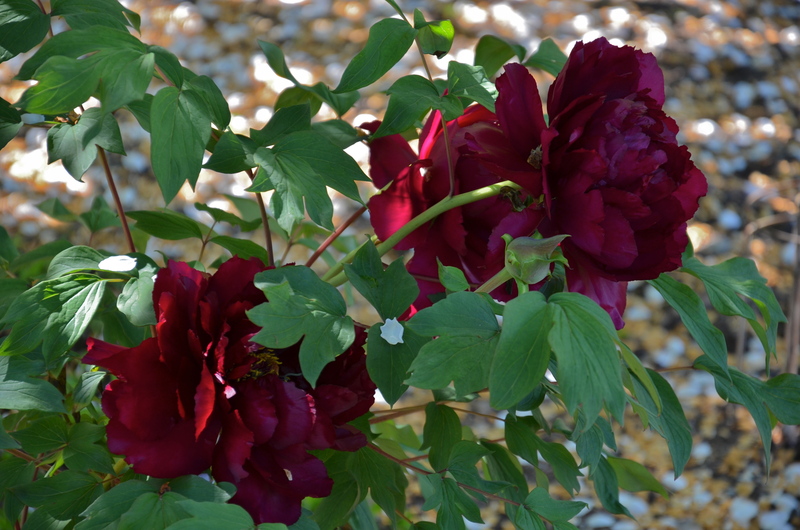 The other is a ‘Lady Jane,’ putting on a much better show than it did at Christmas. The last surprise is the little forest of daylilies that arose from a bulblet cloned by my daughter in freshman biology lab at Mount Holyoke, oh, six years ago now. For many years we didn’t know what we had as we got only a sad single shoot that would die back. It probably didn’t help that the poor bulblet had been rattling around in my daughter’s backpack for about three months before resurfacing. It was fairly discouraging until I was advised by Mike’s Backyard Garden to repot and be patient. With all that growing and dying back, the five-year-old bulb finally got the oomph to put out a flower and the elegant Stella was born, shown here with Luigi. 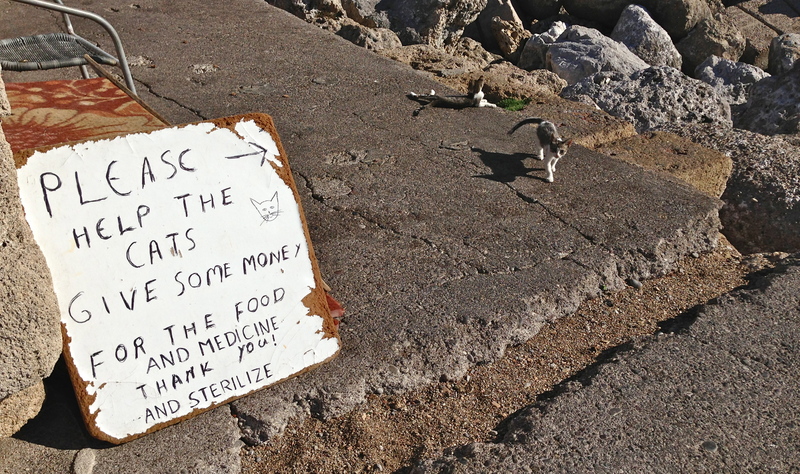 While she was at it, Stella threw off several potfuls of baby bulblets. I replanted the bulbs and put them outside to brave conditions beyond my indoor intensive care unit. This year we are watching to see what we will get. More of the same or an oddball mutation? The first of this year’s plants has just bloomed! So, while my drought-stricken garden is bare of tomatoes, we still have some things to watch and cheer along. 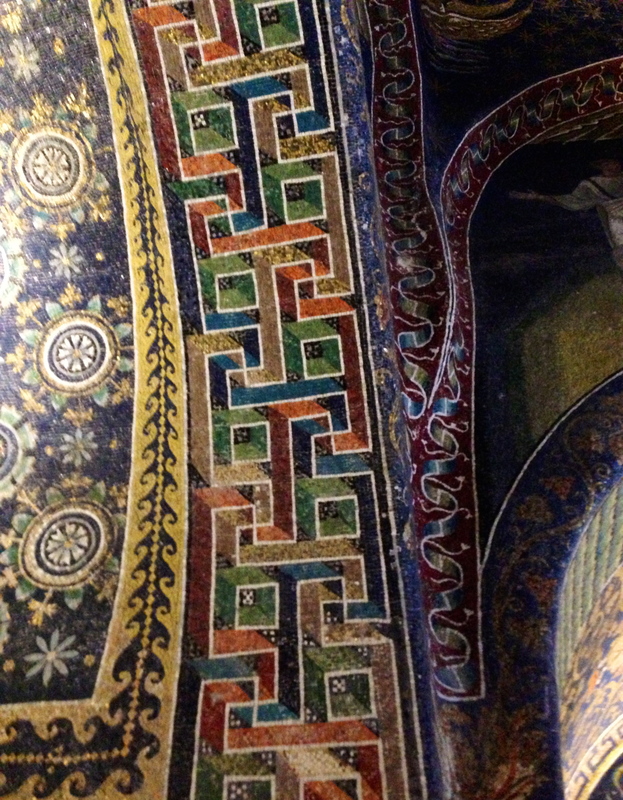 A pilgrimage to Ravenna is rewarded by glorious, awe-inspiring, Byzantine mosaics. 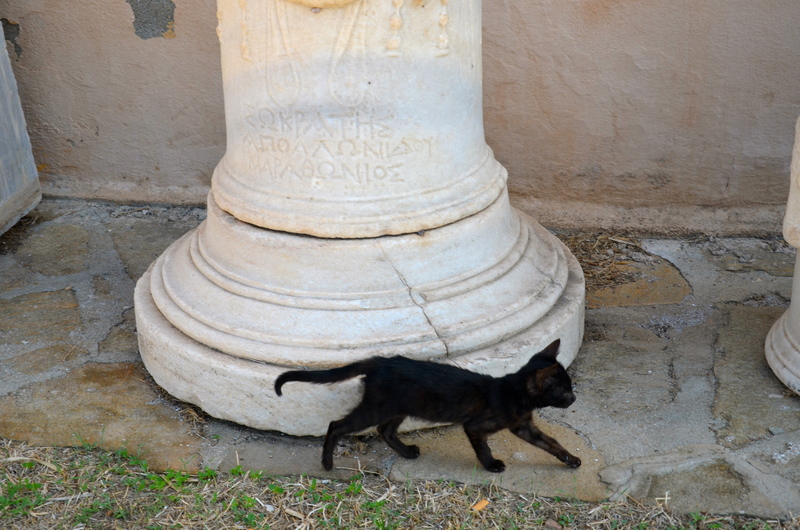 As I was snoozing through slides in my first college art history class–it was so nice and warm and dark, after all–I suddenly snapped to attention when I saw Ravenna. 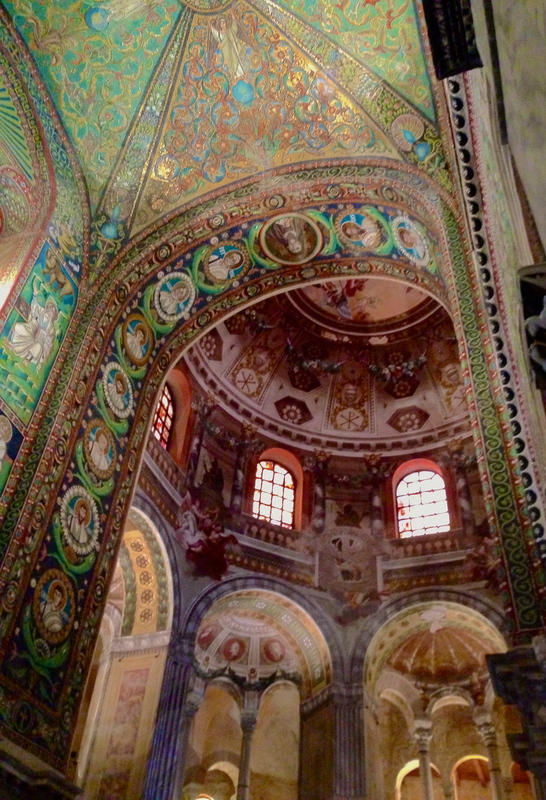 Image after image of massive gold and green mosaic domes. 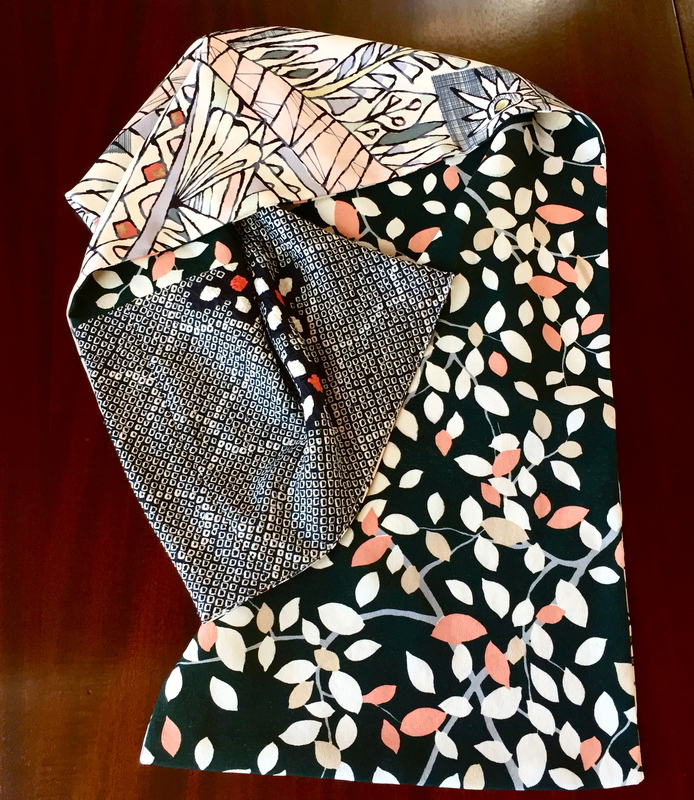 Patterns jammed next to each other in the craziest way that really worked. 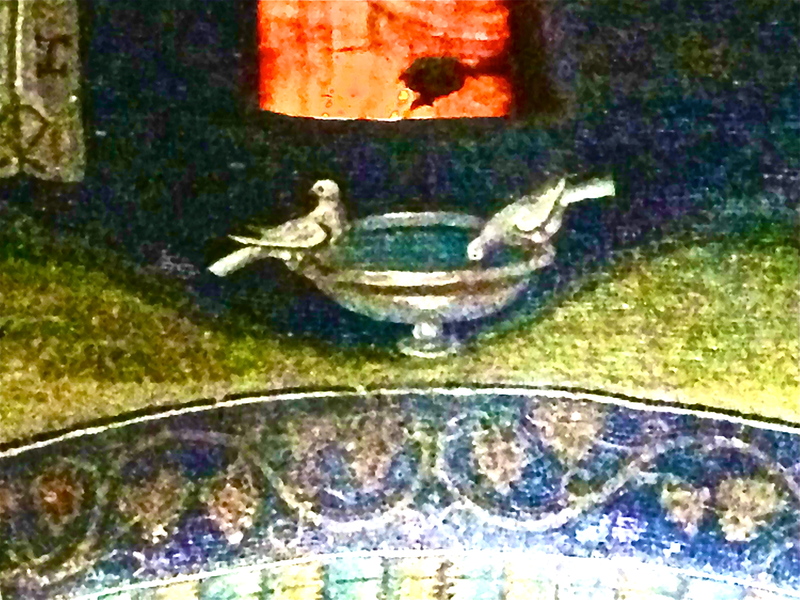 Birds, harts, saints, Empress Theodora, all marching across ceilings and walls. Where is this place? 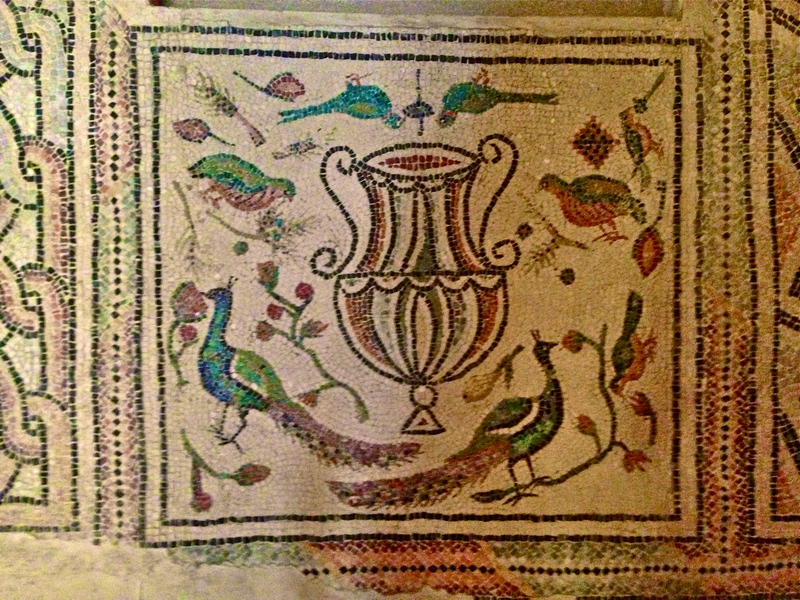 The professor said it was really essential to spend a full day in Ravenna in one spot watching the light change on the tiny tesserae. I filed that away for future reference and went back to sleep. First, A BIT OF HISTORY. If you just want to know where to go, skip below. 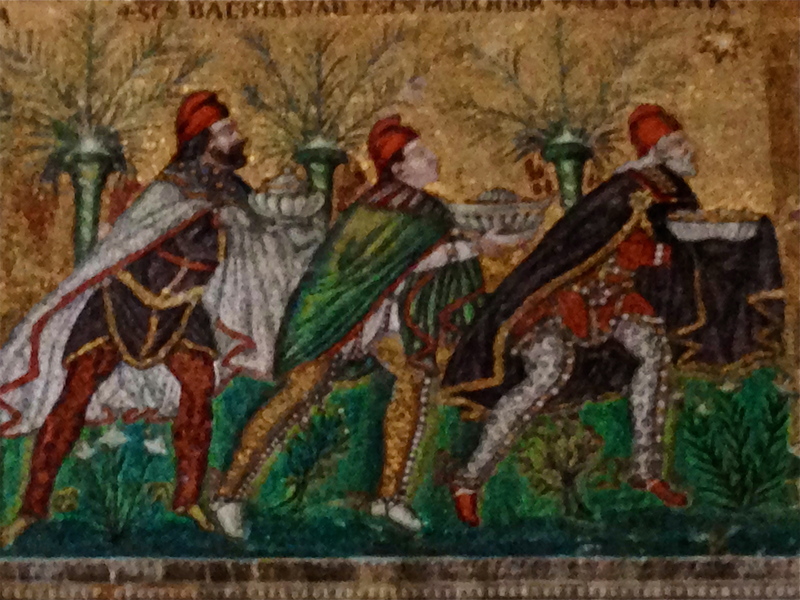 Ravenna may have been founded by ancient Etruscans, but the history is unclear. 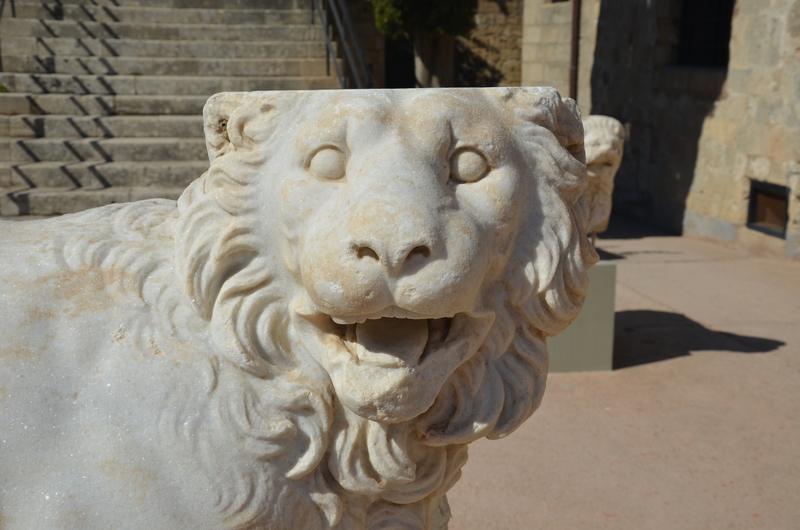 The Romans took over in 89 B.C.E. and in 49 B.C.E. 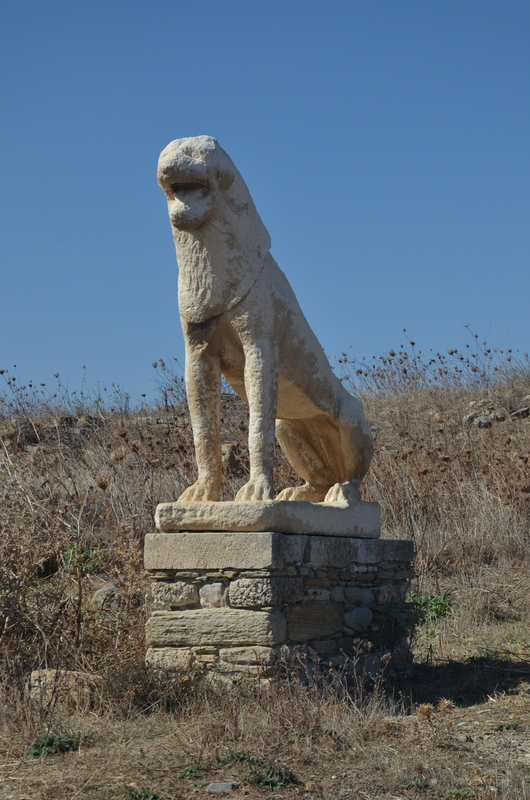 it is where Julius Caesar mustered his troops before crossing the Rubicon. In 410 A.D. King Alaric of the Visigoths took hostage Galla Placidia, the daughter of Emperor Theodosius I, but she later returned to Ravenna with her son, Emperor Valentinian III. 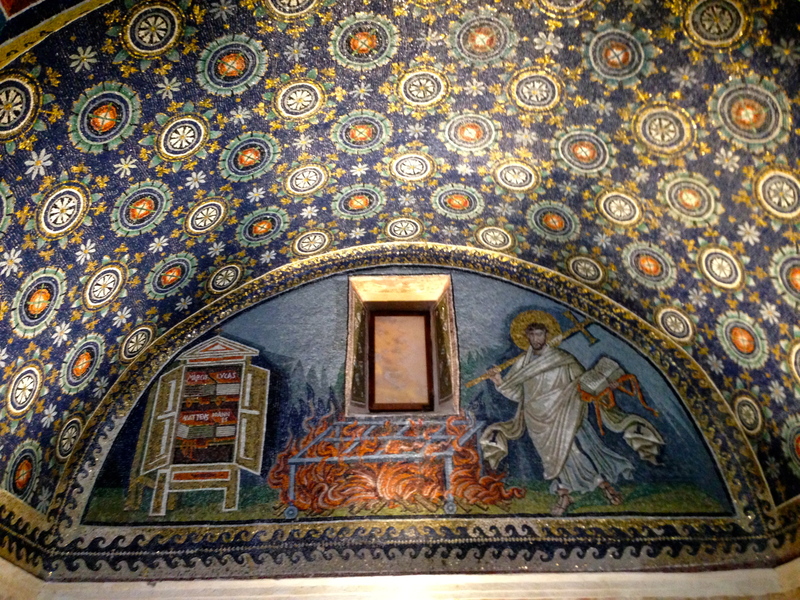 This is important because one of the most beautiful sites in Ravenna is the Mausoleum of Galla Placidia. This is misnamed because she is not in fact buried there, but it’s nice to know who she was anyway. 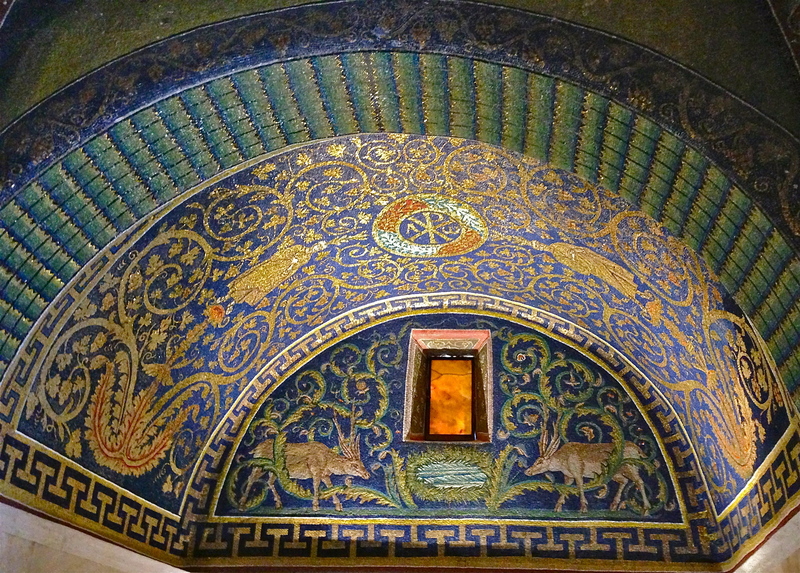 During the period of relative peace following her return, several of the major Ravenna monuments were built, including the Orthodox Baptistry, San Giovannia Evangelista, and the (not really) mausoleum of Galla Placidia. The Ostrogoth king, Theoderic the Great took Ravenna in 493 and established the capital of the Ostrogoth kingdom in Ravenna. 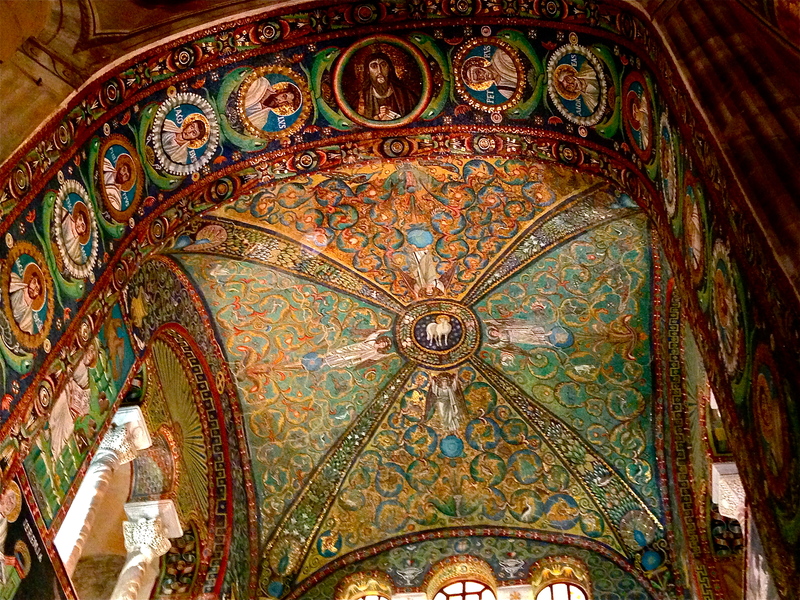 Among other buildings, Theodoric built his palace church, the gorgeous Sant’Apollinare Nuovo. In 540, the Eastern Orthodox Christian Byzantine Emperor Justinian I (with his extraordinary wife, the ex-circus performer Theodora), based in Constantinople, then called Byzantium now called Istanbul, conquered Ravenna and established the Byzantine seat of government in Italy there. 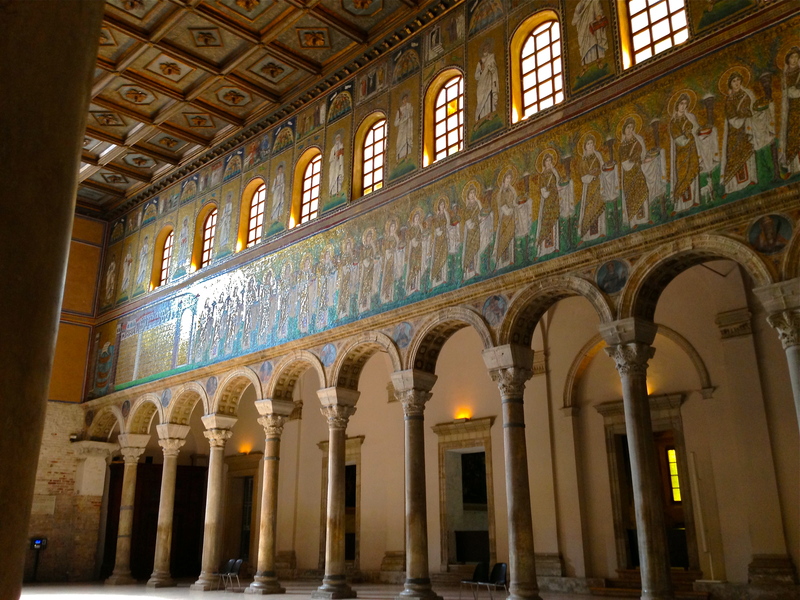 From 540 to 600, the Byzantine bishops in Ravenna went wild building amazing churches, including the spectacular Basilica of San Vitale. 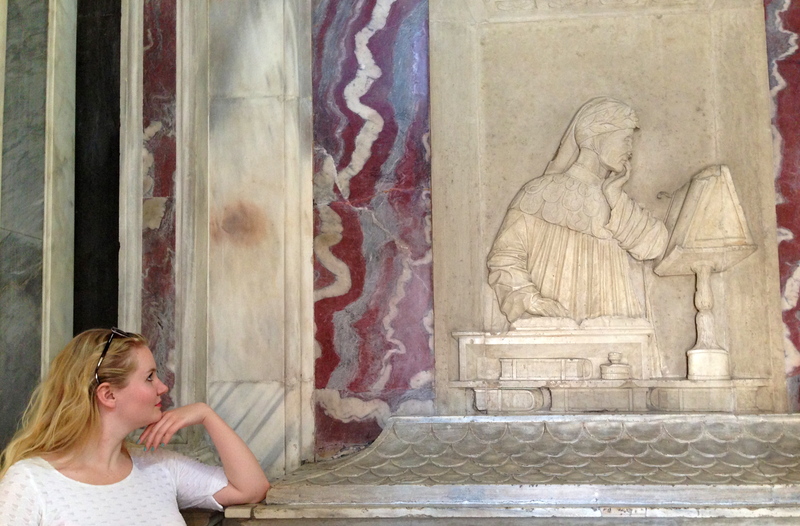 Alas, Justinian and Theodora never actually visited the Basilica that features such glamorous portraits of them. 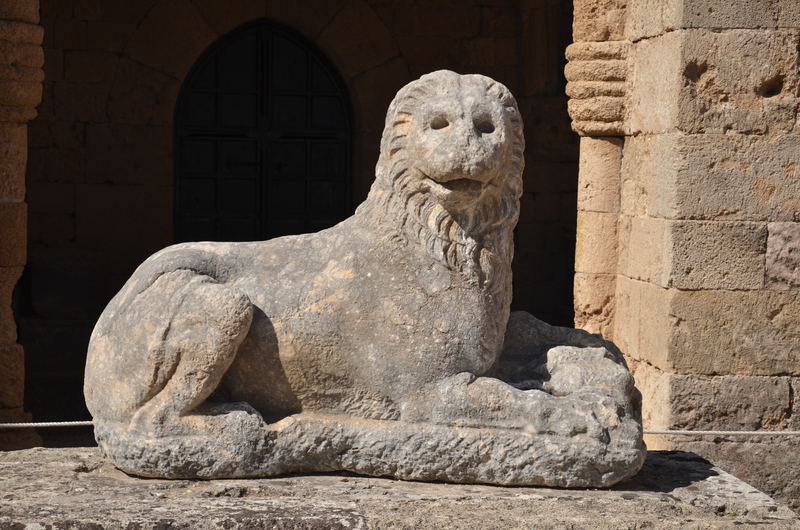 Justinian’s court historian, Procopius, wrote a comprehensive history of Justinian’s building projects in his book, Buildings . For a juicy look at the real doings of Justinian’s court, however, read Procopius’ The Secret History . 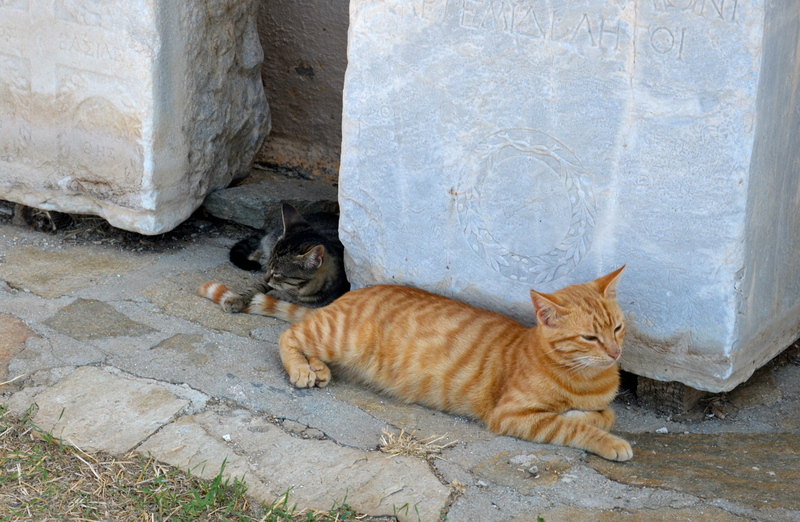 At this point, we stop our brief history because it is the Byzantines we love. Byzantine art is exclusively religious, specifically Eastern Orthodox Christian, in subject. 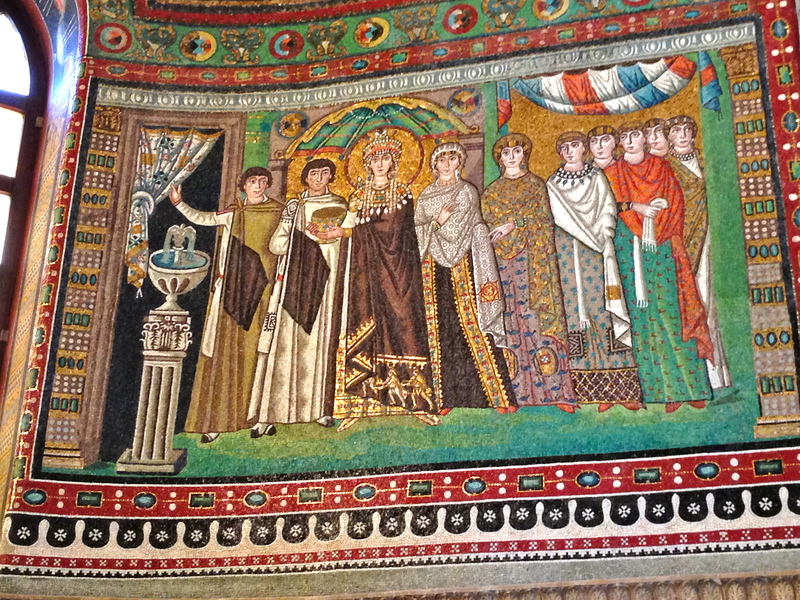 Even the famous mosaics of secular rulers Justinian and Theodora show them in a religious context. 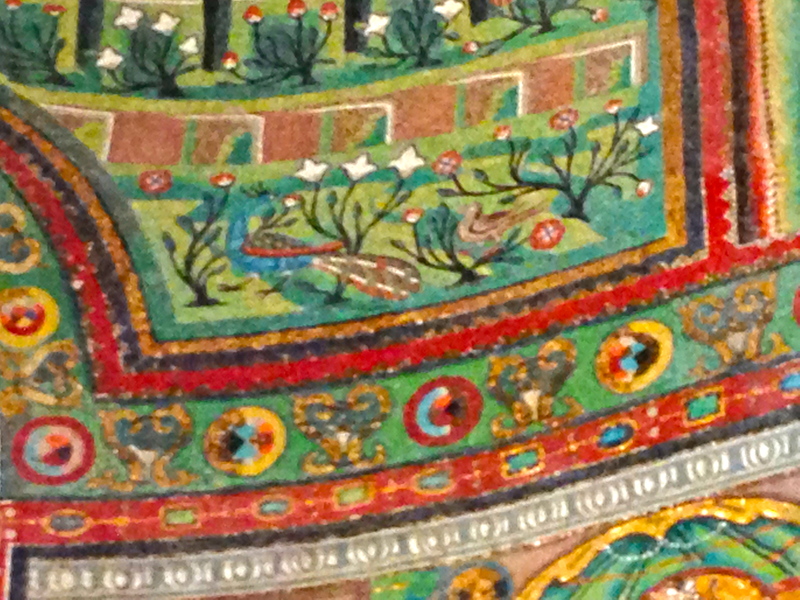 Within this rubric of religious art, however, there is much room for decoration with pattern, flora, fauna, and color. The “painting” is done with tiny glass tiles called tesserae. The singular is tessera. 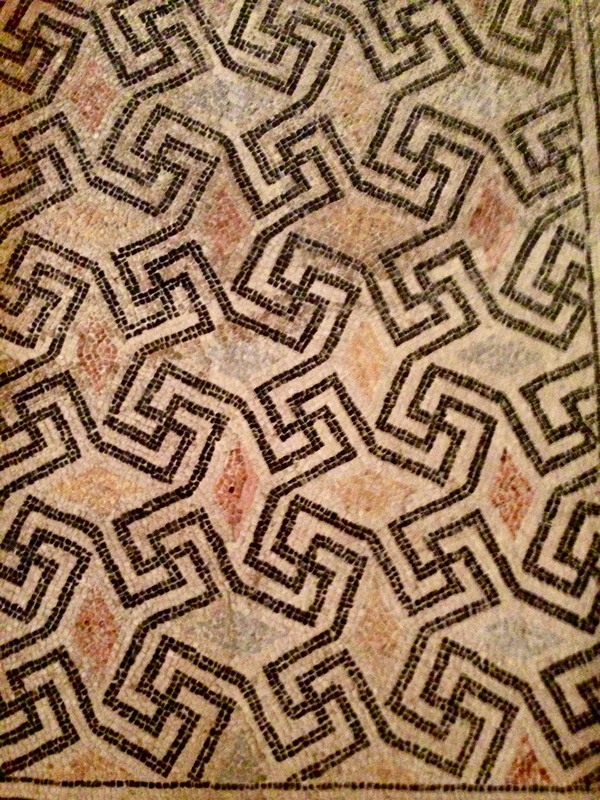 Many of the tesserae used in Ravenna were clear glass on two sides, sheathing a gold leaf center. This allowed for the light to reflect off both the glass and the gold, creating a glittering, luminous effect. 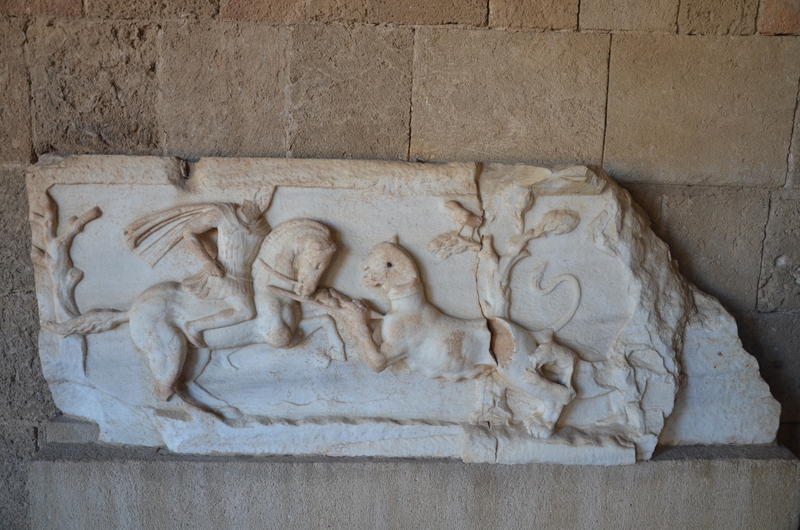 While most of the terrerae were made of glass, often the faces, rough garments, or natural features like rocks were made from tiles of marble or limestone. A beautiful historical and critical study of Byzantine art, much of it about Ravenna, is Andre Grabar’s Byzantine Painting. This picture is from Byzantine Painting. I couldn’t get that close! 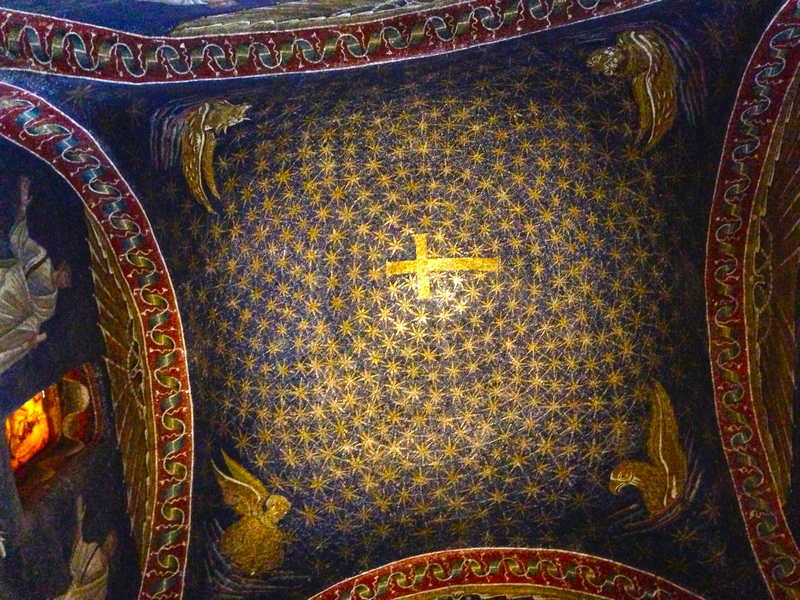 The earliest of the famous Ravenna monuments, the “mausoleum”–quotes because Galla Placidia is not actually buried there–is a small brick building in the form of a Latin cross. 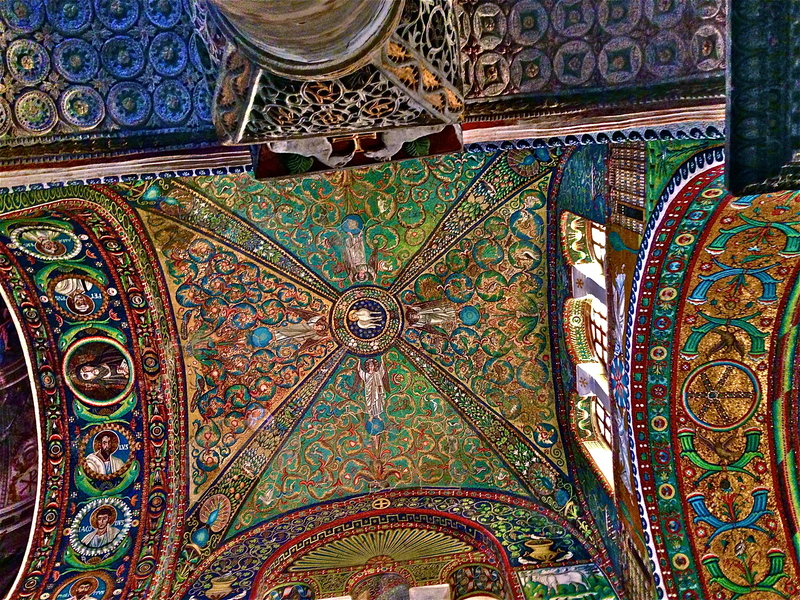 The mosaics ornamenting the barrel vaults and dome here pre-date the Byzantine conquest and are Roman, not Byzantine. The high windows are glazed with Alabaster, giving a warm golden light. 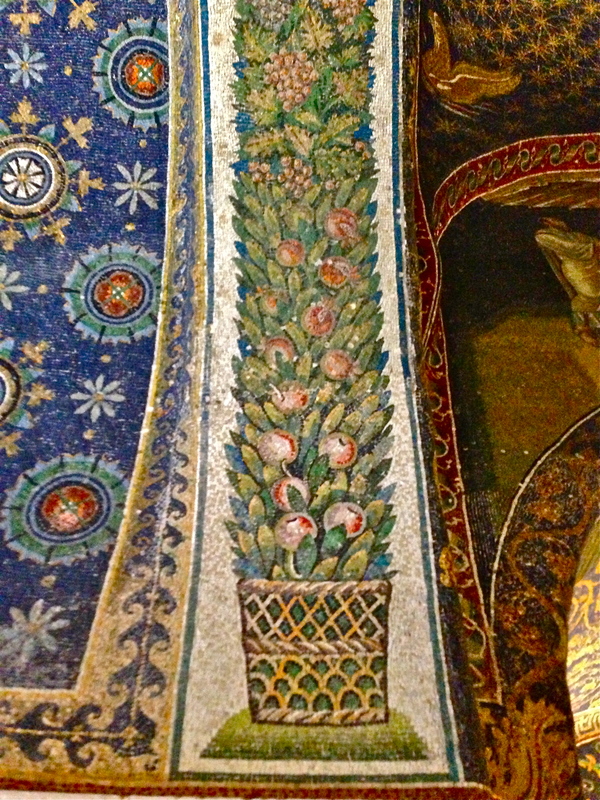 The symbolic and decorative mosaic patterns soaring above the marble walls are amazing. It is so small a space that you are engulfed by the art. You are only allowed in for a limited time, and maybe that’s just as well considering that one could easily be overcome by the closeness and glory of it. When we went for the second time, it was very early morning and no other visitor had yet arrived. After our allotted visit time, the guard, who recognized us from the day before when we were evacuated from the Archiepiscopal Museum during a fire alarm, spoke to us in Italian, mostly concerned that my ticket didn’t show that I had been to the museum when clearly I had. When I answered accidentally in my default Spanish that it was a new ticket since I had used up my previous one the day before, he announced with delight that he was actually Spanish and we had a nice conversation. 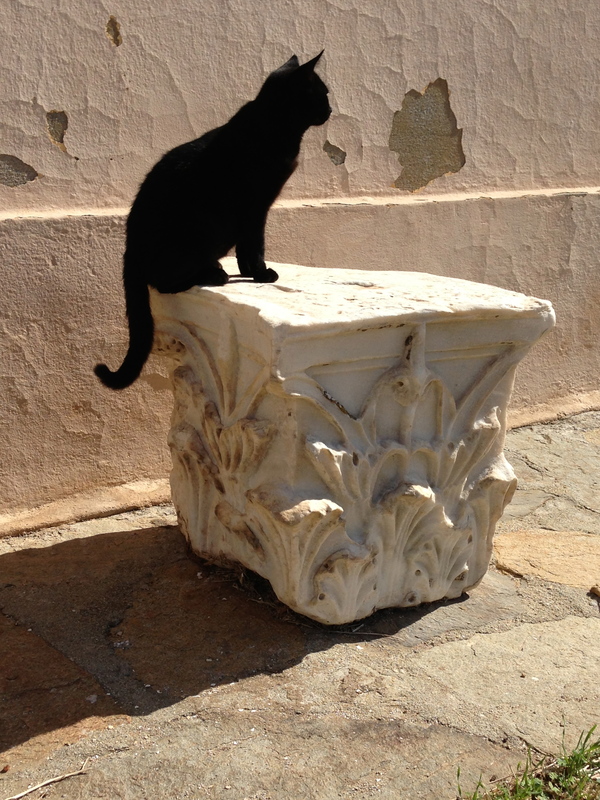 He invited us back into the mausoleum and we had it to ourselves until someone else arrived. Heaven! In fact, here is the starry night of the dome–almost heaven. 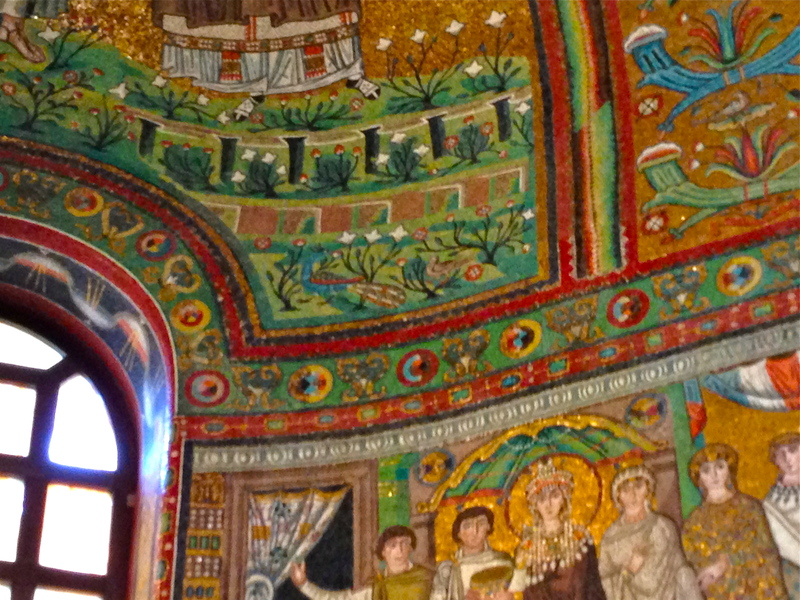 It is said that Cole Porter was inspired to write “Night and Day” by a visit to the Galla Placidia. A masterpiece. Absolutely. The apse will make you gasp. On facing walls are the famous portraits of Justinian and Theodora with their retinues. But look around! Peacocks, saints, flowers . 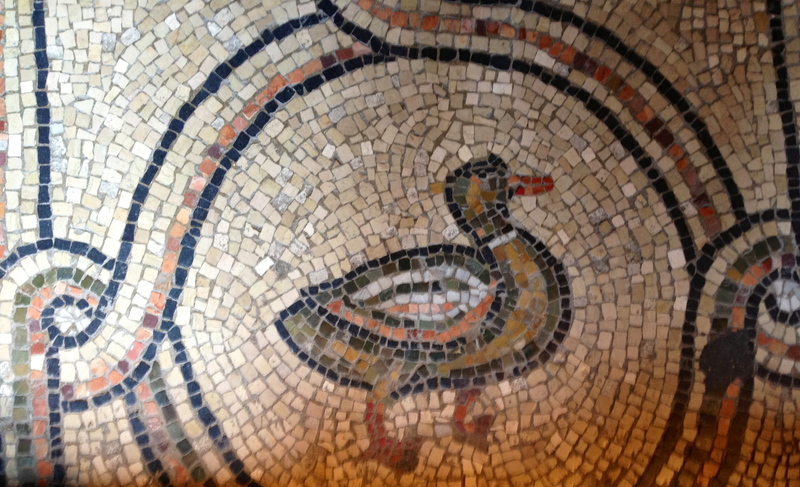 . . there is no moment in the mosaic unadorned. And while you’re there, look down! The floors are gorgeous, too. While I was at San Vitale early one morning with only a few fellow viewers, a basso profundo was chanting somewhere in the mysterious depths of the church. This was a fine reminder that this is a sacred site, notwithstanding the hoards of tourists tromping through. Early arrival is key! In the rectangular, airy nave, you are surrounded by miracles and processions. Along the top on one side are 13 small mosaics of Jesus’ miracles. Under them is a procession of 22 mosaic virgins led by the 3 Magi, identified here for the first time as Balthasar, Melchoir and Caspar. Keep an eye out for these wise men because they sport fantastically outrageous outfits that would make really great pajamas. On the other side of the nave are 26 martyrs, a few saints, and above them, 13 mosaics of the passion of Christ. Most of the figures and faces are similar and undistinguished, giving a rhythm to the whole. While you’re at Sant’Apollinare Nuovo, swing by the nearby Basilica of Saint Francis, burial place of Dante Alighieri. Despite the fact that he is known as a Florentine poet, he spent most of his life in exile, expiring in Ravenna in 1321. Battistero Neoniano – piazza Battistero. More information about tickets is available here. We stayed at the M Club De Luxe B&B, just at the gates of the old town. 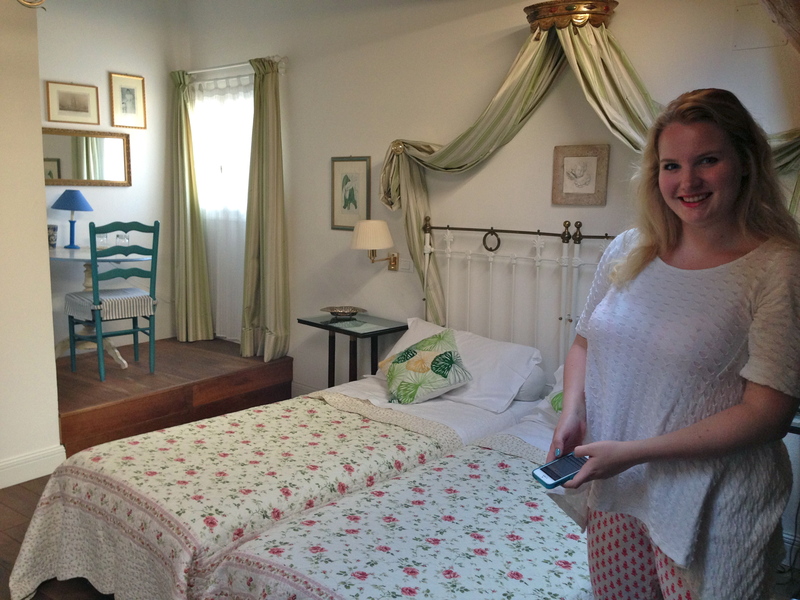 It is a quirky bed and breakfast in a building built by Venetians in 1452 for the noble family La Torre-Magni. 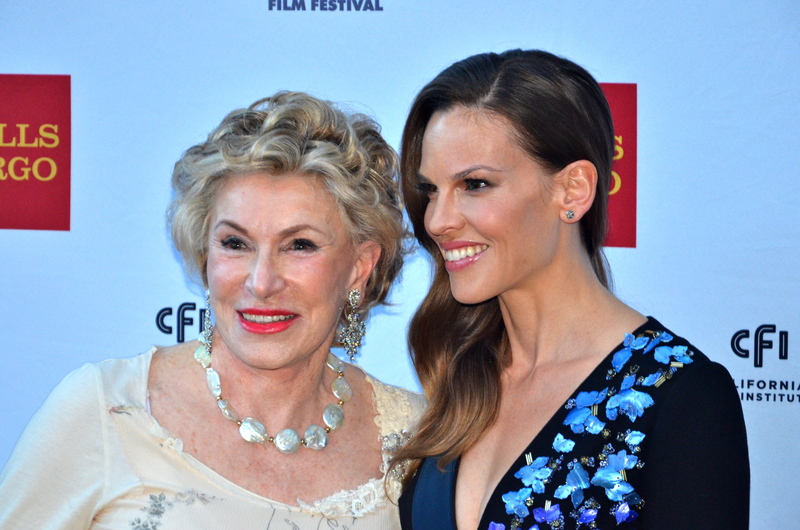 It has been in host Michael Scapini Mantovani’s mother’s family, the Melandris, since the end of the 19th century. 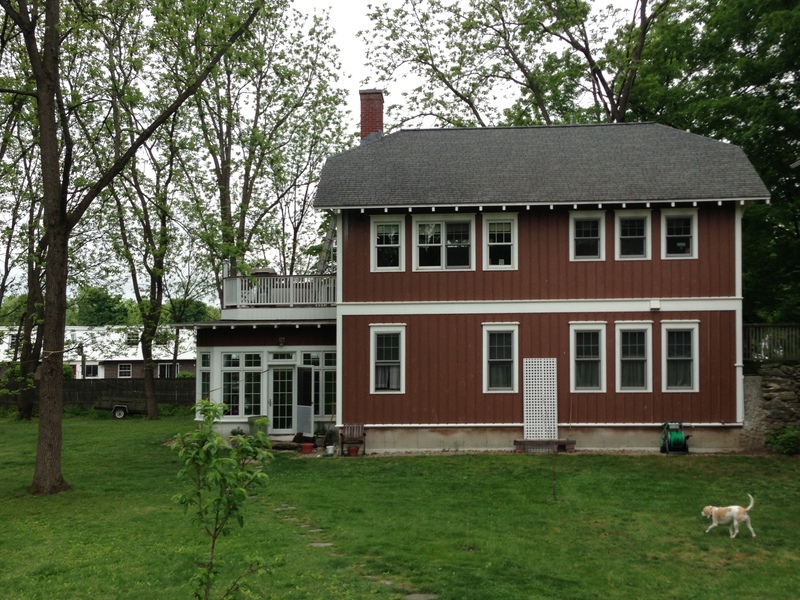 His father, an architect, restored the house from 2002 to 2006. Michael is an earnest host, eager to please you with his breakfast, advice, and parking skills. 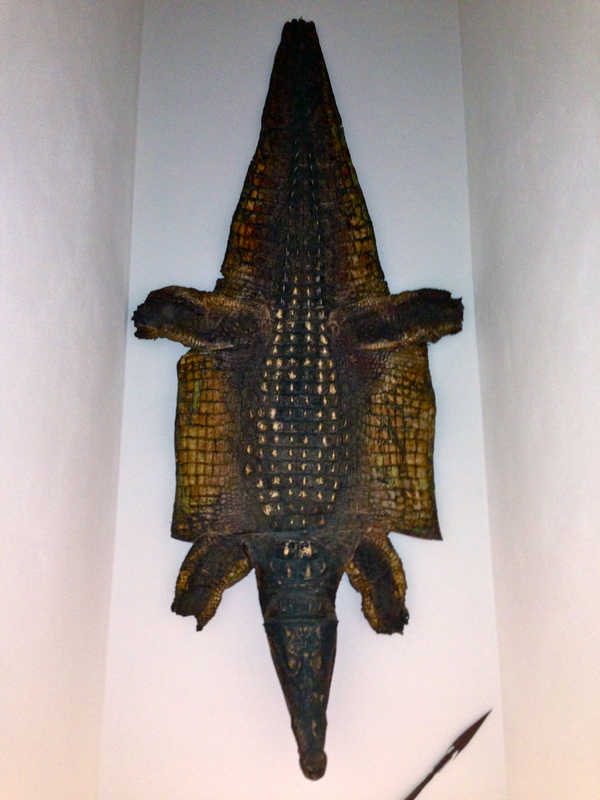 The décor is amusing, including an alligator skin, many paintings, and lots of angels. The rooms are spacious, if charmingly irregular, and are identified by the predominant color used in the decor. Our room was the green room, advertised as “the most elegant at the M Club.” We certainly liked it. The window in the little nook looked over the 5th Century Gate of Adrian. 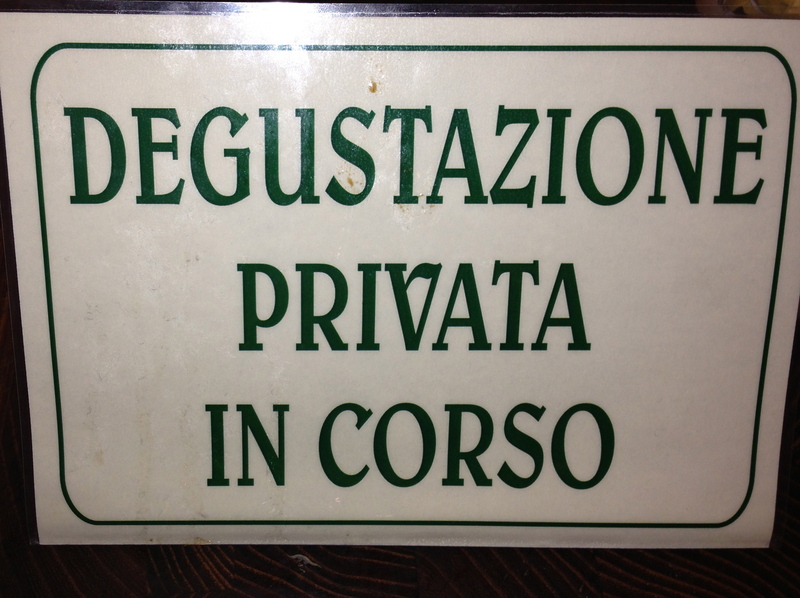 Be sure to make a reservation for private parking at the M Club (10 Euros) as it is absolutely necessary. You cannot drive in the old town. 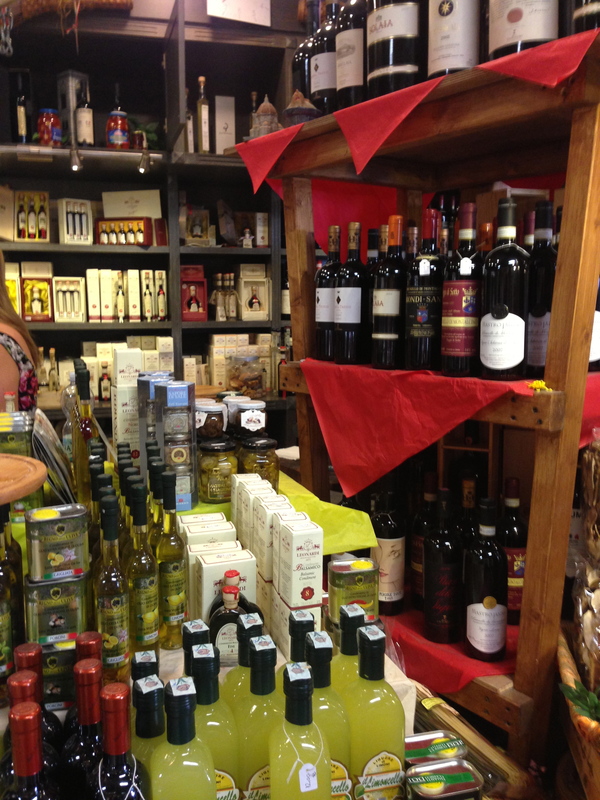 The M Club is very near to San Vitale Basilica and Galla Placidia, the gems of Ravenna. Information about the M Club De Luxe is here. 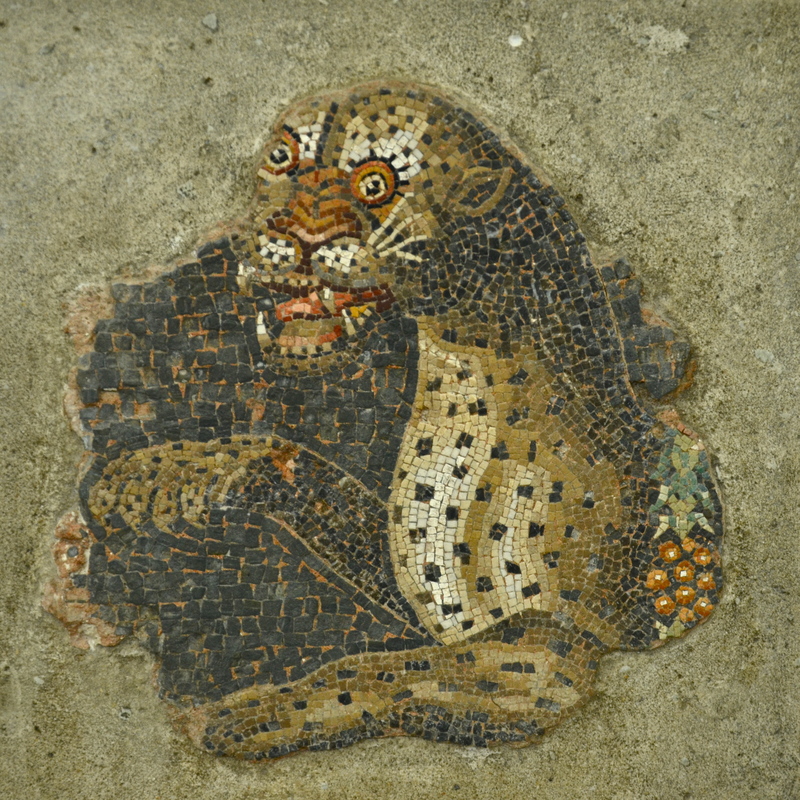 The Mosaic Art School di Luciana Notturni, near the Basilica di Sant-Apollinaire Nuovo offers courses in the art of mosaic. 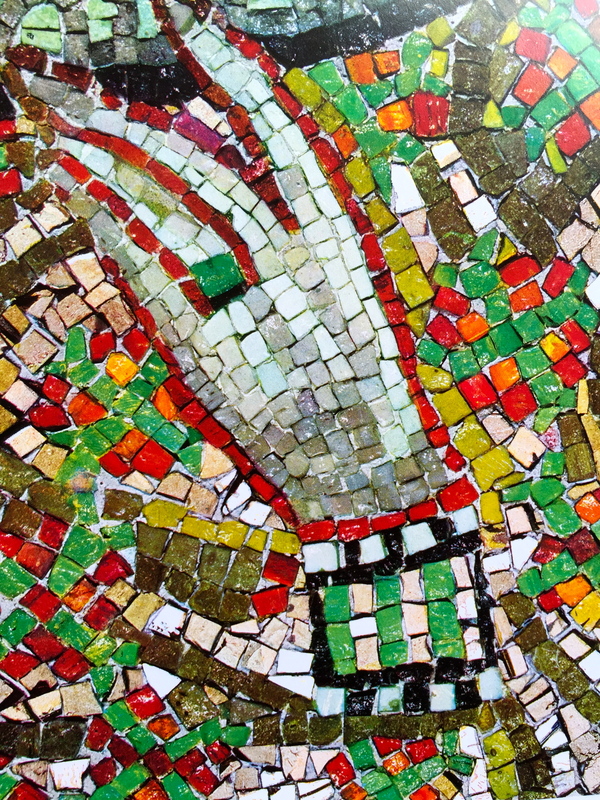 There is an introductory five day course where you make two projects, one a copy of a Roman/Byzantine mosaic and one a contemporary piece. 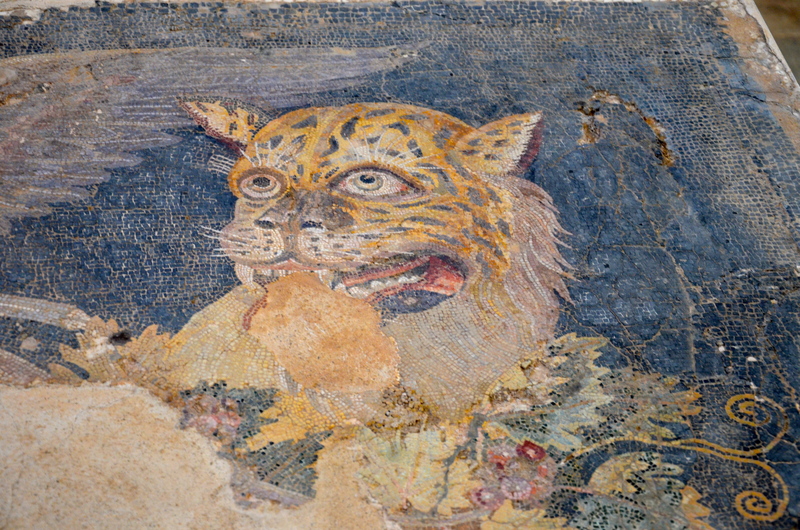 Once you have mastered this, there are classes in mosaic portraiture, carpet-floor mosaic technique, 3-D mosaics, micro mosaics, and mosaic restoration. More information about the school can be found here. In the summer, on Tuesdays and Fridays there is a special night time festival called “Mosaico di Notte” (Mosaics by Night). San Vitale Basilica and the Mausoleum of Galla Placidia are open and guided tours are available of the archeological sites of the Domus of the Stone Carpets and the Rasponi Crypt-Roof Gardens. You must book in advance for these sites. Concerts in the forecourt of the Church of Santa Maria Maggiore and poetry readings in front of the Basilica San Francesco are part of the summer festival. There is also an International Festival of Organ Music. You can get more information on these events here. 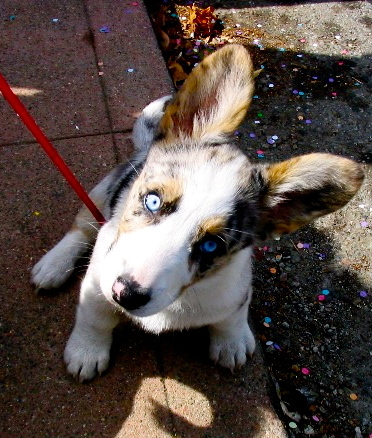 Here’s the thing about baby corgis, nobody believes they’re a real kind of dog. 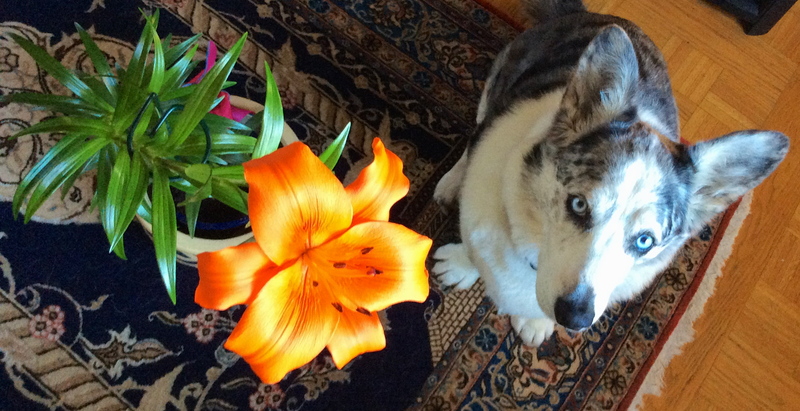 Do not get a corgi puppy, especially a blue merle cardigan corgi, if you value your privacy. People will jump out of their cars to talk to you about your dog. First, they will ask what kind of dog he is. Then, they will tell you that he is not a corgi. They will tell you he is an “interesting mix.” Sometimes they propose that he is an Aussie-Basset or maybe a husky mix. It is best just to nod agreeably because you will never convince a doubter that he really is a corgi. 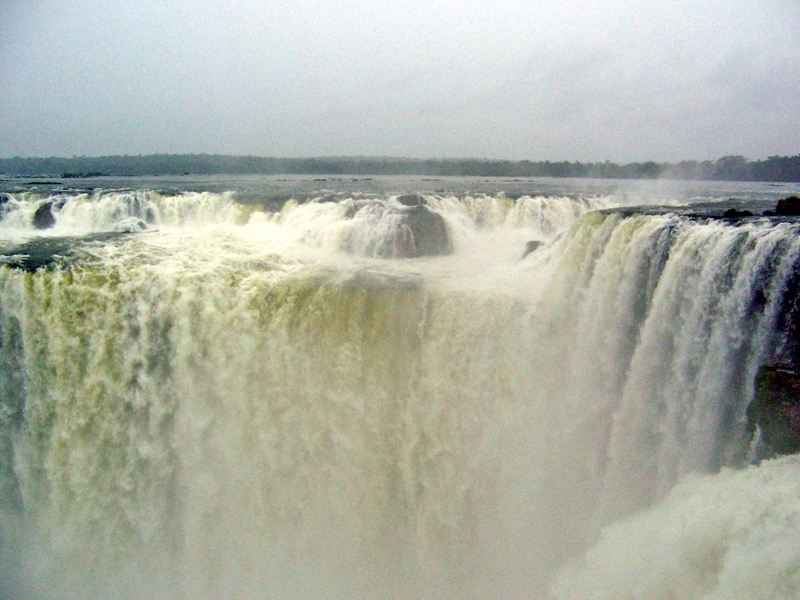 When Eleanor Roosevelt saw Iguassu Falls, she reportedly said, “Oh, poor Niagara!” I can just picture her there in the steamy subtropical jungle with her good wool suit, sensible shoes, gartered hose and pith helmet. 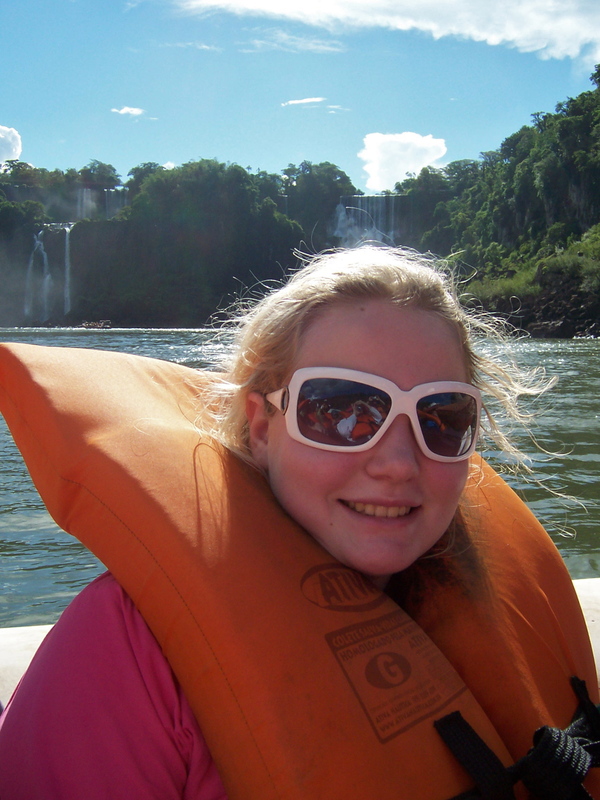 In fact, Iguassu Falls is spectacular. The 275 cascades tumble down through black basalt and deep green jungle around a 1.7 mile horseshoe gorge. 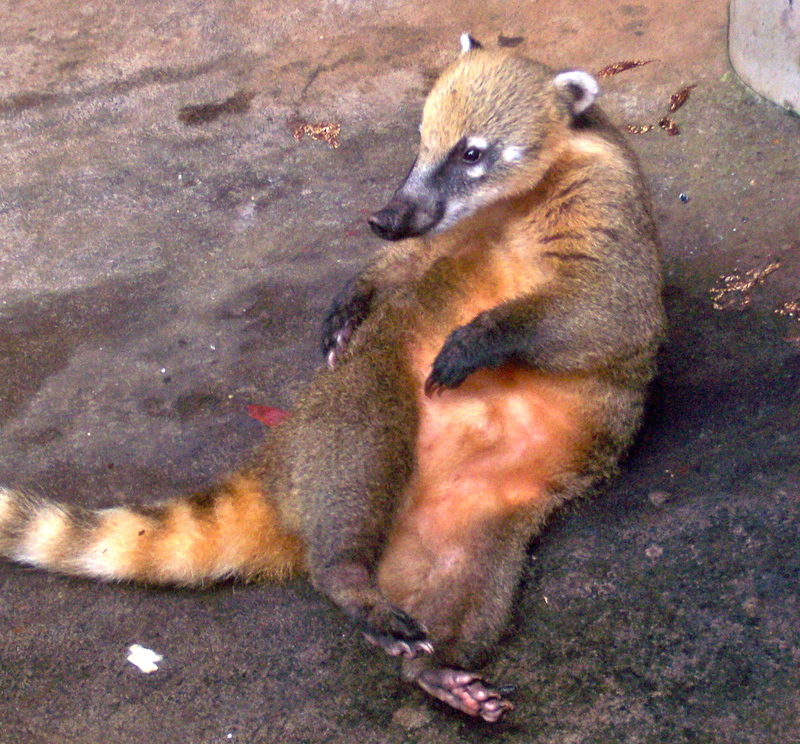 You can usually spot monkeys, coatis, and capybaras. 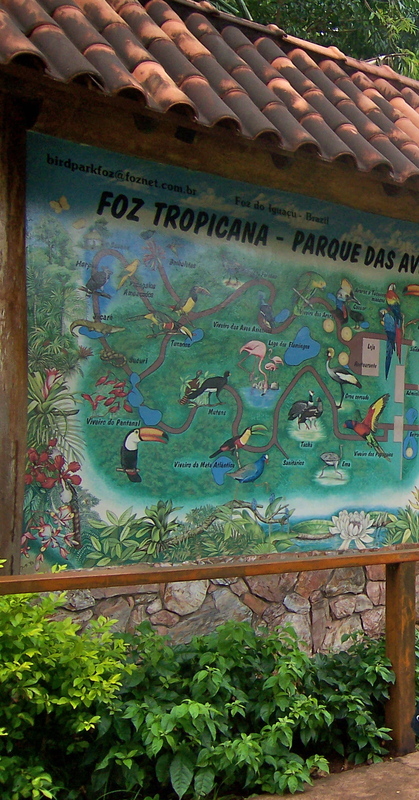 You can hike through the jungle, ride on the river, and march out over the falls. And everywhere, it is so loud! 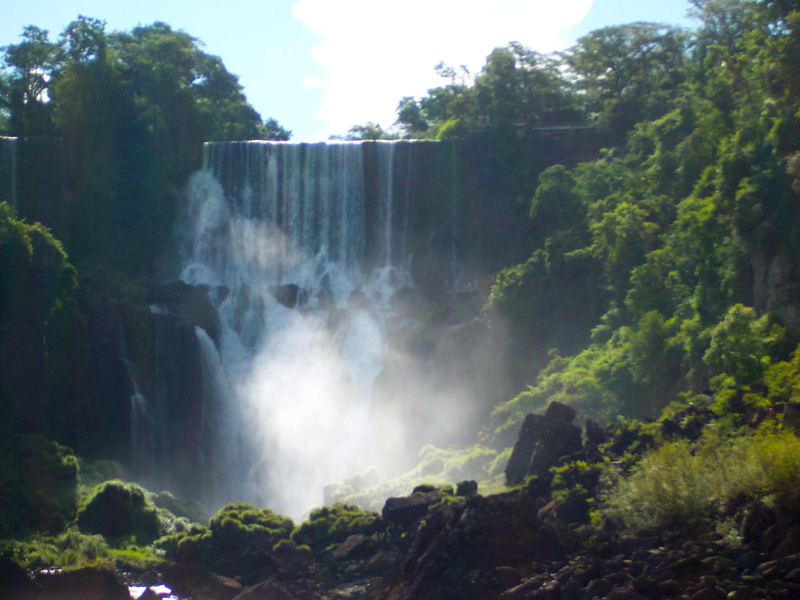 At one time, the lovely pink Cataratas had a beautiful view of the falls. Trees doing what they will, the view is now obscured from the building, but you can see it if you just walk across the driveway. 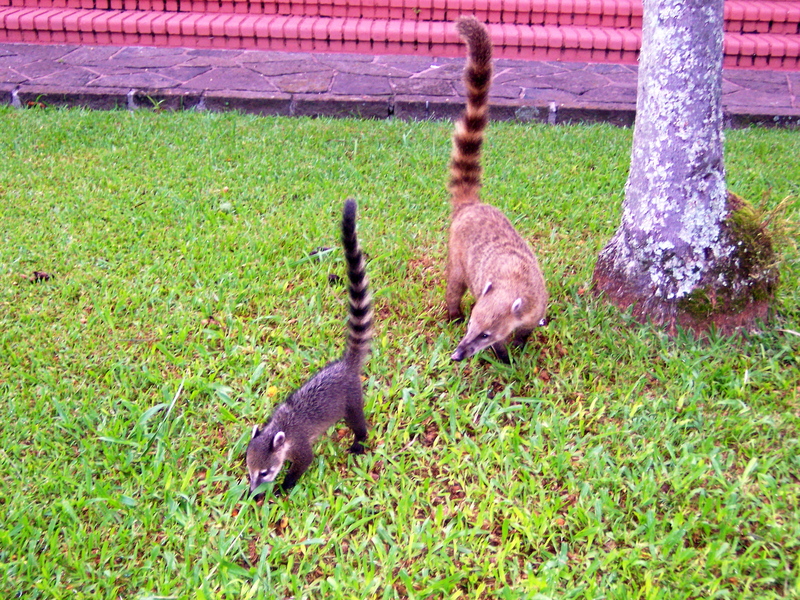 Even without the direct view, the hotel is beautiful with Portuguese Colonial architecture, carved wooden door frames, a gorgeous pool, a Paraguayan band, and lots of local coati. The restaurants in the hotel—one more elegant, the Itaipu, and one that’s casual, the Ipe Grill, by the pool—are excellent. It’s a good thing they are since there is absolutely nowhere else to go. In fact, visitors are warned to avoid stepping too far out of the perimeter during the nighttime because, after all, the hotel is nestled in the jungle full of jaguars, pumas, snakes, and stinging insects. We were there for the full moon, but as it happened, also a full rainstorm, so the full moon night viewing of the falls usually offered by the hotel was canceled. 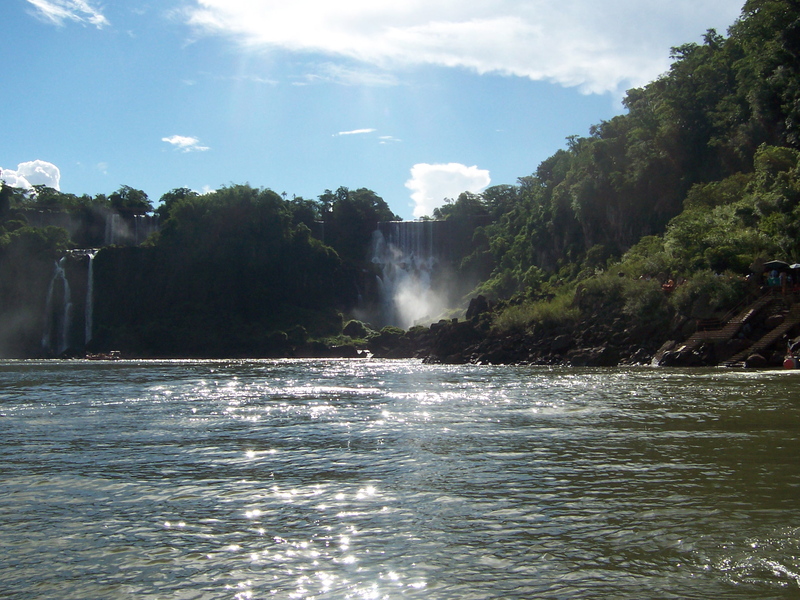 A major advantage of staying at the Cataratas is that you can visit the falls early. By the time the tour buses arrive, you are sitting by the pool drinking out of a coconut. and feel the river rushing underneath you, around you, almost over you. This is the very best view of the falls. Conveniently, if you need it there is an elevator to go back up. This trail is open from 9 a.m. to 5 p.m. daily and there is an admission fee. TAKE A RIDE IN A RIB—a rigid inflatable boat with twin outboard motors. You have to hike down a trail through the jungle to the river, an interesting walk in itself punctuated by sightings of giant butterflies. 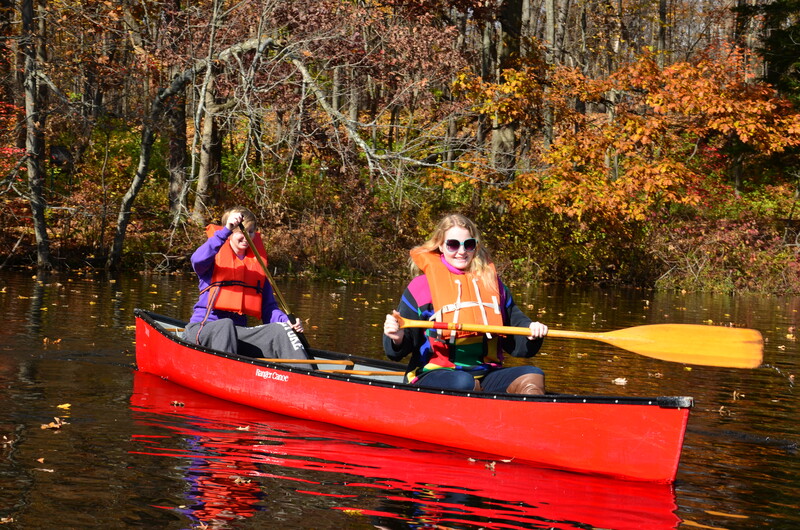 Once at the river’s edge, you don your life preserver and board the boat. Then you go on a very wild ride. The drivers are very skilled because they must maneuver the RIBs upstream over river rocks against a churning 20+ knot current. 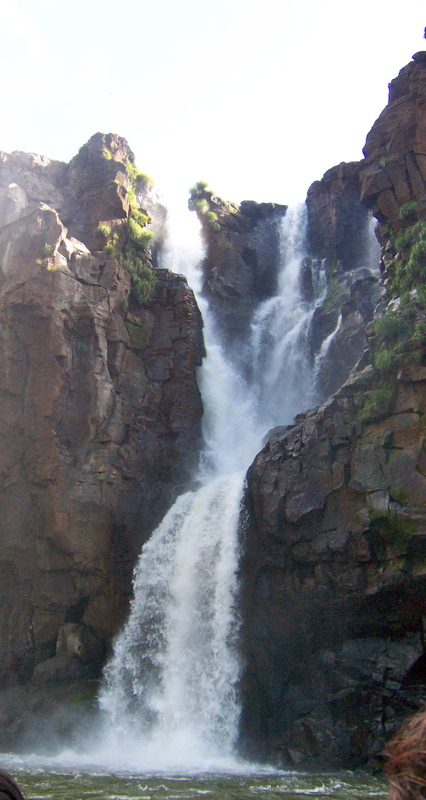 The boats are not allowed within a certain distance of the main falls, but that doesn’t mean they don’t go to the smaller falls and dunk you under the cascading water. And dunk you again. And dunk you again. Since it is quite hot and steamy, this dunking is more than welcome and very fun. The water is redolent of the hundreds of miles of jungle above. Highly recommended. 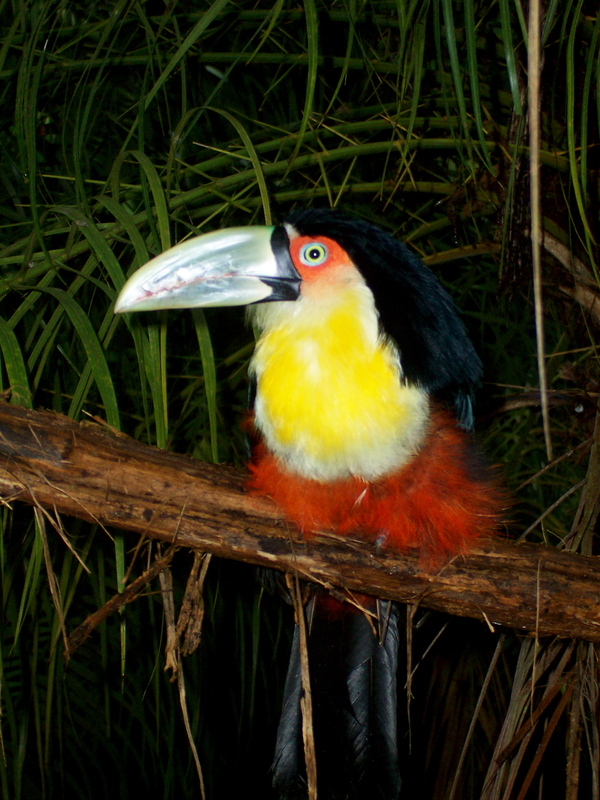 VISIT THE BIRD PARK (PARQUE DAS AVES). 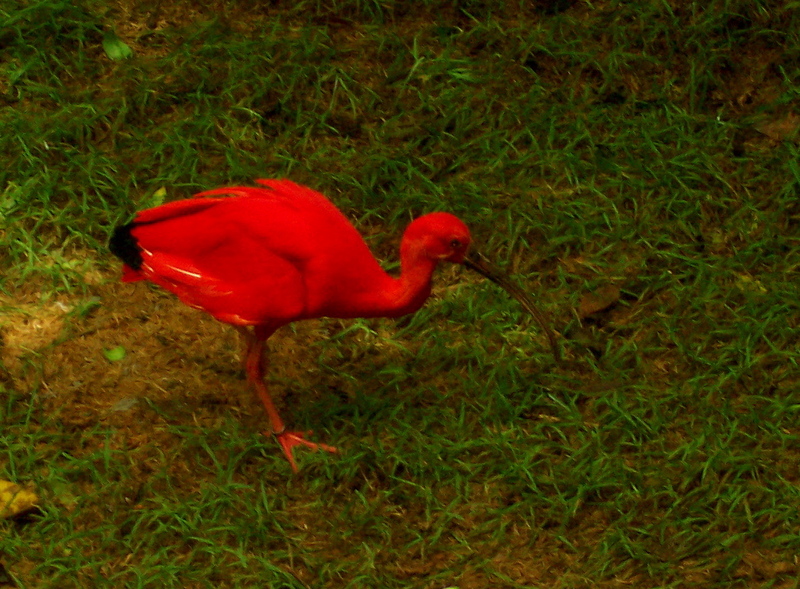 All those birds you’ve wondered about turn out to be real. 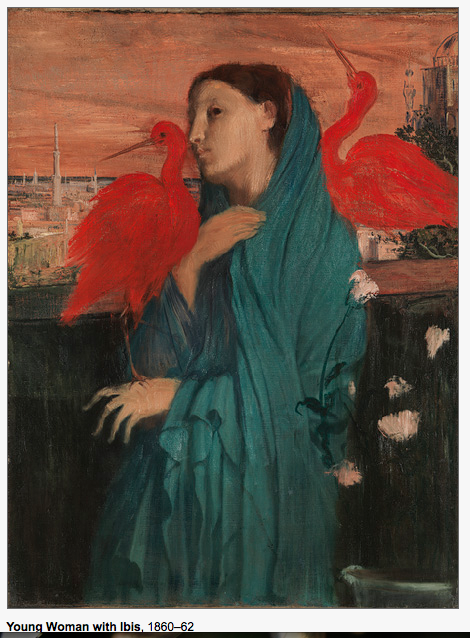 You know that old postcard of the Degas painting from the 1988 Met show of a woman with the two startling cadmium red ibises perching on her wrist and shoulder? They’re there! 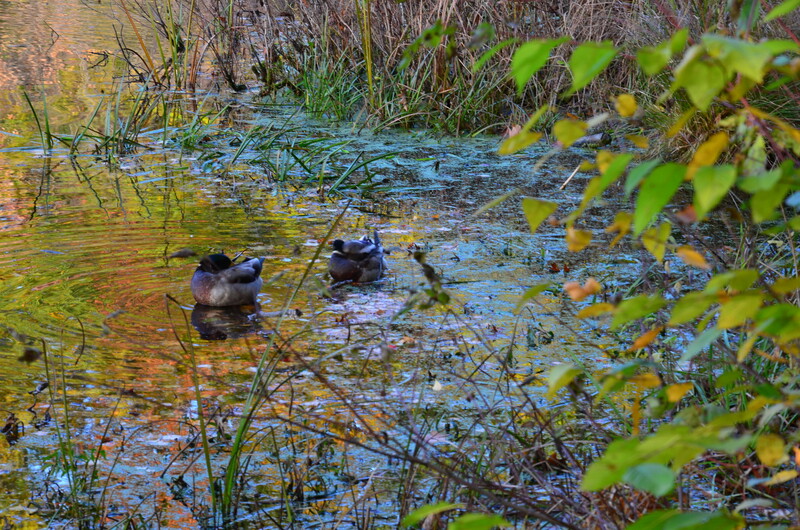 Where on Earth did Degas find them? And they really are exactly cadmium red, that color so favored by Degas for its dependable surprise. At the park, look up! 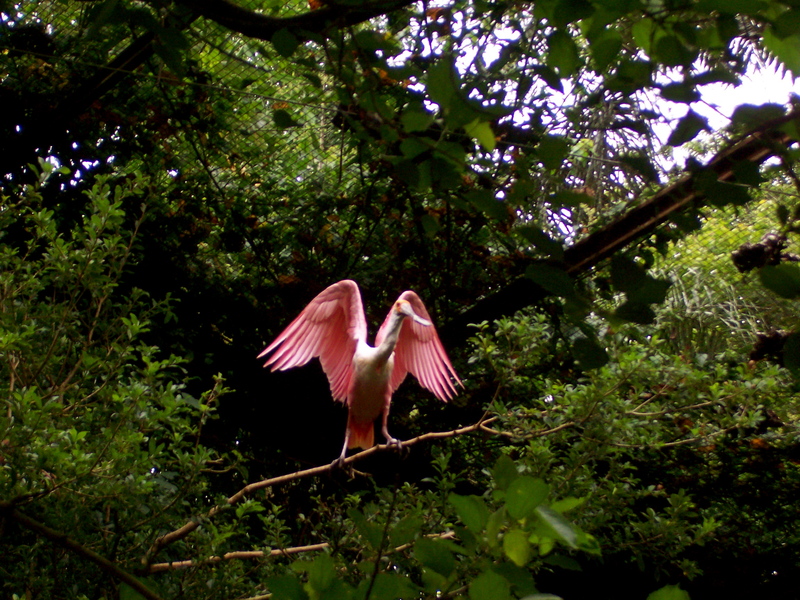 The roseate spoonbills balance above you. VISIT ITAIPU DAM. 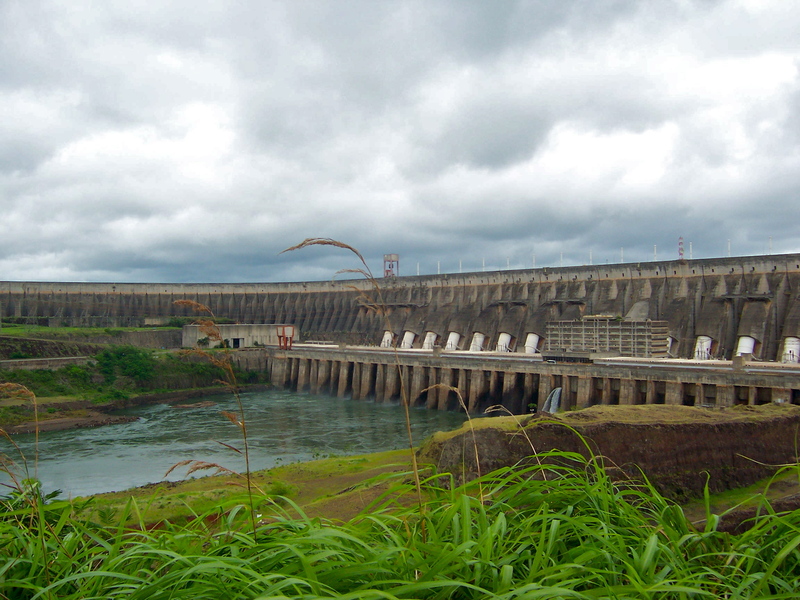 If you are a fan of engineering, you can visit Itaipu Dam. You watch a movie about so many happy birds and picnicking humans that it makes you think, “Wow, this must be some big environmental disaster.” Well, it is, but still it is impressive. 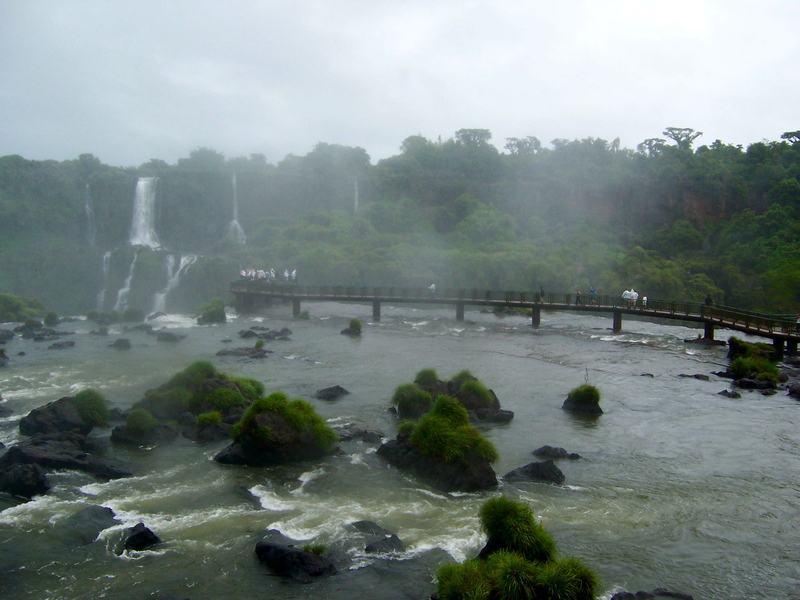 You ride a bus out around the dam and even visit Paraguay in the course of the tour. This was our reaction, however. From Brazil, you can drive across to Argentina. Although the backup at the border can be long, private guides seem to have a way of bypassing much of the line. 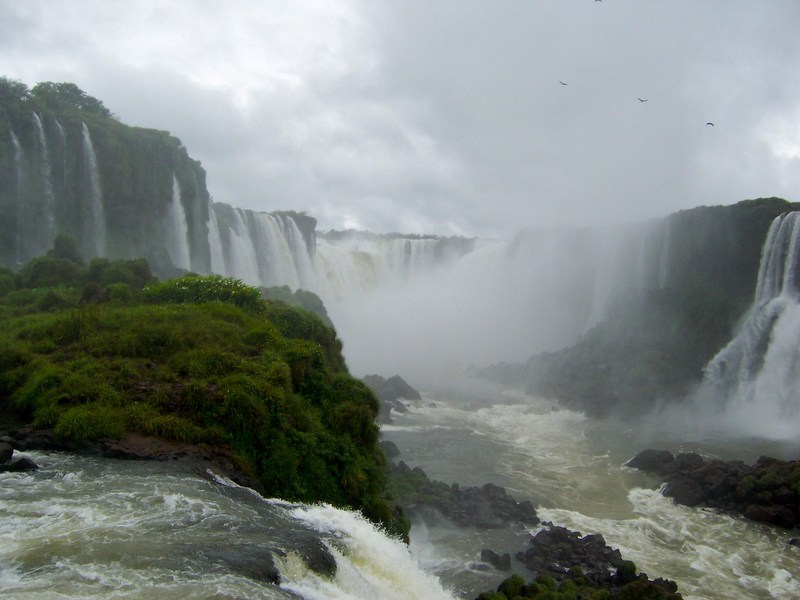 The Argentina Iguazu National Park is open from 8 a.m. to 6 p.m. and admission is charged. Once you enter the park, take the Jungle Train to a network of upper and lower circuit trails covering many elevations and waterfalls. The lower circuit is thought to offer the best views. From the bottom of the Salto Bossetti, you can walk down some stairs to catch a free ferry to San Martin Island. We didn’t do that on our visit because the weather prevented the ferry from operating. 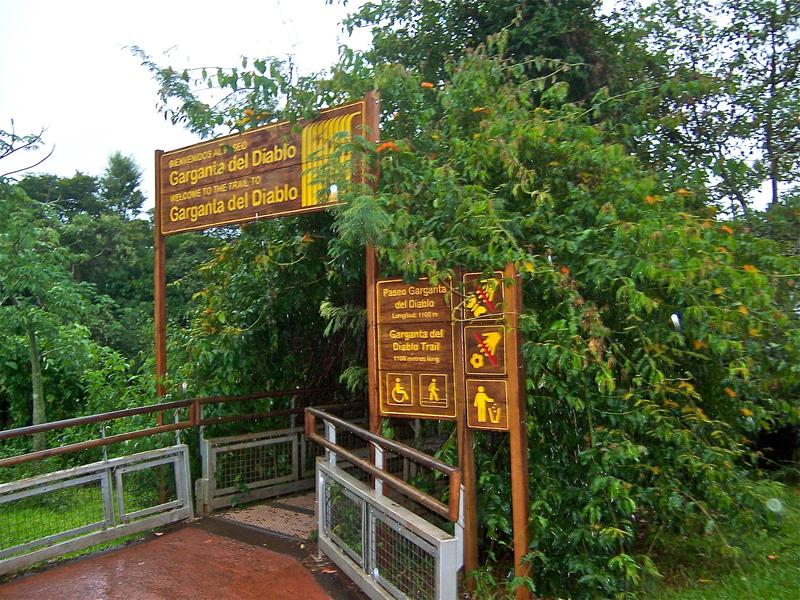 After the hike, you can take the train to the main event: “La Garganta del Diablo” — The Devil’s Throat. We huddled under our plastic rainwear and made another terrifying crossing of a very long walkway over the rushing river to the viewing platform built out over the top of the falls. (How do they build these things anyway? Turn off the falls?) 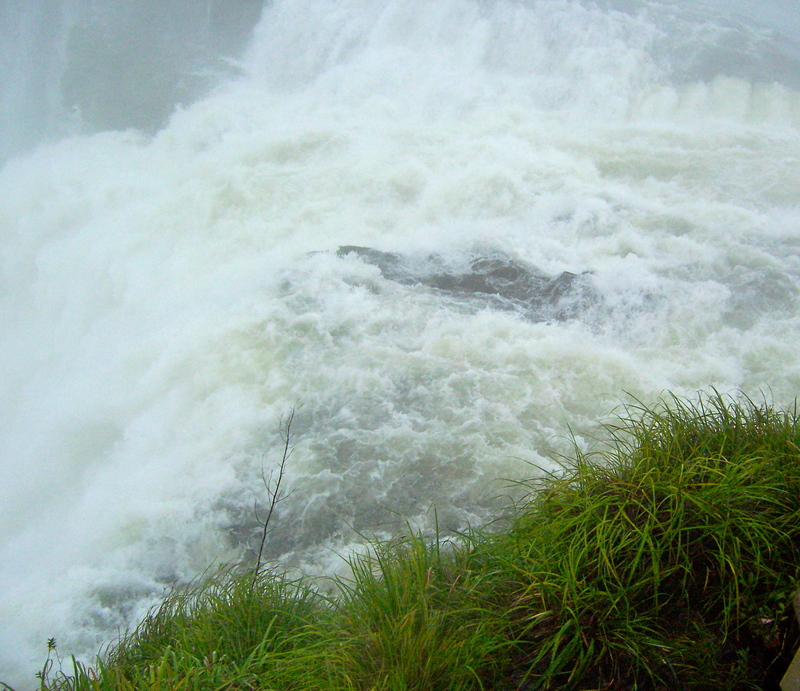 Arching over the railing to see and feel the falls rushing down is a dramatic, powerful, and vertiginous experience. You can’t really photograph it without a helicopter. Soaked to the bone, on our way out of the park past the Visitors Center and cafe, we spotted some cute capybaras. Alas, I wasn’t quick enough getting my camera out from under my raingear. There are ways to enjoy Iguassu Falls without being fit, but if you have the chance, go while your knees are still with you.